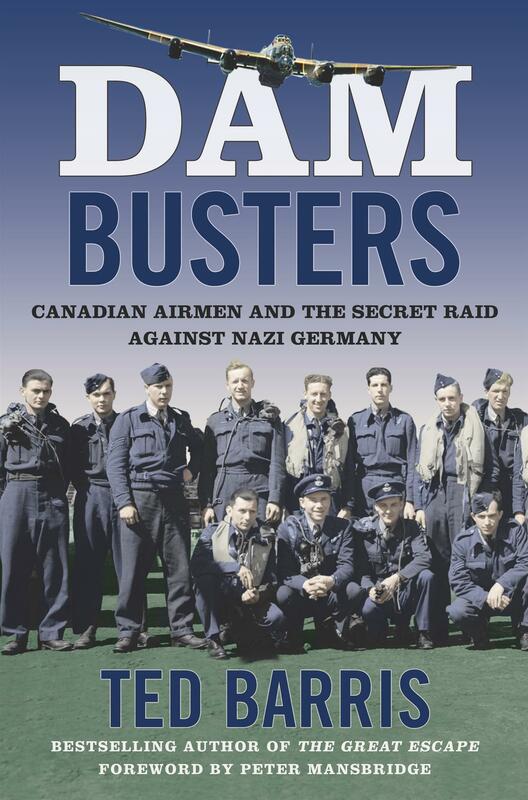 The Rotary Club of Alliston members, family and friends are invited to a special evening at the Base Borden Military Museum on Monday, April 29th at 7pm. 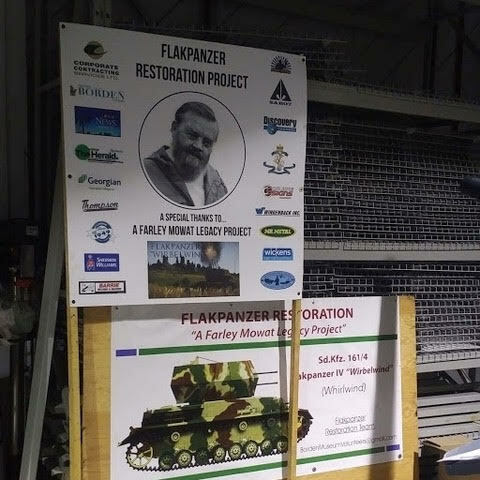 The museum and some dedicated voluteers are going to show and tell us about the Flakpanzer Restoration Project they are working on. All members are welcome to bring family and friends to the event. We will be able to climb inside some of the tanks on display so get your cameras ready. Should be a really fun and informative evening. This event was suggested by Rotarian Jack Van’t Spyker. Jack has provided some interesting background information HERE. More details about the event to follow in the next few months. 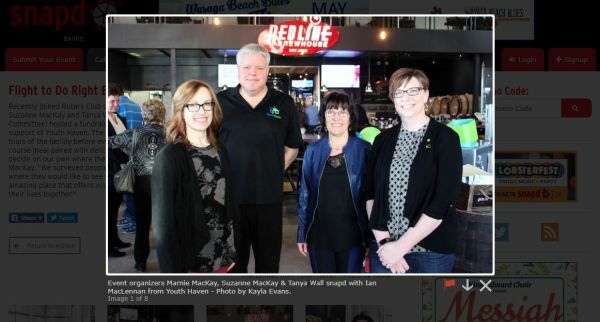 The Newbie Committee invited Lucy Gowers, Executive Director of Youth Haven, to speak about the many ways their organization supports youth experiencing homelessness in South Simcoe. If you are looking to make a contribution to such a wonderful service, please visit their website to find out how you can help. Also mark your calendars for the Flight to Do Right beer pairing event! Have fun while supporting the many youth that require shelter in our community. Proceeds will be going to Youth Haven. 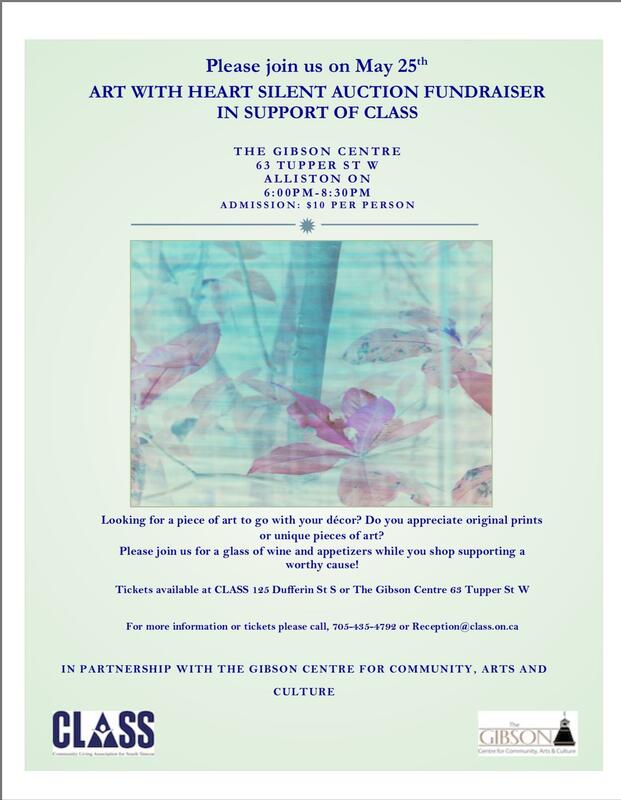 The Rotary Club of Alliston is pleased to support CLASS. You can support this organization by attending their Art with Heart Silent Auction Fundraiser May 25, 2018. See the poster for more information. The annual golf tournament for the Community Living Association of South Simcoe is being held at Nottawasaga on 15 August. This is their major fundraising event of the year, which has in the past produced down payments for new group homes to serve intellectually disabled residents of New Tecumseth. This year, their goal is the acquisition of a wheelchair-accessible van. Please help us help CLASS by registering a team or volunteering to help with the tournament. Please contact Rotarian George Scott if you can help. The Rotary Club of Alliston is pleased to support the Darling Bequest- Habitat for Humanity 2018. 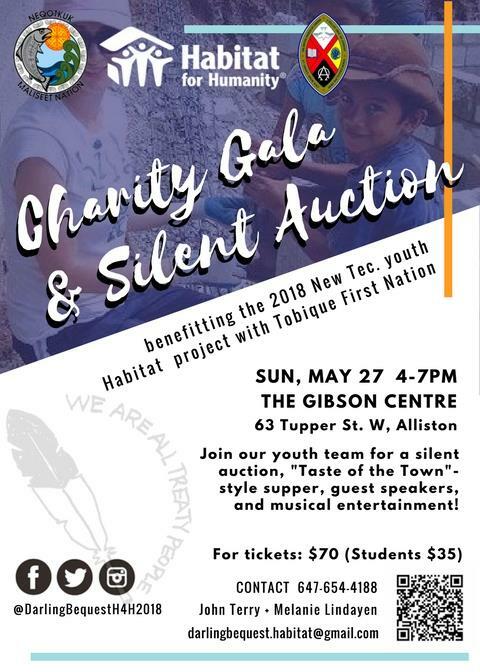 You can support this endeavour by attending their Charity Gala on Sunday May27, 2018. See the poster for more information. Co-President Maureen presents a cheque to CONTACT staff, Emily Harrison, Executive Director and Jennifer Fleury, Housing Access Worker to support Housing First Program. 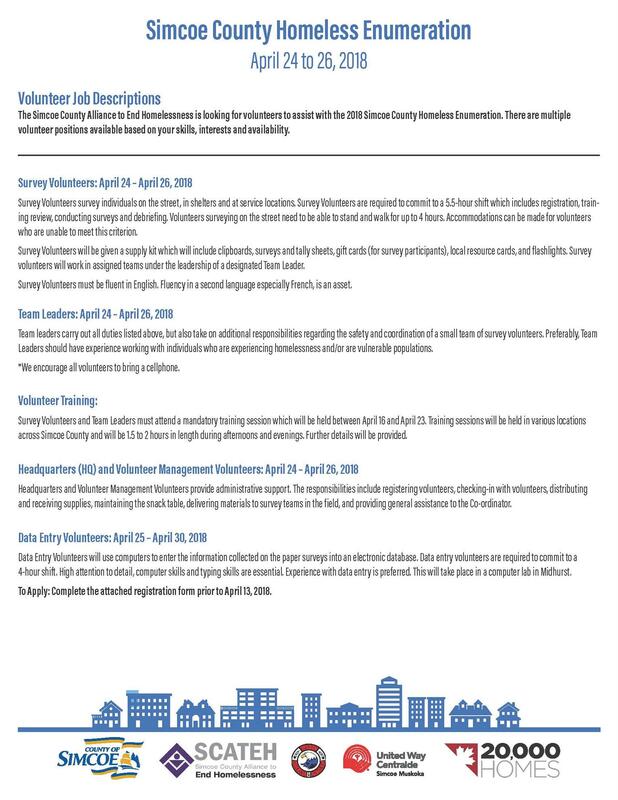 Contact are also looking for volunteers to help with the upcoming Homeless Enumeration program in Simcoe County. 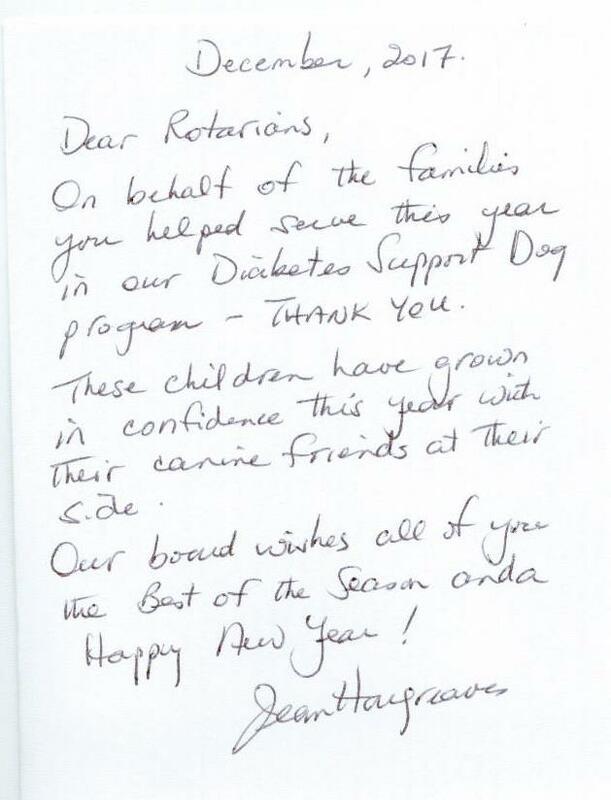 Here's a lovely Thank You letter from Sweet Charity to the Rotary Club of Alliston for their contribution to their Diabetes Support Dog program. Below is a tidbit of information on what the program is, and how greatly it impacts the children taking part. What is a Diabetes Support Dog or DSD? A Diabetes Support Dog is a dog trained to provide emotional support and companionship to children and youth with Type 1 and Type 2 diabetes. These dogs will accompany their Friend for Life to medical appointments and hospital visits in order to provide the child/youth with a distraction from procedures, and help to mitigate their feelings of anger, frustration, and alienation. Diabetes Support Dogs provide unconditional love and create a sense of purpose while promoting attention to self-care and responsibility to care for their Friend for Life. A group of hardy Rotarians, friends and families braved the cold and windy night so they could share a cup of hot chocolate around an enormous bonfire. Big thanks to all who attended the 12th Night Celebrations in Alliston. The firefighters who volunteered to start the fire and stayed to the end to make it safe. Especially the hardy families who came out and had fun. 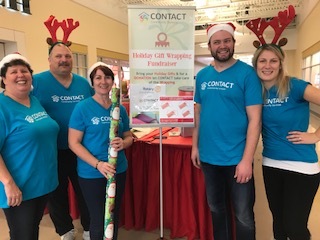 Rotarian Darlene Hunter, Contact volunteer Mary Hook and Rotarian Sue Leach at Tanger Mall wrapping a very large present together to raise funds and awareness for Contact. Thank you to all the Rotarians who took the time this busy holiday season to help! Rotarian Irene Byrne and other Contact Volunteers on the last volunteer shift before Christmas. 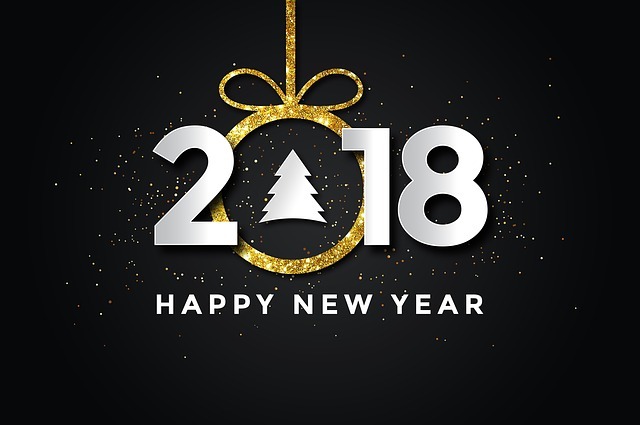 From all Rotarians, Happy 2018! Let's make this year an amazing one! As you well know the next Rotary International Convention is being held from June 24 through June 27, 2018. Rotary along with six supporting districts and Toronto Tourism are pulling out all stops to make Toronto one of the best and most memorable Rotary Conventions ever. As of December 15 (that is this Friday) the registration fee will jump by $100 US. Go to http://www.rotary2018.org to register today. For those of you travelling some distance to Toronto 2018 please note that the Host Hospitality registration is now open and there are still spots available. This is a tremendous opportunity for fellowship and I cannot recommend it enough. If you really want to be in the convention spirit, go to http://www.rotary2018.org and order some Toronto 2018 clothing. We have shirts, hats and even socks! The Host Organizing Committee have organized three terrific parties. All 3 HOC Ticketed Events have limited capacity so register today. Also keep in mind that even if you cannot make it to the Convention itself you can still go to the HOC Ticketed Events. You just have to go to http://www.rotary2018.org to sign up for Host Hospitality or the 3 great HOC Ticketed Events. We we are a go for tonight. Dress warm. Fire starts at 6:30. The Rotary Club of Alliston, the Firefighters of New Tecumseth and The Town of New Tecumseth invite people of all ages to joi n us at the Rotary Pool parking area in Riverdale Park, Alliston for an evening of family winter fun on January 5th, 2018. The huge bonfire will be lit at 6:30 pm. 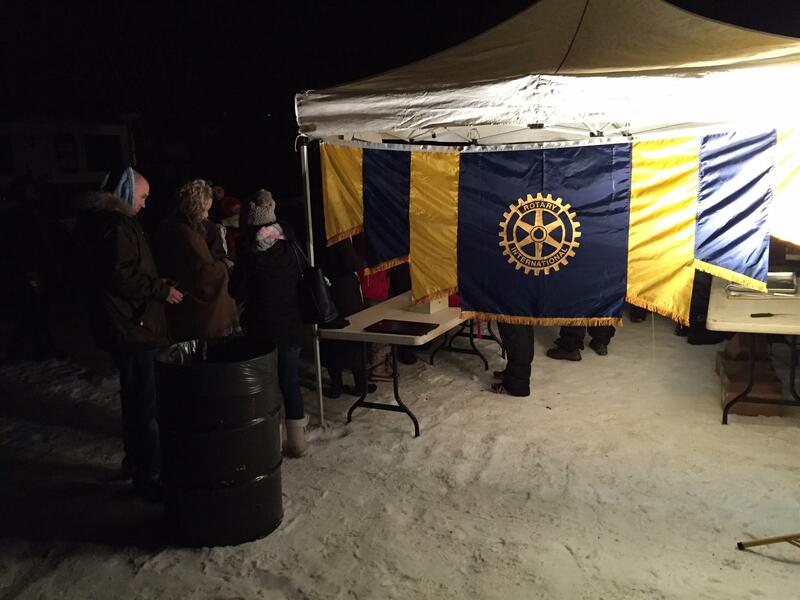 The Rotary Club of Alliston will be selling hot dogs and cups of hot chocolate for 25 cents. You will not find a better deal in 2018. Hot dogs provided by Country Meat Cuts and hot chocolate provided by Tim Hortons - Angus. You can help by dropping off your Christmas tree for the bonfire at the Rotary Pool Parking area on or before January 4, 2018. Parking access at the site will be limited to emergency service and people with limited mobility. Please park at the ball diamonds and the pavilion on Fletcher Crescent. This is a fun evening for the whole family. Last night was the Rotary Christmas party! - I'm posting a bit late It was a lot of fun! 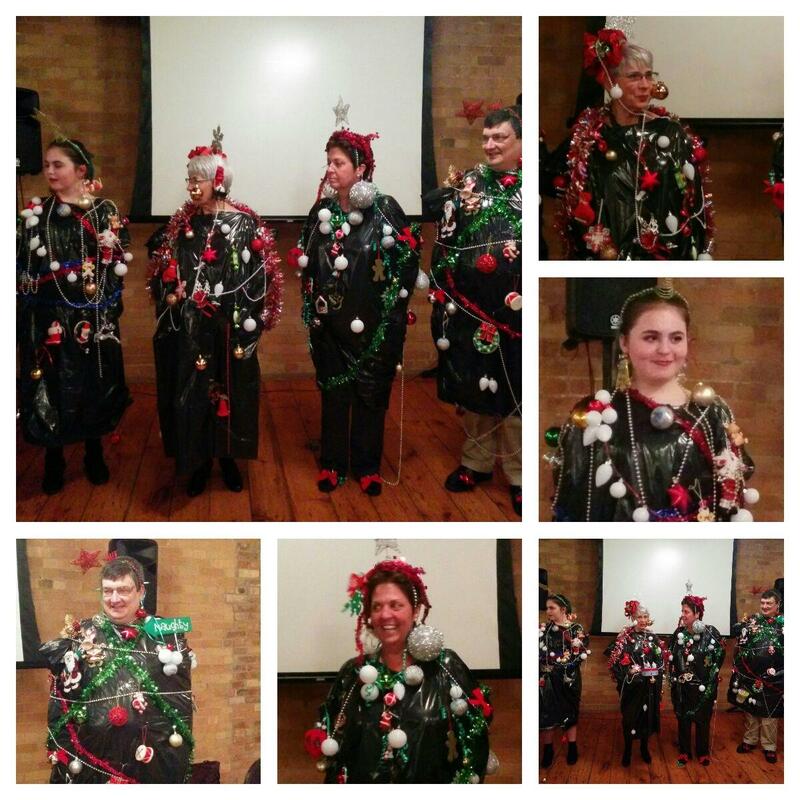 We played games, did some trivia, and decorated some Rotarian's as Christmas trees! Yay! moved by Leo Kleiss, 2 nd by Ralph Jones – carried. moved by Ed Zelinski, 2 nd by Bill Wray – carried. decide how to allocate these excess funds. Rotary Club of Alliston fund Contact Housing First Client Support Relief fund up to $2500 on a needs basis. Please help support the local food bank and bring non perishable food stuffs to the Christmas party. You can also make a monetary donation to the food bank on the night of the party by cheque payable to The Good Shepherd Food Bank and the food bank will purchase the supplies required. 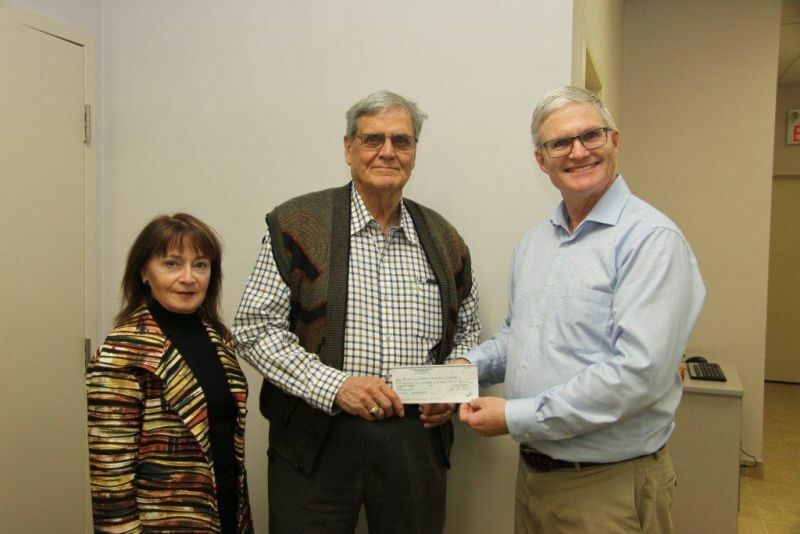 Maureen Royale and John McFarland co-presidents of The Rotary Club of Alliston presented a cheque to the Cenotaph Committee chair Mr. Hart Holmstrom in the amount $1,235.00 to further improvements at the Cenotaph located at Albert and Paris streets in Alliston. Funds were raised by a generous donation from Royal LePage RCR Reality Alliston, Frank Grey Jr. and staff, and public donations from the speaker presentation of The Great Escape by Professor and author of The Great Escape and frequent contributor to the Globe and Mail and the Toronto Star Ted Barris. Event was held on Oct 04/17 in Honda Hall at the Gibson Centre. Photo curtesy of John Heydon. Thank you to all the organizations, companies and groups that entered the parade your support and participation is appreciated. Tonight was a very WET and cold night, but the parade still happened and it was AWESOME! The star of the show!!! Santa! and our amazing Rotary float! 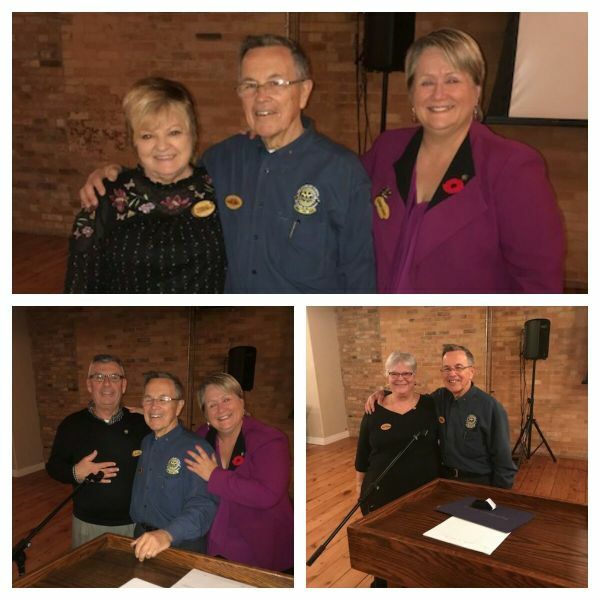 Janet Clayton, Don Smith and Patricia Middlebrook all received Paul Harris Fellowships at the Rotary Club of Alliston on Monday Oct, 30th. 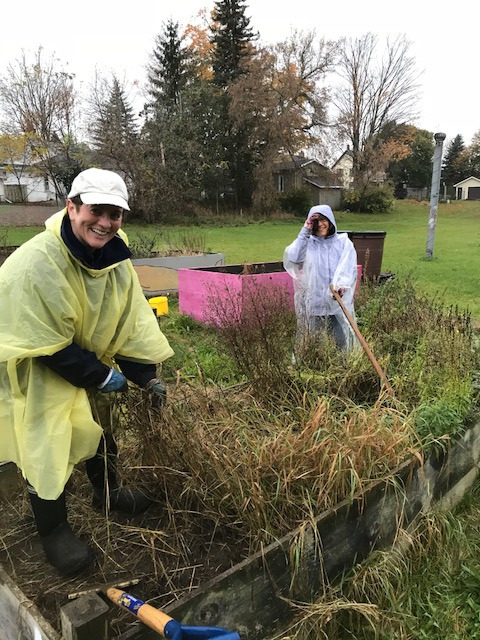 Thank you to all the folks who braved the rain and cool weather to help clean up the 24 raised garden boxes at the Alliston Community Gardens. 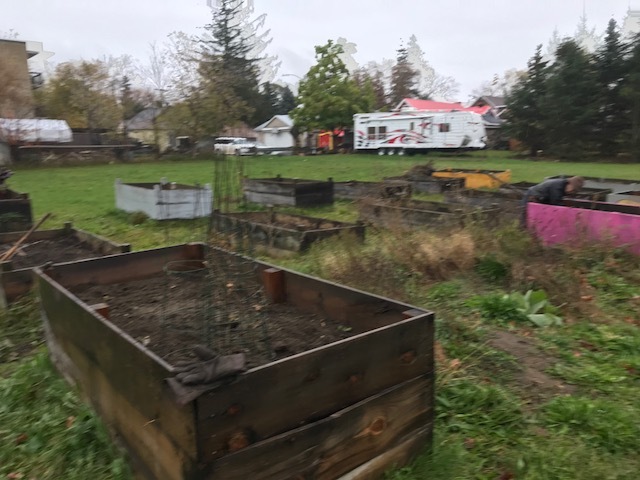 The Women's Institute and the Town of New Tecumseth supported the building of the Garden Boxes on Town land 3 years ago. The Rotary Cub of Alliston, the Women's Institute and the Town of New Tecumseth helped in the clean up of the boxes that were not used this year. 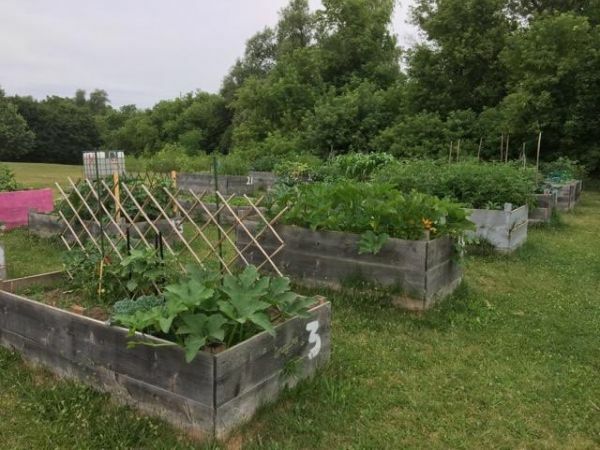 The boxes are free to residents of New Tecumseth to grow their own vegetables. Residents do need to sign an agreement with the Town to maintain their boxes. Thanks to all the Rotarians who came out to help! 1. 50% of this money is used by The Rotary Foundation to fund global grants. 3. Our club will be using both district money and global grant money this year for the Ukraine project. This grant money’s effect is to greatly increase the amount of money available for the project. 4. Thanks to all who donated at the time of the Foundation Walk. The cheques were mailed in mid-September. b. Donate on-line as President John did. c. Arrange for automatic withdrawal from your bank as Bill Wray does. d. Use Canada Helps to direct your funds as Roger and I do. As I announced at our meeting of October 16, next Monday, October 23rd at 11:00 a.m. His Worship the Maor of the Town of New Tecumseth will proclaim the week of October 23rdEnd Polio Now Week. We will raise the flag and it will fly until October 30th to bring awareness for the need to "Drop Polio to Zero". Please join the Mayor and councillors in this event and wear, if weather permits, your red golf shirt or your red End Polio Now t-shirt. We will obviously be outdoors. I'm also sending you a note President Maureen received from District Governor Neil about an e-event happening on National Polio Day, Tuesday, October 24th. This is a very interesting take on raising both awareness and funds for the polio effort. Those comfortable with all things "e" may like to participate. 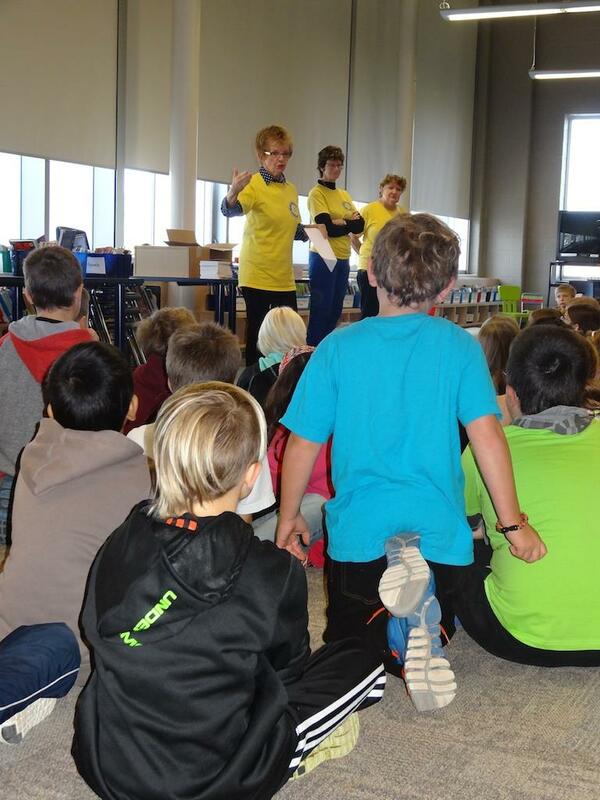 To Celebrate World Polio Day this coming Tuesday October 24th, Canadian e-clubs will march across Canada in 5 hours! You can participate in the meeting - and Make a Pledge Donation - and help Rotary accomplish its goal of eliminating polio. Of course, if your Club has an event, or you can make a District event, I would encourage you to participate in person. This effort is for the curious and those Rotarians and Rotaractors who cannot be actively involved with a local WPD event. So if you are not involved locally, still in the office, or just curious: mark your calendar and join us online 7 pm local time World Polio Day October 24. Maybe slightly different in Saskatchewan. Meetings will start at 7 pm Central and 7 pm Mountain. Pledge Link to follow next week. See you at 7 we have room for 200!!!! We had a great meeting tonight where we discussed which charities/projects the Rotary Club of Alliston would contribute funds to. Also, our team from the Ukraine has returned! They gave a short presentation on their experience and provided some gifts for the club and our club presidents. On Monday, October 23rd New Tecumseth’s Mayor Rick Milne will declare the week of October 23rd to 3oth as End Polio Now Week in New Tecumseth. 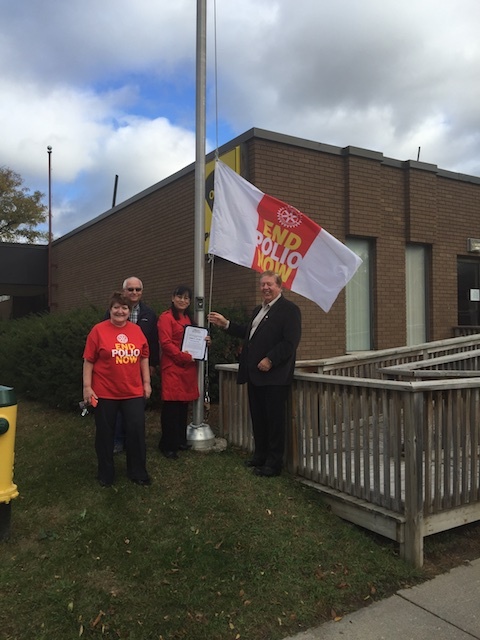 To mark the start of this special week, the End Polio Now Flag will be raised on Monday, October 23rd and will fly at the municipal offices in Alliston all that week. If you live within New Tecumseth, please join members of The Rotary Club of Alliston as we participate in this event. We in Canada are so fortunate that the question, “Mommy, what’s polio?” can still be asked by our children. Polio has not been a health problem for many decades, thanks to proof of immunization being required for school attendance. Some of us still remember members of our families and friends suffering from polio and, indeed, having to spend most of their days in an iron lung. The developing world has not been so fortunate. Today there are three countries where the polio virus is still endemic: Afghanistan; Pakistan; and now, again, Nigeria. According to recent reports, there have been nine new cases this year. We need to stop this spread quickly. In June, at the Rotary International Convention, Marie-Claude Bibeau, Minister of International Development and La Francophonie, announced another CA$100 million in the fight to eradicate polio. This brings Canada’s total contribution to nearly US$650 million. We can be very proud of our government’s significant help in this endeavour. To sustain this progress, and protect all children from polio, experts say $1.5 billion is urgently needed. Without full funding and political commitment, this paralyzing disease could return to previously polio-free countries, putting children everywhere at risk. Rotary has contributed more than $1.6 billion and countless volunteer hours to fight polio. Through 2018, every dollar Rotary commits to polio eradication will be matched two-to-one by the Bill & Melinda Gates Foundation up to $35 million a year. www.clubrunner.ca/trfc/ and follow the link to donate. For approximately $1 you can immunize a child against this crippling disease. 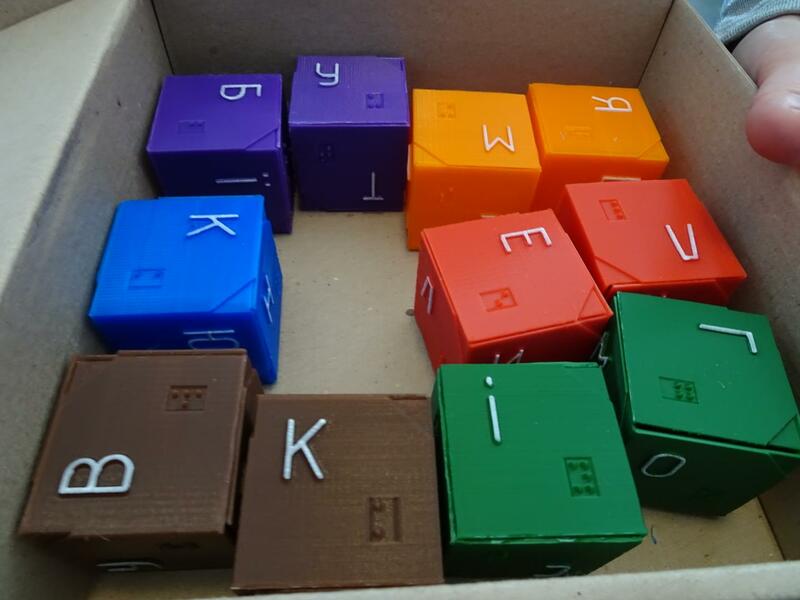 · September is Basic Education and Literacy Month. One of the Rotary Foundations 6 Areas of Focus. What is your club doing to attract and retain members? 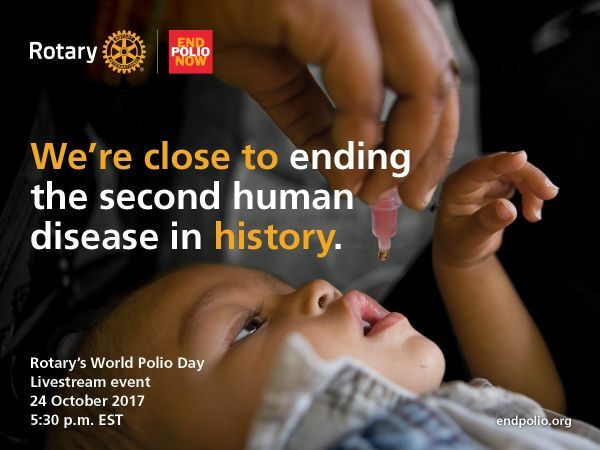 · Are you getting ready to tell the world about your club's participation in World Polio Day on October 24 and why we celebrate? · Are you contributing to the District 7070 Speakers Bureau? How about MOBI ? · A new section called Clubs In the News . A great opportunity to showcase your club and assist other Rotary Clubs. · Have you registered for Rotary Friendship Day in Oshawa on Sept 25? · Have you volunteered for Toronto2018 yet? Any thoughts on the entertainment? Break out sessions? 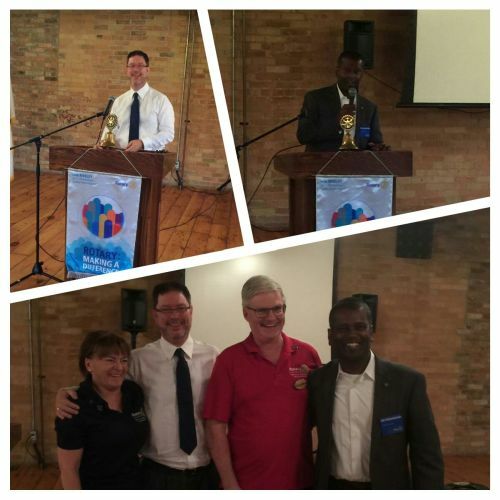 · Are you going to the Rotary District Conference? Have you registered? Have you booked your hotel room? In addition, all editions of this year's Newsletters will be available on the District 7070 website. Look at the left hand column of the District Website and scroll down. You may wish to include a copy the link to your own Club website and your own Club Facebook page. This Newsletter is a good look at Rotary in Southern Ontario and around the world and just may attract new members to your site and to your Rotary Club. We will continue to email a newsletter out to you perhaps as many as 12 times in the 2017-18 Rotary year (we will try for one a month as our goal). This is a "no charge" endeavour so that our District Rotary Dues are kept in check. Please send all of your articles to me Dave Andrews, Public Relations Chairman. It is with great pleasure that Linda Grey-Noble, a member of the Rotary Club of Toronto Twilight is on the District 7070 Newsletter Team. Linda is welcoming the opportunity to help bring a "new look" to the District 7070 Newsletter. We look forward to seeing the "New" Newsletter. Thank you, Linda, for volunteering and "Making a Difference" in 2017-18. 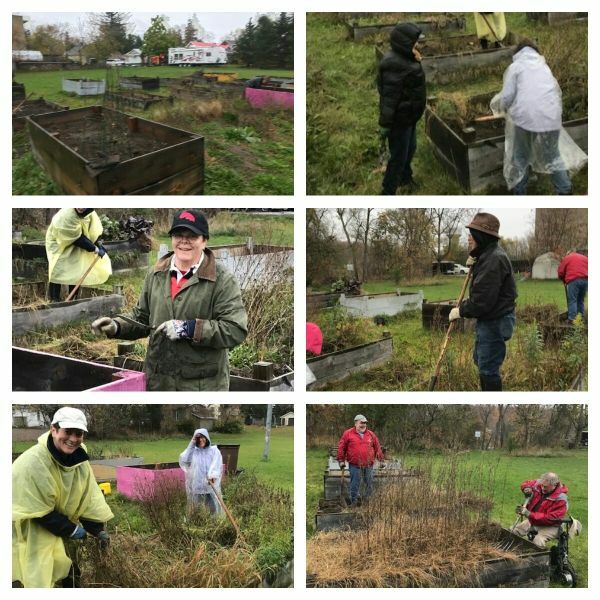 Here are some images from our work bee meeting on Monday Sept 25, 2017: A video with additional pics will be added to the site at a later time. On behalf of Paul Foster, the work bee for this Saturday Sept 30 has be rescheduled to Oct 28/17. It will take place immediately after the garden clean keep up that Sue has organized which starts at 9:00a.m. With a good turn out, we should be done weeding and able to start on the float by 11:00. Please check the calendar for more information. Rotary in action making a difference in our community! the Ted Barris talk night scheduled for Nov 06/17. I called Hart Holstrum back today. Hart said they need about $1000 to complete the mural project at the Cenotaph…. the Rotary club name would be on a plaque that recognizes all donors. The mural will be completed by November 11. Next year they plan to put a fence around Cenotaph and an underground sprinkler system. There are no estimates on that work yet. The Family Resource Centre is a not for profit and they have a charitable number. I spoke to Lynn Sorel and she said we can donate to a 1) general operational fund or 2) a program fund like childcare or support for families that have a parent deployed or 3) a new program launching in April that will provide all kinds of services to young veterans families(like respite care, support for families if they have to travel to specialist appointments, modifying homes to make accessible for injured veterans). She did say they have no immediate need at the moment. She said might be better to give the money to Matthews House or SMHF. Please email me (as Sue is away in the Ukraine) the program you would like to support. Sue will announce the recipient to the club first and then a PR presentation after the event. The auction is fast approaching! All tickets and items must be to Janet so she can finish cataloguing and get the book to the printer....and get seating numbers to the Nott. If you are thinking of donating an item the sooner it arrives here the less cranky I'll be....and the sooner your tickets are here the closer you can be to the bar!! Below you will find two updates on our pending trip to Ukraine. Please read through to the end. There are two motions that will come to the club once the team has returned and assuming they are satisfied that the project should be undertaken. These motions have been bolded. 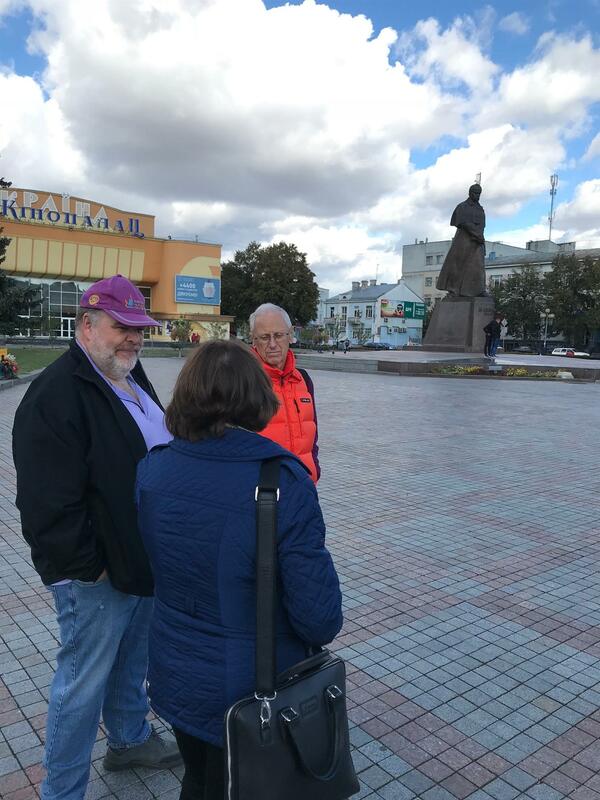 Everything is on track for the Alliston team to leave for Ukraine on Friday, September 29th and return on Thanksgiving Saturday, October 7th. All members, at their own expense, are spending two days in Warsaw on the way to Rivne. NB. The $5,000 from Alliston does not come from the 2017-18 club charitable account for funds raised. The money comes from both team money left over from Tanzania 2014 and the Ukraine team 2017 money. The team was not aware of the government grants but after a discussion we felt that we could not overlook this opportunity, since we will not have to use any more money than originally proposed for a total of $35,000. This will mean that we can do the entire project as outlined by the Rivne club originally. If anyone has any questions about the project and missed the club presentation in July, please contact Roger for further information. We all leave this Friday night, September 29th, en route to Ukraine with a 2-day stop in Warsaw. This money will come from the Alliston World Community Service budget of $6,000 CDN. The total number of toilets to be built is 120 which means the cost per toilet is $291. 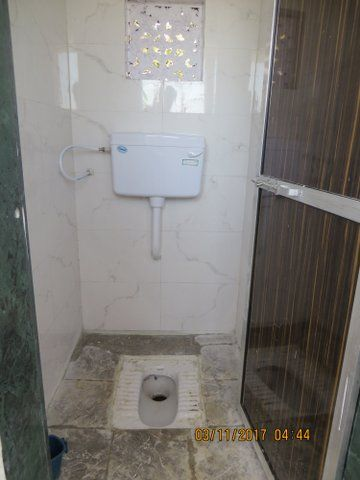 Pictures of similar toilets are shown below. 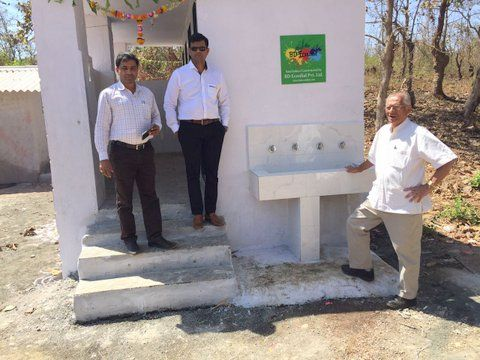 This similar problem we saw in Tanzania but these Indian schools do have access to running water. More details can be provided since we have a copy of the proposal as approved by the Foundation in our files. 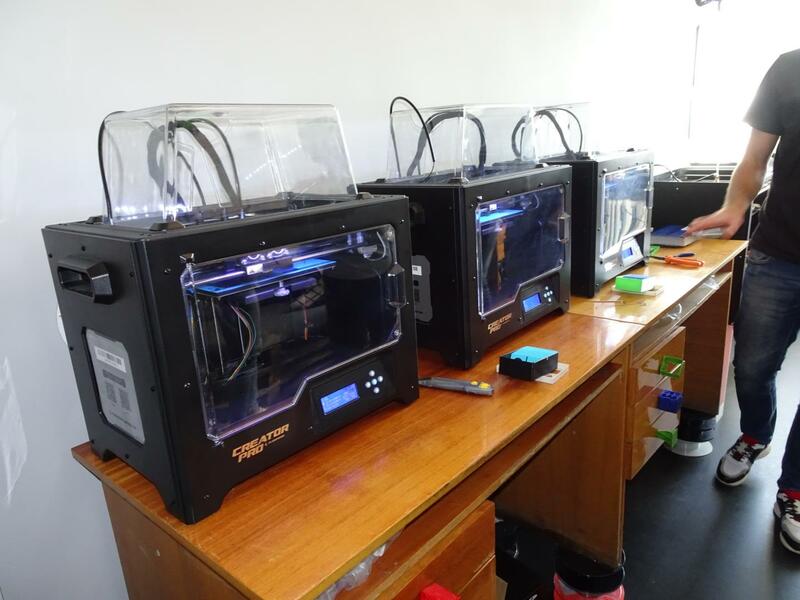 Bill, David, and I have looked over the details and are pleased to recommend the project, especially with the support of The Rotary Foundation which will multiply our money to $10,500 USD. 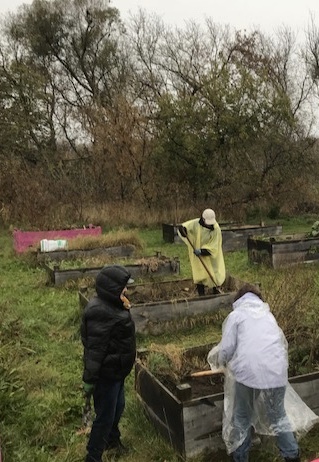 Community Gardens on Town of New Tecumseth property at west end of Elizabeth Street in Alliston. 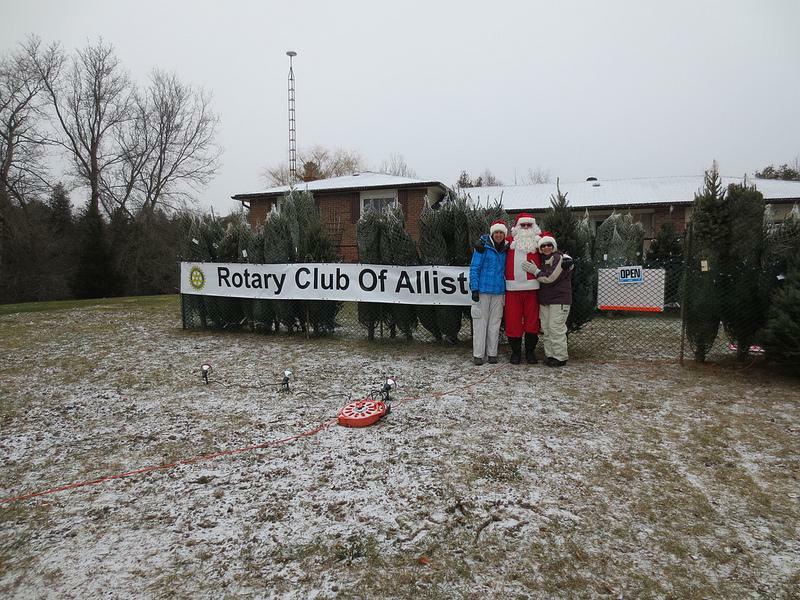 The weather wasn't very cooperative, but that didn't stop our dedicated Alliston Rotarians. Thank you to the team of individuals for making this day a success and making the Gardens look great! 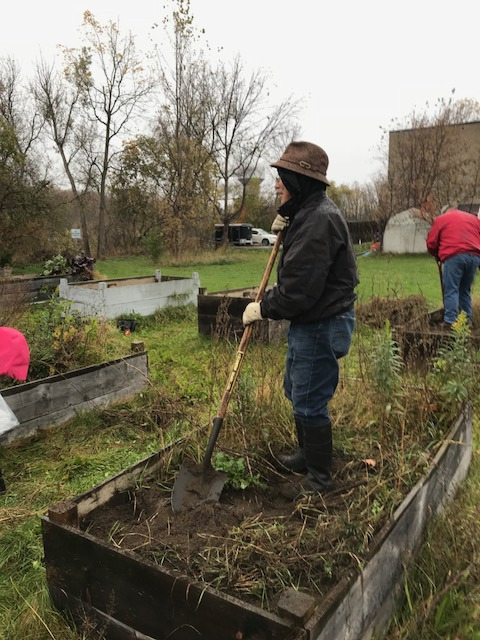 The Community Gardens in Alliston were built on Town property by the Women's Institute 3 years ago to help promote healthy lifestyle of town residents. 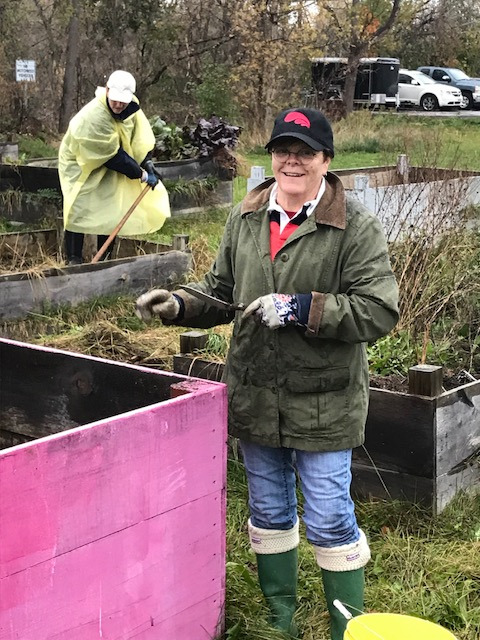 The Women's Institute's goal was to make growing your own vegetables accessible and affordable for people that live in Alliston. Many apartment dwellers in the area have taken advantage of this program for the the first 2 years, with some residents donating extra produce to the food bank in Alliston. The lack of advertising this year meant that some of the boxes were not used and became weedy. Councillor Donna Jebb has promised to get advertising out early for next season. The Town of New Tecumseth provides the land, grass cutting around the 24 raised boxes, water in large tank and road access to the site. Residents that book a box garden must sign a form to agree to certain requirements set out by the Town. No fee is charged, so it makes for an affordable choice to grow vegetables. Strawberries planted by one resident for 2017.Yum! Ralph Jones, Art Kovats, Jenny Kovats and Sue Leach walked at the 100th Anniversary Walk for the Rotary Foundation. Our Rotary Foundation is celebrating it's 100th Anniversary this year. Each year Rotarians from our district walk together to raise funds for our Rotary Foundation. 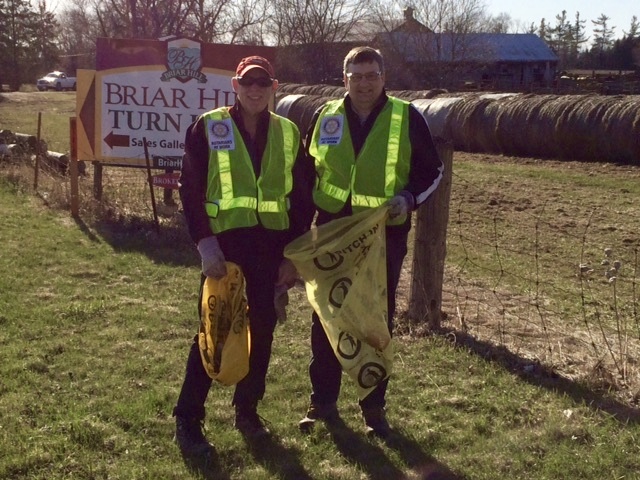 This years walk was in Whitby, Ontario and was hosted by the Rotary Clubs of Whitby and Whitby Sunrise. There were about 250 Rotarians walking this year the 5 km trail along the beautiful shoreline of Lake Ontario. The walk featured many stops along the way to highlight the work of the 2 host Rotary Clubs. Many families participated and there was a passport to get stamped and a trivia contest with questions to answer along the route. We finished the morning with a lunch and music from students in a song writing program from local schools. Over $100,000.00 was raised by Rotarians, family and friends. Congrats to the organizers for a wonderful day! We had visitors tonight: District Governor Neil Phillips, and Assistant District Governor Sam Veerasinghsm. They were both presented with our New Rotary Club of Alliston golf shirts as a thank you for their support. Rotarians – before your long weekend settles in, don't forget to mark your calendars and make plans for the following weekend! Come out and celebrate 100 years of the Rotary Foundation at the 2017 District 7070 Foundation Walk in Whitby on Sunday Sept 10. Join fellow Rotarians & Rotaractors with friends and family on Sunday Sept 10, 2017 for the annual District 7070 walk in support of the Rotary Foundation. Enjoy a leisurely walk along the beautiful waterfront trail in Whitby. (Long-range weather report looks lovely.) The walk will feature live music, local craft beer, prizes and trivia. Dogs welcome, or any other animal on a leash. A continental breakfast and lunch will be served. It's a day of awesome fun for the whole family. Doors open at 8:30 am for breakfast and welcoming ceremonies. Walk (5Km or less) starts at 10am with lunch and closing ceremonies. While a fun event on its own, remember it's a key opportunity to raise funds for our Foundation - half of which comes back to our own district in three years to support Club projects through District Grant funding. If you haven't already done so, please go to the Rotary 7070 website this week to register or click this link: Register Online. We welcome you to bring friends and family to this event, you can add them as guest through your registration. 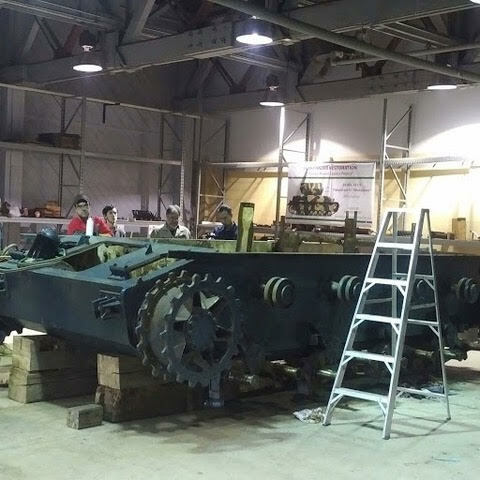 Rotary Christmas Float Construction has begun! 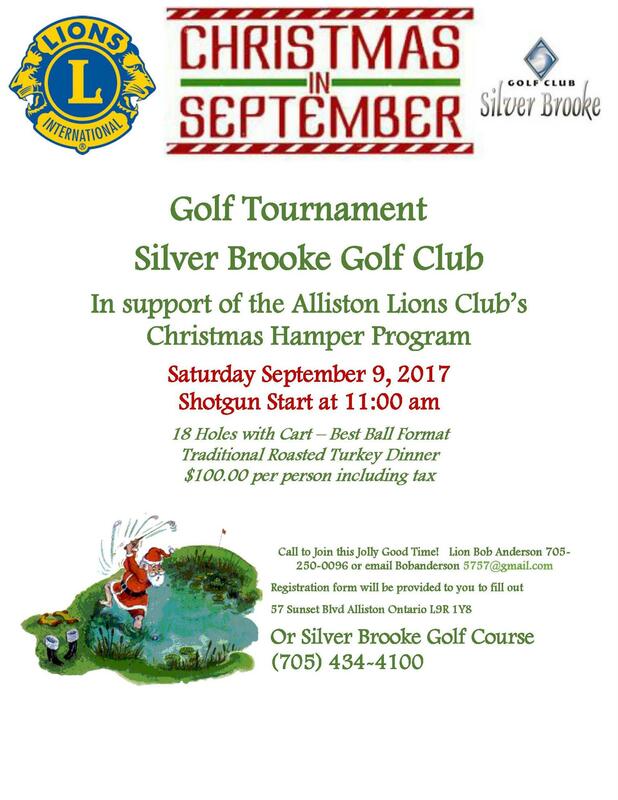 Please consider helping our fellow service members in the Lions with their Christmas in September Golf Tournament. Funds go to the Christmas Hamper Program. 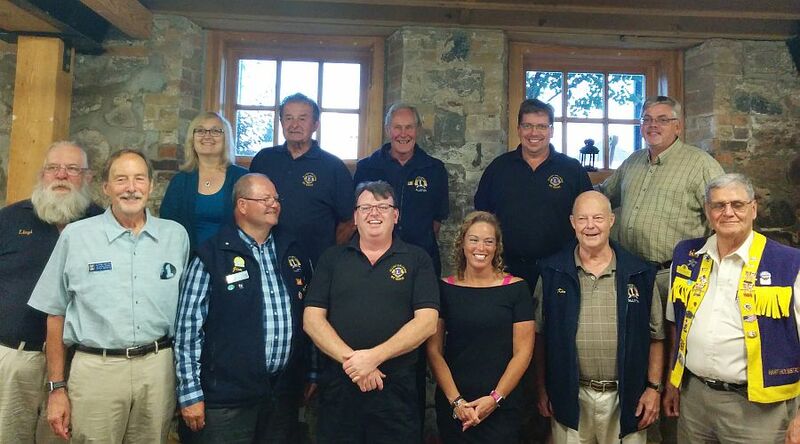 Tonight was a an opportunity for the Lions Club of Alliston, and the Alliston Rotary Club to get to know each other. It was a celebration pub night at the Gibson Centre in Alliston. The Rotary and Lions Club will be working on some future projects together. Despite threatening weather and brief downpour the 2017 edition of the Potato Festival Parade was a great success. This year's parade had a great variety of floats, vehicles, bands and entertainment. A big thanks to the organizing committee and the volunteers for another great evening of family fun. Thank you to all the organizations and businesses that had and entry in the parade. Click here for a gallery of parade photos. 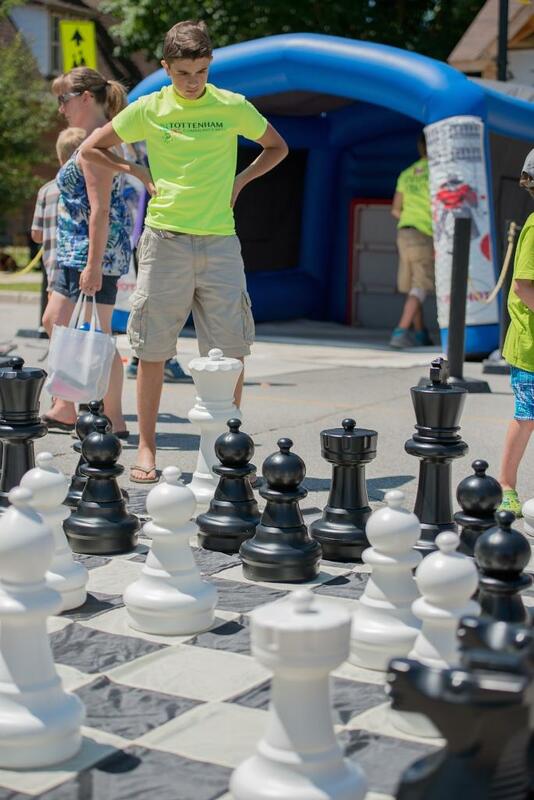 More great photos on the Alliston Herald webpage here. I hope you'll convey our appreciation to your club for its continued support of our work in the developing world. Our Amarok Society mothers are showing a lot of bravery and dedication by taking a stand for peace and education in Bangladesh and Pakistan, but it wouldn't be possible without the stand being taken by so many Rotarians across Canada and the US. It means a great deal to us that the Rotary Club of Alliston has continued its support of our operations - please pass along our gratitude, as well as that of the communities who are benefiting through your club's generosity. Friday, August 11th – 7:00 p.m.
As usual, this year’s parade is shaping up to be an exceptional event. The entry spaces are filling up fast and we are receiving new applications every day. The committee has decided to have no more than 85 entries, including commercial, non-commercial and children categories. Participants are encouraged to decorate their floats in a potato theme and to be as original as possible. The floats will be judged beginning at 6:00 p.m. and there will be two winners in each of the three categories. Look for the banners declaring the winners as the parade passes by! This year’s parade includes 8 bands, many floats with music, entertainment by the various Shriner groups, a stilt-walker/accordion player, and a unicyclist/juggler. Watch for amazing feats of balance from these two unique characters! 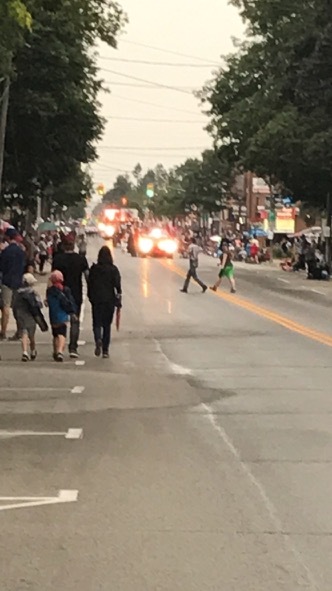 So, get ready for another exciting parade as it makes its way through the heart of downtown Alliston. What a great way to kick off yet another awesome Potato Festival! Celebrating Canada's 150th in Alliston! 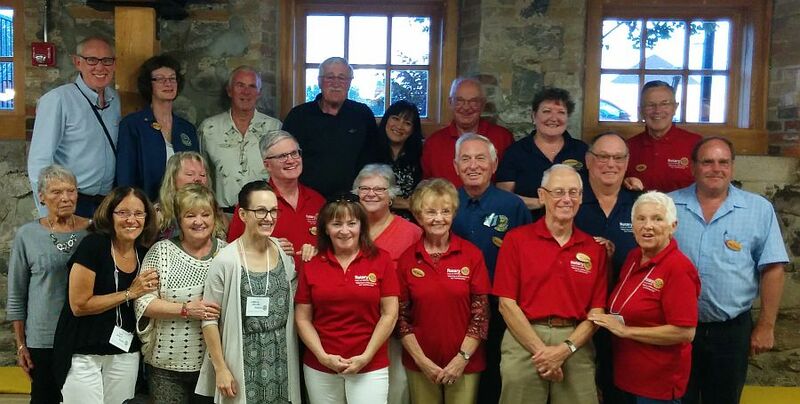 Last Monday evening, on June 16th, two new members were welcomed into the Rotary Club of Alliston. 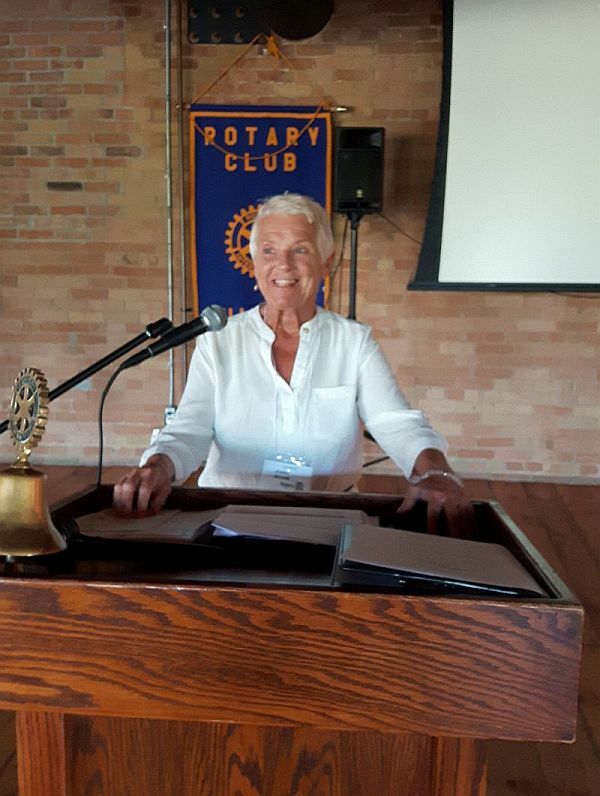 Last night, Judy Irvine gave her speech to introduce herself and provide insight to the other members about who she is and why she's become a Rotarian. 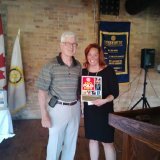 Judy is a lovely person and the Rotary Club of Alliston is pleased to have her working with them. Welcome Aboard Judy! The pod members for June are Art and Jenny Kovats, Paul Kerr and Don Smith. Monday, June 26- Changeover Night @ 6:30pm at the Gibson Centre- Partners Night- Please wear Red and White (or Canada shirts etc) to help celebrate Canada's 150th Birthday. Please register yourself and your guests. Cost is $30/member and $35/Guest. 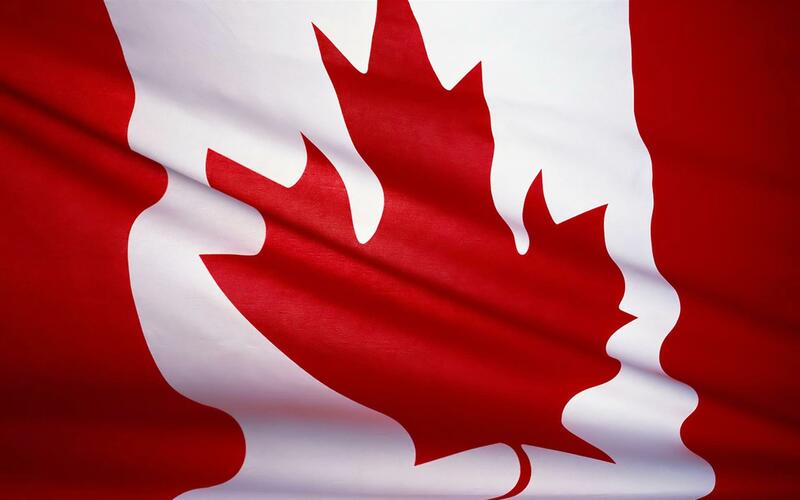 Saturday July 1- Canada Day Celebrations in Riverdale Park(near the Rotary Splash Zone)- 10am-2pm- 16 Rotary Members(4 for each hour) are needed to hand out Chocolate Milk and Rotary Beach Balls to children and answer questions for the adults. Please wear a Rotary shirt if you have one. Please contact Maureen via text, email, or phone her at 705-817-5540 if you can help that day. new fun places to go to, or new activities to try. If you have any suggestions please contact Maureen Royle. maureen.royle@hotmail.com The best ideas come from our members. Marnie McKay has agreed to take over as editor of the Rotator in July. Thank you Marnie. Maureen and John are thrilled that you have taken on this role. A huge thank you from Sue and Dave. Dave Green is looking for volunteers to join the Communications Team for the new Rotary Year starting in July. The Communications Team will be responsible for the Website, Social Media, PR, Newsletter etc. Please contact Dave if you would to be part of this team. Gala Auction- Date of Gala Auction has changed to Saturday, October 21. Jan Clayson and Dave Green asked members to get any donations to the auction asap to Jan Clayson's home. Members and guests will be able buy tickets online and register on line. Tickets will also be available at meetings and at Allways Travel. You can donate your Aeroplan Miles to the auction by visiting our Rotary Website. 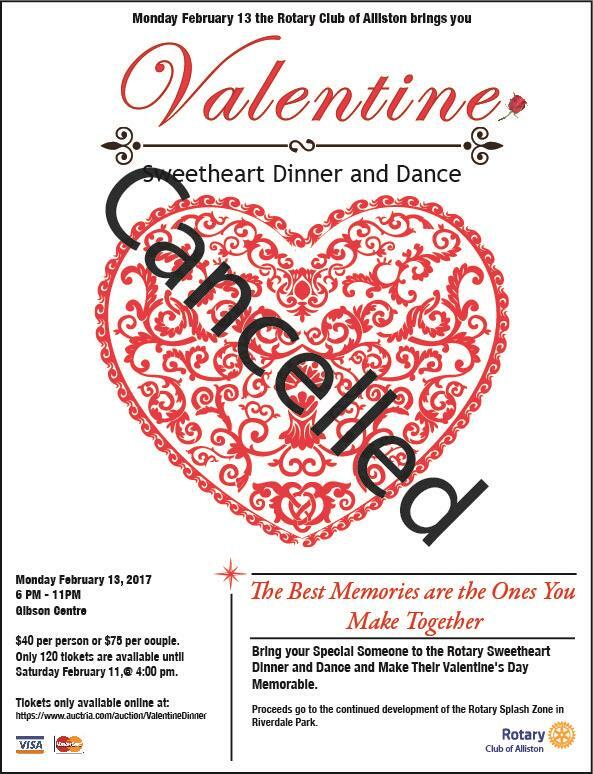 DUE TO CIRCUMSTANCES BEYOND OUR CONTROL THE EVENT HAS BEEN CANCELLED. Roger and Joan Hayward continue to make up at The Rotary Club of Anna Maria Island and helped the club celebrate their 50th anniversary on January 22, 2017. It was a fantastic evening with an all-Rotarian band and student musicians from local schools. Fifty years ago a small and dedicated group of people began this club, casual and sociable and that inclination for social activity and fellowship characterises the club to this day. 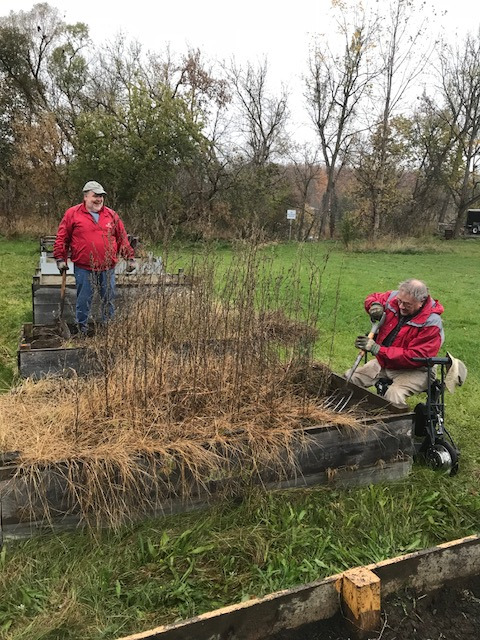 About twenty years ago the influx of visiting Rotarians and retirees swelled the ranks, especially in the winter months, and they brought with them lots of experience in community service, business acumen, and a knack for inviting new members. Among the enduring reminders of this club’s rebirth is the large “Welcome to Holmes Beach” sign that greets every arrival to Anna Maria Island upon crossing the Manatee Bridge. This welcome is manifested in club projects such as: grade 3 dictionaries; the Peace Pole project, initiated at Anna Maria Elementary School in the aftermath of 9/11, with a yearly event reiterating the message of peace and fellowship internationally; and the Rotary Reader program, designed to encourage reading, with merit badges to the grade school students for reading books not just individually, but also for reading to kindergarteners. Club members approached the AMI Chamber of Commerce and initiated the Businessman of the Year recognition that is given out annually. A closer relationship was thereby established with the Chamber, and since then the club has qualified periodically for funds through the Chamber’s Trolley Share Grants that are distributed to local not-for-profit civic organizations. While AMI Rotary is currently only 30 regular members strong, per capita, the small club has a giving and activity level that ranks higher than many clubs of far greater size. They boast a high percentage of Paul Harris Fellows. The AMI members have also traveled to equip impoverished village schools, install Shelter Boxes in disaster areas, provide polio vaccinations, distribute educational aids, and meet other needs in underdeveloped areas. Emily Boiteau is the Donor Relations Coordinator for ShelterBox Canada and is pictured beside a Shelterbox. Rotary International has partnered with Shelterbox Canada since 2012 with 50% of funding coming from Rotary. The standard Shelterbox costs $1200 for contents and shipping to disaster areas around the world. Shelterbox Canada has other kits they ship depending on the specific needs of the situation. This could include a school kit for 50 students or a repair kit for people with damaged homes and businesses. Shelterbox Canada sends teams of trained people to help in many different situations where people have been displaced from their homes due to natural disasters and conflicts. Our Rotary Club has purchased Shelterboxes in the past for families in Haiti, Thailand and Syria. For more information, click to visit their website. Please join us for a fun night on Monday, Jan. 30. Dinner at 6:30pm at the Gibson Centre. Please register for your meal in the usual manner. Movie at 7:30pm at the Circle Theatre. Cost of the show is $5 for seniors 65 years and older. Adults are $7.50. Please call (790-817-5540) email (maureen.royle@hotmail.com) Maureen Royle, by Sunday, if you are planning to see the movie. The Circle Theatre will reserve a section of seats for Rotarians and friends. Bring your own bowl for popcorn at $1/scoop. Bring your own cup for $1/tea or coffee. Be there for our Club Meeting on January 23...You won't want to miss our speaker..
Emily Boiteau is the Donor Relations Coordinator for ShelterBox Canada. She manages all donations and plays a key role as the first point of contact for donors and supporters at the Toronto-based national office. Emily is a graduate from the College of Arts and Science from the University of Saskatchewan and after traveling to disaster-prone countries and volunteering with local and international non-profits, chose to pursue a career at ShelterBox Canada. Emily is eager to work closely with ShelterBox Canada supporters to help ensure that no family is without shelter. Emily is originally from Alberta and in her free time enjoys knitting, cooking and exploring the outdoors. 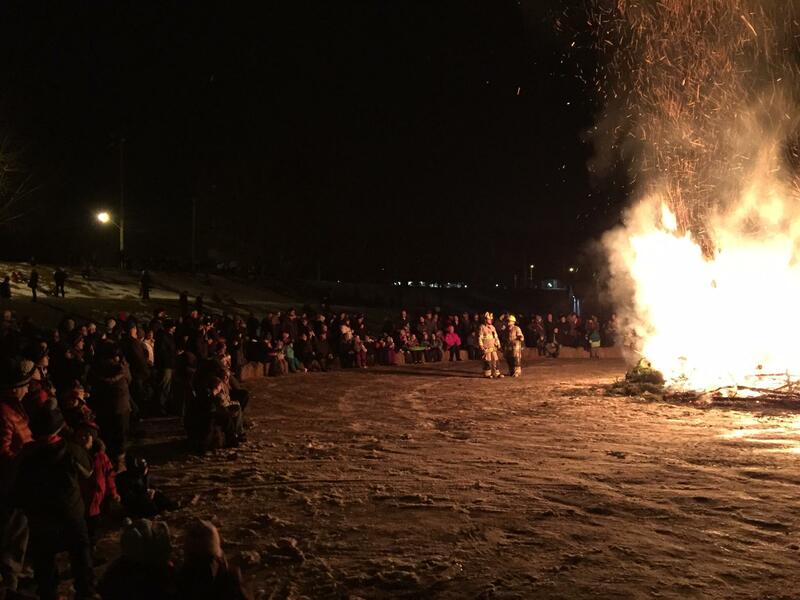 Great community turn out for our bonfire night on January 6th even though it was a cold night. Thank you all the Rotarians who helped out with tree collection and on the night of the bonfire. Thank you to Jim Brass and Raffi for the great hot dogs and hot chocolate. Thank you to the Town of New Tecumseth for all their assistance with preparations. Thank you to John McFarland for the lights and generator. Thank you to Gord Gallaugher for the donation of our safety bales of hay. A special thank you to all our volunteer firefighters who kept us safe and looked after the bonfire. This is the annual Meals of Hope project here on Marco Island. "Mary Anne and Art packing 250,000 high-protein meals consisting of pasta, cheese and soy powder for distribution to food banks in south-west Florida (we actually had a little help from the Marco Sunrise Rotary Club)". Liz Beattie and Andy Murison were our guest speakers on Monday, January 9, 2017. They spoke passionately about Beattie's Distillers Inc., an exciting new business for the Alliston area. Please see their Bio's below. The Beattie family have been farming in the Alliston area for 5 generations and will soon open their distillery near Alliston using their own potatoes to make vodka. Beattie's Vodka is now available in 203 LCBO stores across Ontario. The Beattie family believe in their community and giving back to the community. They donate 50 cents of each purchase to their 5 chosen charities. Their business was voted #1 in Craft Distillery businesses in 2016. We wish them every success in this exciting new business in our community. Liz is Ken Beattie’s wife and has been a member of the Beattie family for over 27 years now. She worked alongside Ken on the farm until 2000 when she went to work for CONTACT, a local charity. Liz held various positions during her 16 years at CONTACT; she concluded her career in December 2015 as Co-Executive Director to return to the farm and work on their new venture, Potato Vodka. Along with her sense of humour, Liz brings with her a vast experience in finances and administration. Her hard work and dedication to the company are characteristics she is most proud of. Liz’s role at Beattie’s Distillers Inc. is Chief Operating Officer where she works very closely with Andy Murison, Head of Marketing. Andy has over 20 years’ international experience working in the Alcohol Beverage Industry, more specifically with Spirits, with companies such as Mark Anthony Group, Diageo and Bacardi. He is a true leader with a proven ability to influence change, increase revenue and deliver growth to every company he has worked for. Andy joined Beattie’s Distillers Inc. just over 2 years ago, and has already launched their signature product, a Farm Crafted Potato Vodka, in to 230 LCBO stores. Andy too has a great sense of humour. Passionate, honest and humble are a few key words people who work with Andy use to describe him. Along with being the Head of Marketing, Andy is the President of BDI and a caring father of three children. 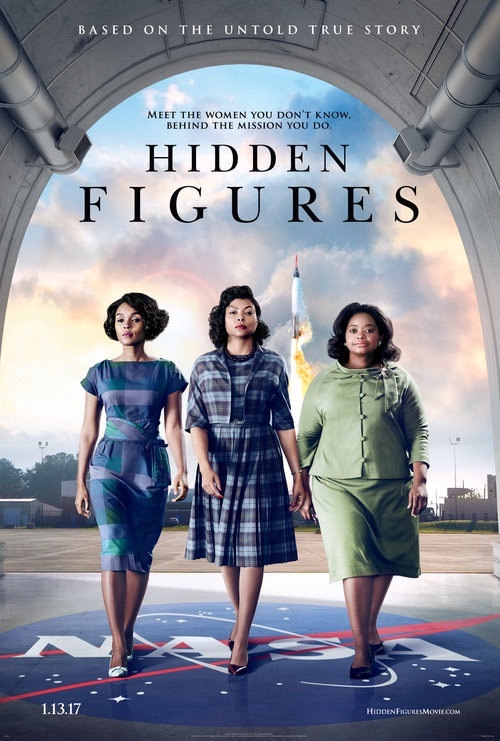 -Movie Hidden Figures" at 7:30pm at Circle Theatre - Bring your own bowl for popcorn($1 a scoop) and bring your own cup for tea or coffee at $1. - Admission is $7.50 for adults and $5.00 for seniors 65 and over. 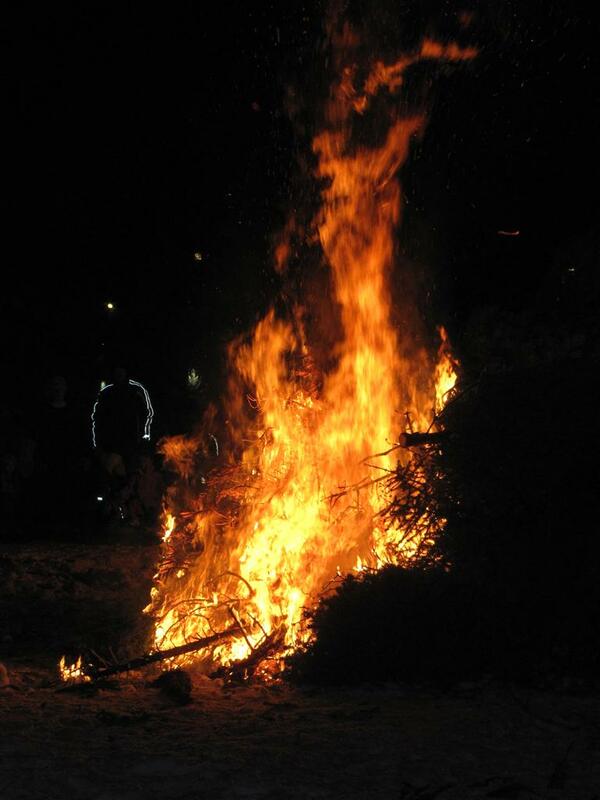 A picture of the activity at Rotaries Annual Twelfth Night Christmas Tree Burning. 2016. 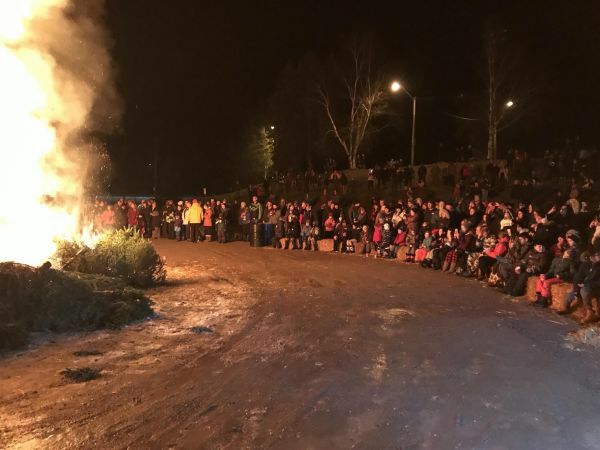 Hundreds of people and their trees including many families gathered at the Rotary Pool parking lot at 7:00 pm to see the fire start.. The Alliston Firefighters Association will be doing their usual great job of starting the fire and keeping everyone safe. Hopefully we will have a large pile of trees to provide a wonderful end to another Christmas Season. The hot dogs and hot chocolate will be served again. 600 hotdogs and enough Hot Chocolate to go around will also be provided. Rotarians watch your email for further details from Rotarian David Green. Save the date January 6th, 2017, 7 PM. Thank you to all the elves that made this a fun Christmas Party. Thank you to Royal Lepage RCR Realty, Brokerage in Alliston who donated $1000 to the Rotary Club of Alliston for the Rotary Splash Zone Project. The 2016 parade was bright, colourful and filled with music. Here are the winning entries. Big thanks to the Town, OPP and the volunteers. Help the Rotary Club of Alliston shape the future of Riverdale/Rotary Park by completing this online survey. 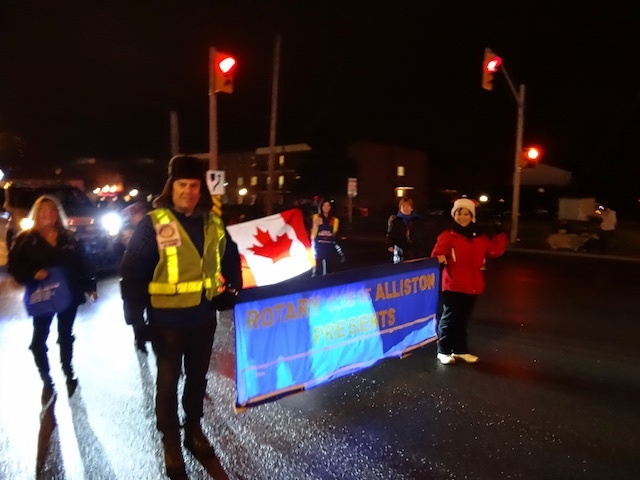 The Rotary Club of Alliston Night Lit Santa Claus Parade was a big success with many families enjoying the lights and music of the floats and vehicles. The big hit of course was the jolly, big guy himself who took a break from his work at the North Pole to visit Alliston. Here are the winners from this year's parade entries. Thank you to all the organizations and group who were part of the parade. President Punnapa and Mayor Rick Milne raise the flag at the municipal offices in Alliston. The flag raising celebrates End Polio Week around the world. The polio virus in now endemic in only 2 countries, Afghanistan and Pakistan. We are nearly there!. 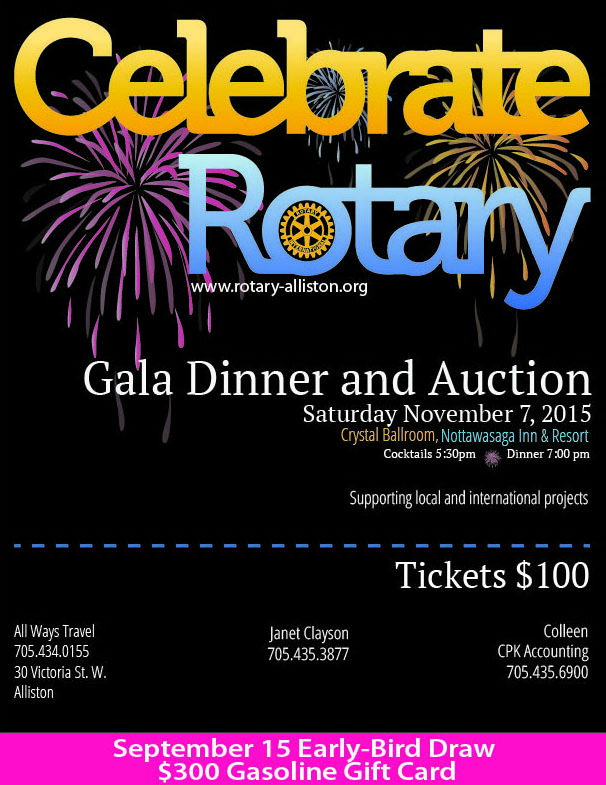 Get your tickets now for the Celebrate Rotary Gala and Auction. 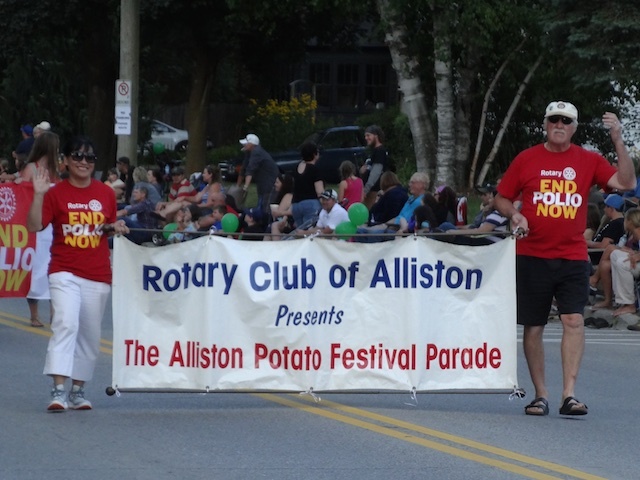 Victoria street was buzzing with excitement as the 2015 Rotary Potato Fesitval Parade kicked-off. Thousands of people lined the roads and enjoyed floats, bands, and demonstrations of gymnastics, dance and martial arts. For more photos click here. July 24, 2015 marked one year since Nigeria’s last case of wild poliovirus. That’s the longest period the country has gone without a case of the disease. This achievement has particular significance, because Nigeria is one of only three countries in the world in which polio is still endemic. When the disease is eradicated in Nigeria, Pakistan, and Afghanistan, the world will be free of polio. A few weeks later, 11 August will mark one year since the last case of polio in Africa: a case in Somalia that came at the end of an outbreak in the Horn of Africa. Africa’s countries have overcome significant challenges — including lack of security and difficulty reaching children in remote places — to protect their children from polio. Rotary has played an important role in reaching these milestones. Rotarians have dedicated their time and their personal resources to keep children safe from this disease by immunizing them, donating money, raising funds, and urging governments to support the cause. Rotary has donated $688.5 million to fight polio throughout Africa, including more than $200 million designated for Nigeria. While this is notable progress, we haven’t finished the job yet. Before Africa can be certified polio-free, all countries in the region, including Nigeria, must pass two more years without a case of polio. To achieve this, we must make sure all children in Nigeria continue to receive the polio vaccine, including those in hard-to-reach and underserved areas. Maintaining high-quality immunization campaigns and disease surveillance throughout the continent is essential. Now more than ever, we need the support of Rotarians, partners, and governments. As recently as June, Rotary granted $19 million to support polio eradication efforts in Africa, including $9.9 million for Nigeria. By continuing to support polio eradication in these final years of the campaign, we ensure the best possible chance that 11 August 2014 marked the very last case of polio in Africa. Spread the news that we’re making progress, but this is only one step on the final road to polio eradication. 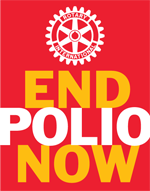 Support Rotary’s continued efforts to fight polio by donating at endpolio.org. 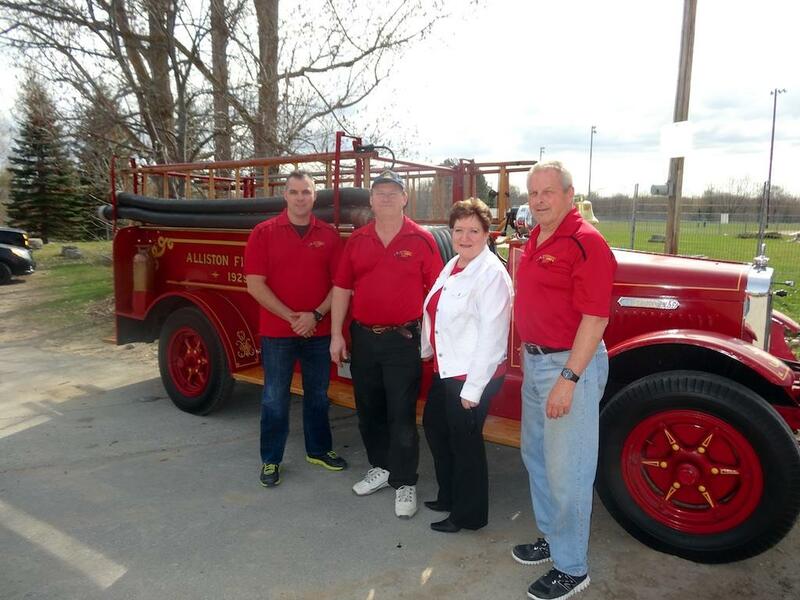 Alliston [April 29, 2015] The Rotary Club of Alliston is pleased to announce that the Alliston Firefighters Association has committed $15,000 to the Rotary Club’s 60th Anniversary Splash Pad Expansion project. The Alliston Firefighters Association prides itself in being a supporter of projects that make our community a better place to live. It also supports youth in our community. The Association feels that the Splash Pad Expansion project embraces both these ideologies. It is also fitting that the Firefighters who play with water all the time, support a project that will create a spot for our youth to come and play in the water. The $15,000 committed to the project was raised through the Association’s youth dances and elimination draw. This donation to the project moves the Rotary Club one step closer to the Grand Re-opening of splash pad on July 1, 2015. 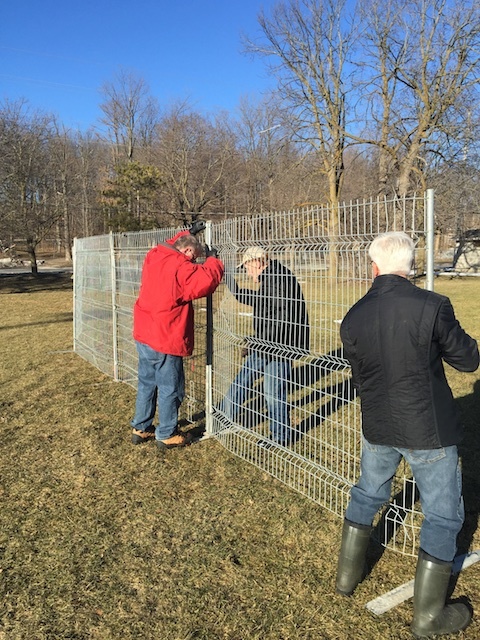 Construction Begins with fencing off the area for the 60th Anniversary Project! A huge thank you to all the volunteers! We were all done in an hour! 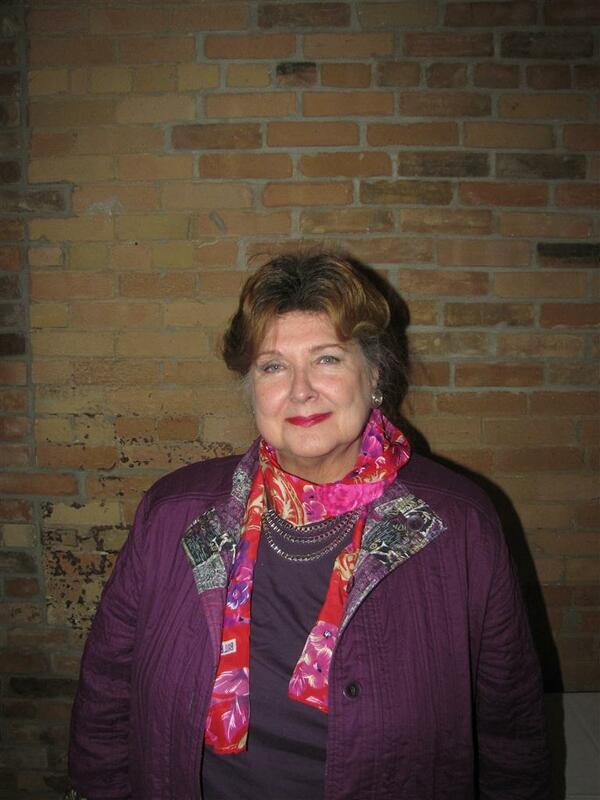 Meeting was conducted by Patricia Middlebrook. Get well wishes for President Colleen. Please keep Barb and Don Smith in your thoughts and prayers. Welcome to Heather McKnight who joined us from Shank Law Professional Corporation which is one of our business memberships. Paul Foster won the draw but the Queen lives! Heather McKnight was happy to be here for such a wonderful meal. Sue Leach was happy to see so many guests. Sue happy to be on a ski trip to Colorado for 2 weeks. 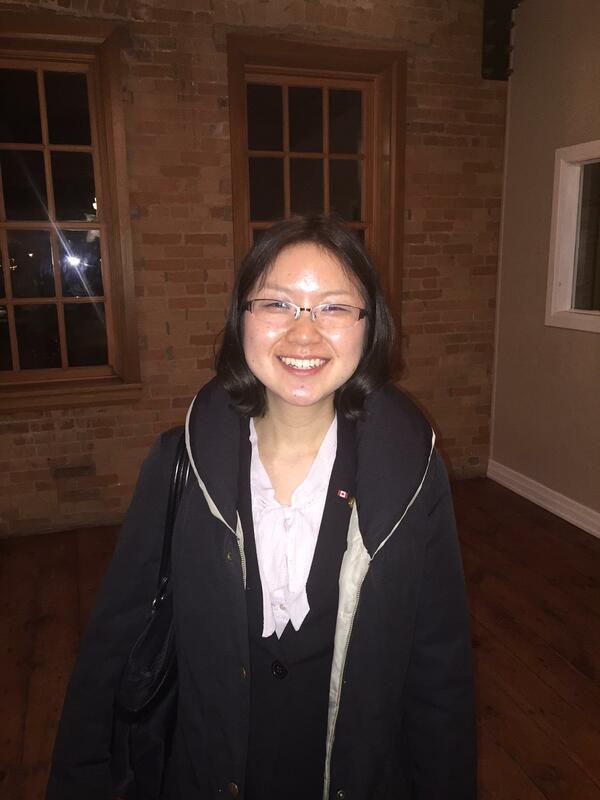 Aya Nishiyama, Rotary Global Grants Scholar 2014-2015 spoke to our club on Monday, March 16. We had 8 lucky guests as well as our members that attended Aya's presentation. Gerard and Judy Baribeau from Rotary Club of Scarborough accompanied Aya to our meeting. The Rotary Club of Scarborough is one of Aya's host Rotary Clubs. Aya spoke about growing up in Japan and the USA as well as her reasons for studying literacy and language at the University of Toronto. Thank you Aya for a very informative and interesting presentation. Please see Aya's bio below. Aya Nishiyama was born in Osaka, Japan. She has lived in the United States and Japan before turning 18. After graduating from the Christian University in Tokyo, she worked as a high school English teacher for 2 years and an elementary school English teacher for a year and a half. Aya applied for and was awarded a Rotary Global Grant Scholar for 2014-2015 and is taking her Masters in Education at the University of Toronto(Ontario Institute for Studies in Education). Her major is Language and Literacy Education. She is hosted by two Rotary clubs, Osaka-Nakanoshima Rotary Club in Japan and Rotary Club of Scarborough in Canada. She is a member of a downtown Toronto church and is learning how to play the flute. Dave Green conducted the meeting. Get well soon President Colleen! Patricia Middlebrook won the draw but the Queen lives! Roxanne is glad that the weather has warmed up. Jack is happy to be up and moving after his surgery. Paul Foster is happy that Rotarian Sean is the Architect for our 60th Anniversary project. Michelle is happy to announce she is expecting a baby. Congratulations!!!! Ralph was very thankful of the club's support over the last month. Thankful for the flowers sent and for Paul Foster and Don Smith acting as Pall Bearers for Carole. It is with pleasure that I do stand here for this classification talk. It is about 19 year ago that I made a similar speech to this club and a lot of members have come and gone since then and so it is time to re-introduce myself. My name is Jacob Frederik (Jack) Van’t Spyker. I was born in a small village in The Netherlands, Zwijndrecht, in 1947. I have 3 brothers and 1 sister older then me and one younger sister. They are all still alive, presently in Holland, all retired and that leaves me the only productive one in the family, as I like to tell them when we meet. 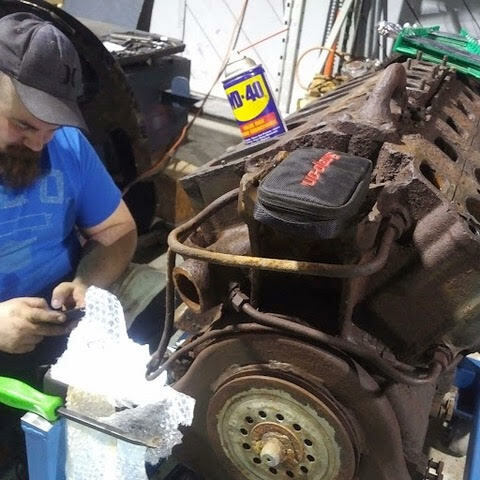 I went through grade and high school and had my vocational training in a technical collage similar to the Automotive institute at Georgian College in Barrie. I landed after college a job with an importer of east European cars: Wartburg and Trabant where I had the responsibility of handling warranty claims between the dealers and the factory. The quality of the vehicles was even for the 60's, terrible and I learned to write long pleading letters to the factories and even longer letters of rejections that were thick with language and short on content. I did marry my wife Betsie in 1968 and we both immigrated to Canada in April of 1969, came to Alliston and 3 days after landing I started to work for the local Pontiac Buick dealer here in town. To the day I worked there as mechanic for 4 years after which I started for myself selling gas and repairing vehicles. The place was across from the highschool where now Wimpy’s diners is located. I did this for almost a year but had to change my position as my wife and I realized that the by then second daughter Annette then 1.5 years old, was afraid of the fellow that she saw on Sunday morning and who disappeared again after one day. I worked from 7 AM till 9PM and Annette was asleep when I left and sleeping in bed when I returned home. I bought in with my previous partner Sam Miedema and we ran a successful service station in town. Always busy and we could have worked 24 hours a day and still not finished. In 1975 we became a sub dealer for Don Coffey Ford sales in Shomberg and became a full dealer in 1981. And how I have been able to fare after that can be seen on the corner of Highway 89 and the Industrial Parkway, on highway 89 near Shelburne and on Highway 10 in Orangeville. During this time the family grew with 4 children, 2 girls, Jacky, Annette, Eric and Tony, and we had a rich family life with school, outings, events, holidays etc. All 4 kids did very well in school and all went on to get to university to get degrees, all 4 have MBA’s as well as Annette who also has an MLA and the youngest son did get DR before his name as a medical doctor. I am very proud of their achievements and their current positions and jobs that keep them very much occupied. The only further statistic I like to add at this point is that I also have 7 very lively grandchildren and for me it is a privilege to follow their exploits. One of my most satisfying times is when I lock the doors at night and know that they all are safely asleep in a warm house after being spoiled by Betsie and me. So that was 68 years in a nutshell, but who am I? First of all I count myself a very lucky fellow having had great opportunities that I was able to grasp, having a solid family that supports and fends for each other. I experienced this so very much with my recent back surgery. The kids made sure both Betsie and I did not have to worry about traveling by ourselves, there was constantly at least one kid around the hospital just in case etc. A rich experience indeed. I am not affiliated with any church or political organization. Church I gave up on a long time ago, not so much for any spirituality as for the lack of consideration for different interpretations or questions of doctrine and history. Too many personality conflicts that damaged innocent bystanders and created opposing parties with no direct correlation to spirituality or the communion of believers. A church, Mosque or temple community can give a strong support base for individuals that need such support, but so can Rotary and Lions clubs or Legion to name a few. Politics is in my view divided by people who have good intentions and people that seek power and work hard to maintain their jobs and their accumulated power. The last category seems to have the upper hand most of the time. Things have to make sense to me, if common sense is placed outside the door mistakes are made and there always will be victims of such mistakes. I could give long list of items that do not make sense and that make our beautiful country slide backwards in prosperity and throttle innovation. The country that I live in now is not the same country I did enter in 1969 and that pains me. I would like to retire and keep working and be productive at the same time. The privilege I had to visit and work in other countries: the Dominican Republic, Berkina Fasso, Tanzania with Rotary, Bangladesh, Rwanda in other capacities have given me learning experiences that fulfilled me and left me in awe of the people I was allowed to meet and interact with. I am a bit of a loner at times. I go faster through airports on my own, alone in the car I get to the destination faster (I love speed). If things do not interest me I find it hard to pursue these items, but I can if I must. I love Baroque classical music, organ and piano are my favorite instruments, but let me listen to music with beautiful harmonies and interweaving themes and I am all ears. I think I can play 8 hours of music for 30 days and not play the same cd, record or tape twice. I had to put a lid on buying more music as my collection became so big that it is almost impossible to choose what next to play. I do try to read a lot. Good fiction, analytical history stories but no more crime and war stories as we get a full dose of the real thing on TV and newspapers. I love my vegetable garden and start very year earlier with growing transplants, the first tomato and beans and what have you are such a source of satisfaction. I like to stretch the growing season and see if I can beat nature. I normally lose. I have some dreams yet too, I would like to transplant myself for 3-4 months in France to learn the language, and after that do the same in Spain. I would like to go by train from Moskow to lake Baykall to experience that vast country and take time and drive from Ontario to the southern tip of South Amerika and take time to see famous and historic sites. I would like to run in Targa Newfoundland one more time with a faster car and myself driving, but I might find strong opposition to such plan on the home front. And as such this will probably remain a dream. But what is life without some dreams. Carole went peacefully to be with her Lord and Saviour on February 27, 2015. She is survived by her loving husband, for 54 years, Ralph; her wonderful children, Douglas (Julie) and Louise; her treasured grandchildren Emily, Austin, Victoria, Abby and Hunter; and her “McGee siblings” Ian (Dawna), Bob (Dorothy), Heather (John LaShell) and Janet MacDowell. Carole was born in Toronto and graduated from Mimico High School and Toronto Teachers’ College, Many of her schoolmates remained close friends. Always generous in volunteering to help others, she organized and taught the first ESL class for adults in Scarborough. She provided teaching and leadership in all churches where she was a member, notably as the current Moderator of First Baptist Church, Barrie. Carole has been actively involved in Rotary since 1996. In 2006, Carole and Ralph went to India to participate in a Rotary International “National Immunization Day”, when more than 100 million children were immunized against polio. She is a multiple Paul Harris Fellow and a member of the Arch Klumph Society. Many thanks to the management and staff of Mathews House Residential Hospice for their caring attention during her last days. Carole’s family will receive friends on March 6, from 2 to 4 pm and 7 to 9 pm, at the W. John Thomas Funeral Home, 244 Victoria Street East, Alliston. Visitation on March 7 will be at First Baptist Church, 550 Grove Street East, Barrie, from 12:30 to 2:30 pm, followed by the funeral service at 3 pm. President Colleen was under the weather this week. Get well soon! President Elect Punnapa conducted the meeting. Queen of Spades Draw: Won by Punnapa but the Queen Lives! Simon Ffrench is a long time Simcoe County resident. He and his family own and operate Cookstown Greens. Cookstown Greens is a Certified Organic Farm of 95 acres and they sell to restaurants and markets in Toronto. Organic farming means that they do not use Chemicals, Synthetics or GMO's. Cookstown Greens uses a three year crop rotation. They have 30,00 square feet of green house space and storages for root vegetables. To be Certified Organic every farm should be checked and audited. The traditional view of organic vegetables, was it did not matter how they looked. This has changed over the years. Marketing and packaging is very important for sales. The cost of producing oragnically grown vegetables in our climate is much higher than in other parts of the world that have longer growing seasons and less need for storage facilities. This is one of the challenges of producing Organic Vegetables in Canada. About 2% of agriculture in Canada is organic but about 25% of food purchased by Canadians is organic. The public drives the demand for organic. A huge challenge for organic farmers and consumers in Canada is the language and information on the packaging. There is a need for the government to have consistent and clear information so that consumers know what they are buying. Simon suggested that the club consider a visit to their farm to see the operation. Thank you to Simon for a very informative and interesting presentation. 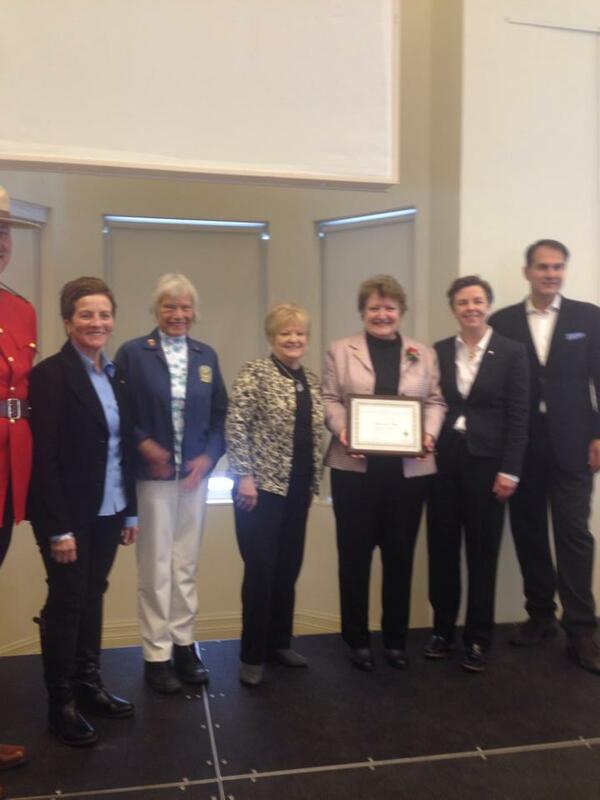 The Rotary Club of Alliston was one of the ten recipients of the John Graves Simcoe Award on Feb. 21, 2015. This award is presented to Service Clubs, businesses and individuals that have through their volunteer work have made a positive impact on their communities. Dr. Kellie Leitch was on hand to make the presentations to President Colleen. Rotarians Patricia Middlebrook, Shirley Ford and Kelly McCague were in attendance and are pictured here. 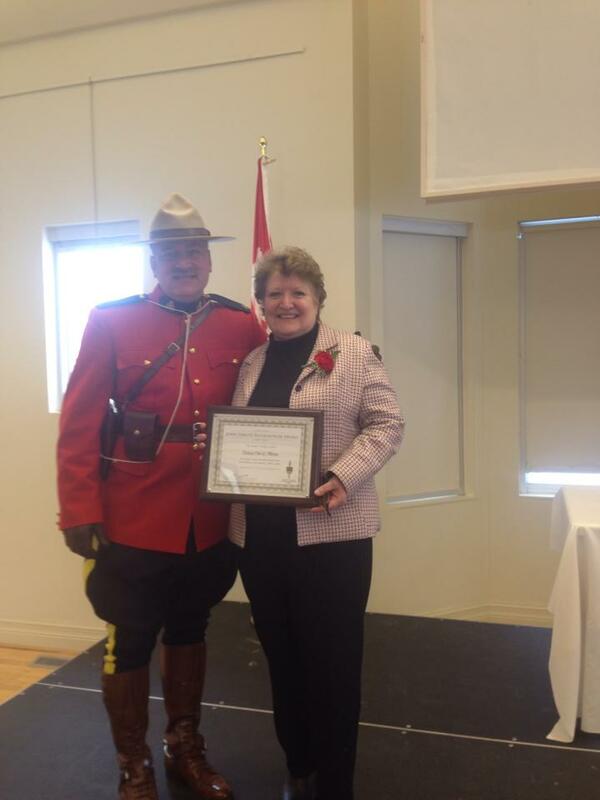 President Colleen with Constable Terry Russel from the RCMP. Rotarians will remember that Terry was our local liason for the RCMP Musical Ride a few years ago. For more information about the event and the award, please follow the link below. Simon Ffrench of Cookstown Greens will be our speaker on Monday, March 2, 2015. Simon's topic will be "The Benefit of Organic Vegetables and Current Challenges". Please see Simon's Bio below. In his leisure time Simon enjoys being outdoors doing anything from farming, going for a long walk with the dogs to golfing, but mostly in the fairer weather, Roadbiking. From 1981 to 1989 Simon operated Complete Farm Service at the East end of Alliston since when the property has been leased to farm related businesses such as Neighbours Country Depot. Since 1989 Simon has been an investment and financial planner operating his own business, Atlantis Financial, located in Barrie. In 2003 because of his business, financial and agricultural knowledge and experience, He purchased a majority share of Cookstown Greens helping to rejuvenate an organic farming business which provides employment for 9 local and 8 migrant workers. In the fall of 2011 the Ffrenches took over the remaining share of Cookstown Greens and Simon and Caroline are helping the family move the business forward to the new era of ‘organic’ in agriculture. The Rotary Club of Alliston is looking for high school students to attend the annual Camp Enterprise program from May 7th to 10th this year. The club has been sending students to this excellent program for many years. The Objective of Camp Enterprise is to expose, explore, and spur the student’s imagination on the whole subject of business and private enterprise. In providing students with a broad view of professional, business and management careers, the program presents business and management as challenging positions offering enormous personal satisfaction. While allowing the individual to exercise maximum creativity, the program at the same time emphasizes obligations to serve and contribute in the community. Up to 64 students from grade 11 and 12, from local secondary schools within the local Rotary Clubs jurisdiction are hosted by the Camp which is run each spring by 15 Rotary clubs in the northern Greater Toronto Area. The clubs recruit students from 25 area high schools. Students should also contact their schools’ Guidance Departments for application forms. Working in hospitality for 10yrs. 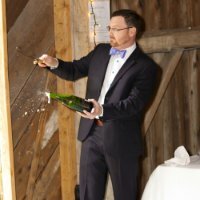 Received my hospitality diploma in 2006 from Georgian College, then moved to Toronto and began working at the Boulevard Club. In 2010 he started wine classes, which turned from an interest to a passion in his life. Daniel is the Fine Dining Manager/Sommelier at the Boulevard Club. Daniel is a certified Sommelier. his last trip to Germany in 2014, I an invitation by the German wine institute along with 40 other Sommeliers from all over the world. It was an amazing chance to network and visit famous German wine regions, while be surrounded by people with the same passion for wine. Daniel continues to expand his understanding of the world of wine. 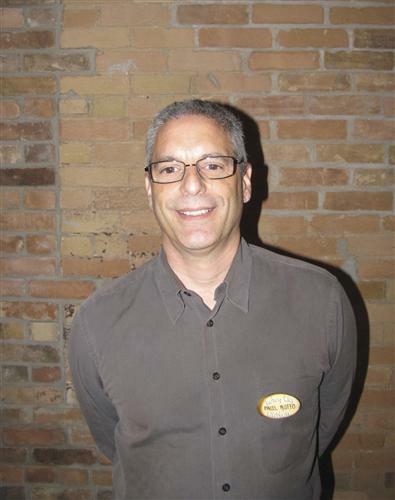 He is an enthusiastic wine professional, who loves wine and would like to help continue to share it with the world. Daniel is available to act as Sommelier at your next dinner party in your home. Rotary Christmas Trees On Sale Now at Canadian Tire Alliston! The Christmas Tree fundraiser is now underway at the Canadian Tire parking lot in Alliston. Funds will be used to enlarge the Splash pad and build a new path from the enlarged Splash pad to the Rotary public pool in town. Three types of high quality trees are available either at the compound or in the seasonal department in Canadian Tire. Rotarians will be manning the compound Thursday and Friday nights, 4-8pm as well as all day Saturday and Sunday till December 22. Come out to support your community projects and get a great tree along with free Christmas greetings and goodwill! 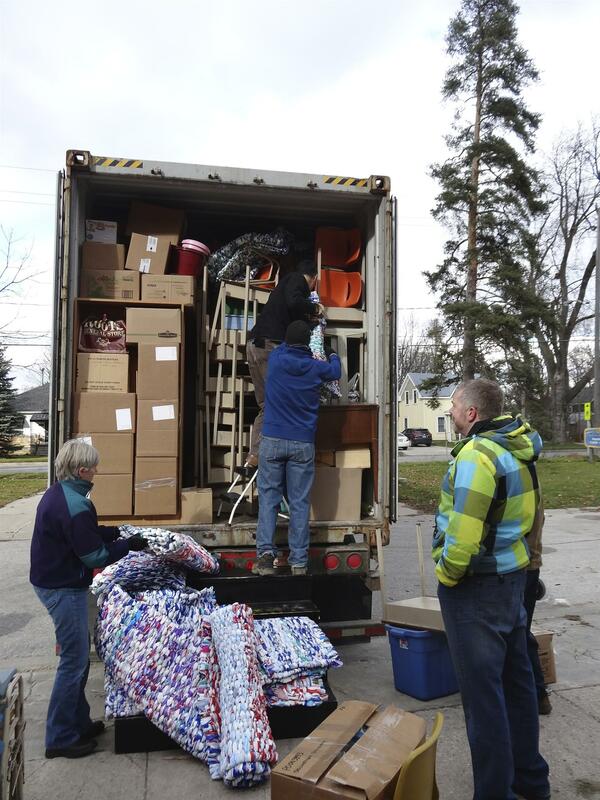 On Saturday over 70 volunteers from area Rotary Clubs, the Y and Simcoe County District Board of Education joined together to load a container bound for South Africa. We loaded the container FULL of equipment and supplies to help with the education of elementary and secondary school students in the Mpumalanga District of South Africa. The books were donated by generous members of the public and by Saunders Books. The equipment and supplies were from the Simcoe County District Board of Education. They were from schools that had been closed and the materials were not going to be used for our children here in Simcoe County. So rather than sending things to a landfill, everyone was happy to see them go to South Africa instead. We want to celebrate and to thank all of the volunteers from the Rotaract Club of South Georgian Bay, the Rotary Clubs from Collingwood, Alliston, South Georgian Bay, Innisfil, Barrie Huronia, Grand Bend, Middleburg, South Africa and the YMCA of Simcoe/Muskoka. We also want to thank the Board for all their help too. Finally, there were hundreds of people who dropped off books at the YMCA. It was a fun day and we are looking forward to sending two more containers in the spring, this time to Sierra Leone. The Rotary Club of Alliston has been providing Webster’s Canadian Dictionaries to grade 5 students in Alliston for six years and the students continue to benefit from having their own dictionaries to use in the classroom and at home. 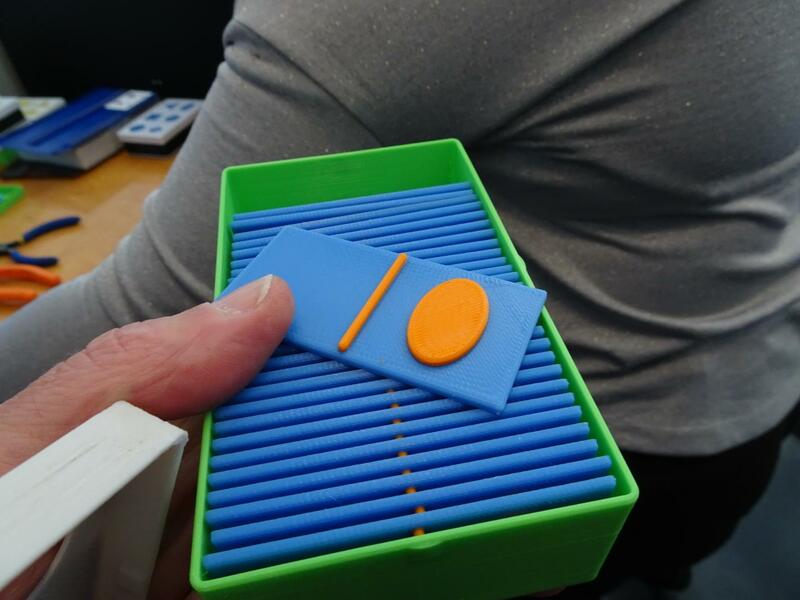 This year the club presented 237 students with this special gift at four different events. The schools give Rotarians time to talk with the students about the value of volunteering, reminding them about the fact that they will need 40 hours of volunteer time outside of the home, from grade 9 to grade 12, in order to graduate from high school. The students are encouraged to get ready for that experience by finding opportunities now to help others in their communities. The Rotarians also describe what their organization is about and what it has done to help improve life in the Alliston area. Before presenting the dictionaries, the students are encouraged to think about how this resource will help them to enhance their reading and writing skills. The actual presentation involves Rotarians’ calling up the students by name, shaking their hands, and handing them their own dictionaries. The students are very excited about the gift and enthusiastically thank the Rotarians. The Rotary Club of Alliston thanks all the teachers for allowing them to spend time with their students and preparing the dictionaries. 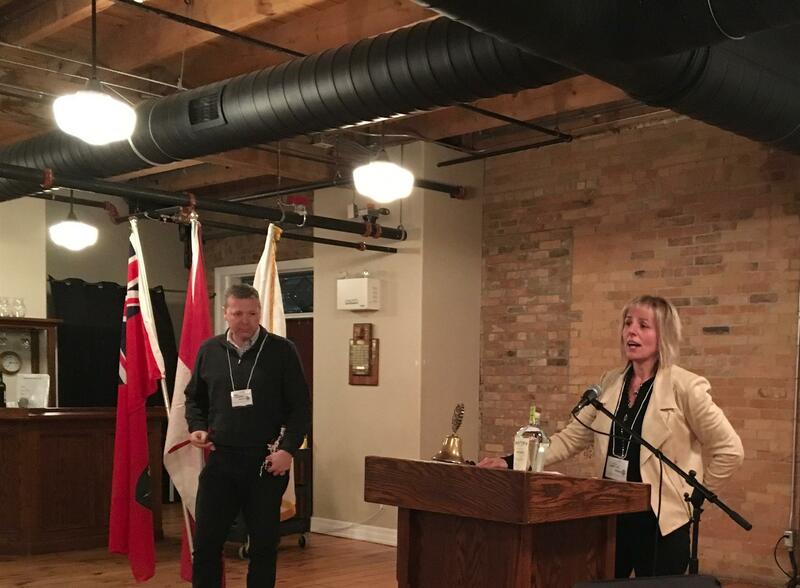 The club also thanks Rotarians Colleen Kotnisz (President 2014/15), Sue Leach, David Green, Art Kovats, and Joan Hayward for organizing these events and participating in the presentations. New Tecumseth Mayor Mike MacEachern is currently in his third term of office and leads a council that includes a deputy mayor and eight councilors that represent eight different wards. Comprised of four communities – Alliston, Beeton, Tottenham and Tecumseth – The Town of New Tecumseth amalgamated in 1992 and has a population of approximately 30,000. 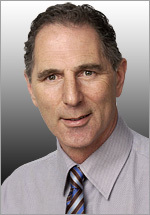 MacEachern began his political career in 1998 when he was elected as a Ward Councillor for Alliston, which is the largest community in New Tecumseth. He was subsequently elected to a second term in 2001 before becoming Mayor in 2003. As Mayor he is also a member of the upper tier government, the County of Simcoe. 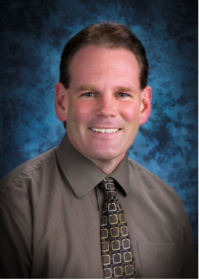 MacEachern is a member of the County’s Performance Management Committee. Having also served in the past on the Audit Committee and Governance Committee. He is the Chair of the Nottawasaga Police Services Board and a member of the South Simcoe Mayors Association. MacEachern is also a member of: the Finance Committee for Southlake Regional Healthcare Centre, Stevenson Memorial Hospital’s (SMH) Governance Committee as well as SMH’s Future Health Care Centre Committee. 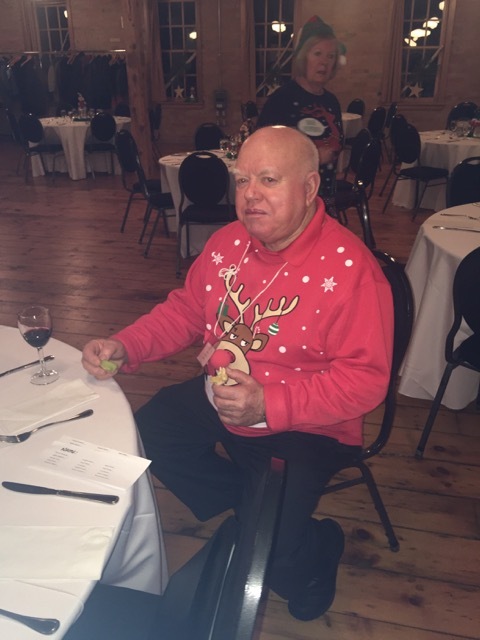 In addition to his role as Mayor for the Town of New Tecumseth, MacEachern is the Executive Director of FOCUS Community Development Corporation and has been since the community-based, non-profit organization incorporated in 2000. Through this position, MacEachern is responsible for annual funding of more than $1.5 million. He has also run his own successful consulting business and been employed as a consultant with the Government of Ontario, Ministry of Training Colleges and Universities. MacEachern graduated from the University of Western Ontario with an Honours Bachelor of Arts in Physical Health Education. His continuing education has included: Mediation Training from Osgoode Hall Law School of York University, Financial Management, Total Quality Management & Information Technology. The past weekend people in Tottenham had an opportunity to challenge each other to game of chess. 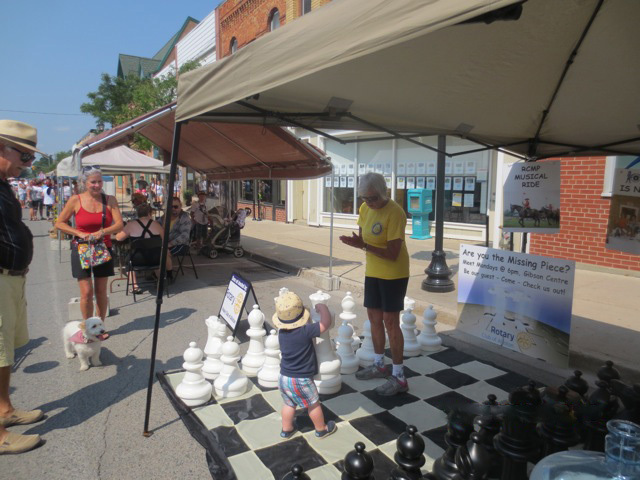 This was no ordinary game, but rather, an oversized "street" version recently purchased through a donation by the Rotary Club of Alliston. Looks like fun. Jennifer McCague, Rotarian Kelly's cousin, is a local girl. 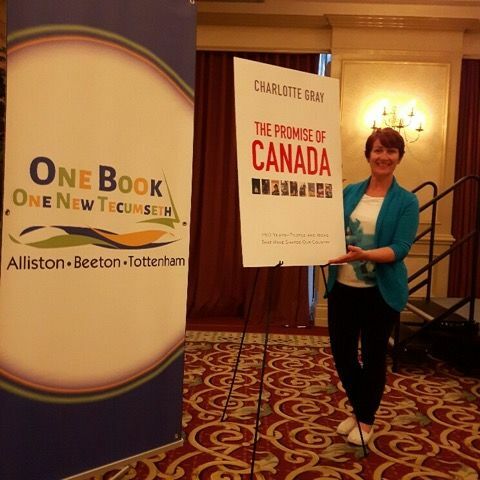 She was born in Alliston and raised on a dairy farm just outside of town. She is a librarian at a local elementary school and believes strongly in volunteering and giving back to the community. She is a third generation McCague to be a member of the Alliston Lions Club and has been the only female president, taking the position fifty years after her grandfather served in the same capacity. Jennifer is a marathon runner and triathlete who recently completed an Ironman competition. She is always planning her next trip and always training for her next race. She has crossed the Antarctic Circle and the Arctic Circle and told us a little about those exciting trips. In order to reach Antarctica, Jennifer began her trip in South America. Upon arrival she discovered that her luggage had been lost and no one knew where she was because there was no internet and no WiFi. She quickly learned about the kindness of strangers who helped her out when they could. She travelled to Ecuador, Peru, Argentina, Brazil to see her friend Jennifer Bertram and to hike in the rain forest, Chile, and Easter Island. She kept a blog so her friends and especially her students could follow her travels. When her students saw her photos of Easter Island, they remarked, "Those stone dudes are so cool..." Finally she boarded an ice-breaker for Antarctica. Jennifer had always been struck by the sense of desolation and the remarkable fact that the land is desert-like. She spent two weeks on the boat, visiting the Antarctic continent as often as the passengers were allowed. They had to be hosed down as they disembarked and boarded the boat and couldn't carry even a Kleenex tissue, so fragile is the ecosystem there. Jennifer did manage to cross the Antarctic Circle, even though there were some other things that she couldn't do that she would have liked to have done. The return trip was very rough and she found out that green apples tend to help prevent nausea! After that trip, Jennifer decided that she wanted to cross the Arctic Circle as well. So she started in Finland and ran a marathon which included crossing the Arctic Circle - another dream come true. Next will come a trip to Poland to visit the POW camp where the Great Escape took place. Her grandfather was one of several Canadian prisoners of war who were involved in that event. Jennifer is certainly a young woman on a mission. She is full of wanderlust and has a huge heart that was made to travel the world! 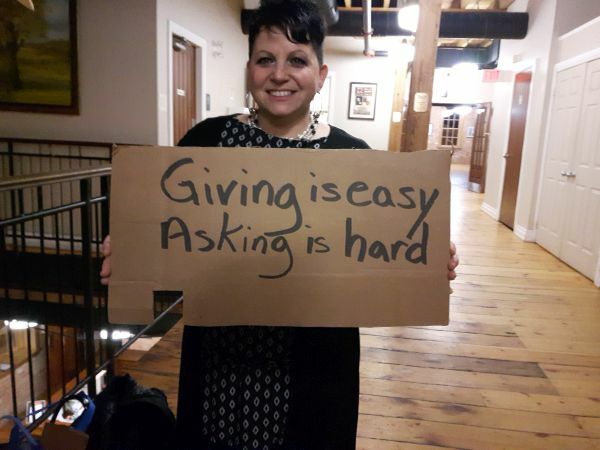 An international development professional with extensive experience working in social development around the world, Esteban leads Transforming Faces with strong skills in organizational strengthening, human resource capacity development, fundraising and social justice. Esteban has worked in the past with UNICEF, Catholic Relief Services and Christian Children’s Fund of Canada and, in 2007, was named one of the 10 Most Influential Hispanic-Canadians. Having built a solid foundation for the charity since 2002, Esteban continues to expand Transforming Faces’ capacity, presence and alliances to provide high-quality, multidisciplinary treatment and rehabilitation for children, families and communities affected by cleft lip and palate and craniofacial disorders. Our partnerships with medical professionals in the fields of plastic surgery, speech therapy, audiology, dentistry, orthodontics and social work provide an excellent opportunity for media to source informative and engaging experts in these and related areas, such as brain drain of medical professionals from the developing to the developed world. We welcome inquiries from media professionals who are interested in telling the fascinating story of lives transformed through high quality, child-focused cleft care. World Polio Week is declared in New Tecumseth for Oct 21- 28, 2013. End Polio Now Flag raising at New Tecumseth Office on October 21, 2013. Mayor Mike MacEachern, Deputy Mayor Rick Milne, Rotarians Joan Hayward, Punnapa Hartley, Ralph Jones, Patricia Middlebrook, Herb Oliver and Councillor Paul Whiteside helped raise the flag. Click the link to read Joan Hayward's remarks from the flag raising ceremony. End Polio Now Flag Raised! Past President Bev Nix presented the following nominations for the 2013 - 2014 Rotary Year. Nominations remain open and will close at the Annual General Meeting in December. Please see Bev if you are interested in any of the positions. Supporting Foundation Is a Family Affair! 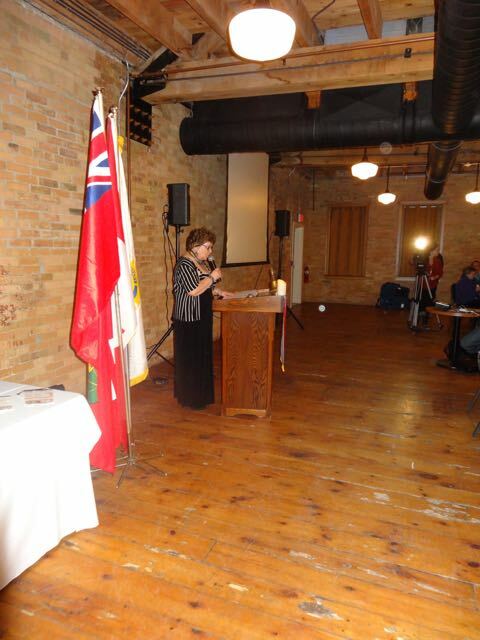 The November 5th meeting was dedicated to honouring the memory of our veterans. 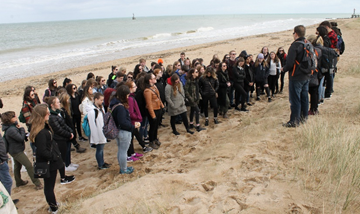 This year a presentation was made by Beth Dodwell a local BMHS senior who travelled to Europe earlier this year to participate in the Vimy Ridge Memorial Service. Beth told us about her experiences while visiting England and France as part of a student tour to learn about the experiences of the soldiers who fought at Vimy Ridge in April 1917. During her presentation, Beth spoke of the history of the event and the emotion she felt in being able to participate in the services. Did you know that 10,602 Canadian soldiers were wounded and 3,598 Canadians died in this battle? Beth spoke of 2 Canadian soldiers that she had researched in preparation for the trip. She gave a heart warming account of who they were and how their deaths must have impacted thier families back in Canada. The evening ended with David Kennedy playing Last Post and Reveille. Two minutes silence was observed. In addition to this memorial, Alliston Rotarians are invited to Legion ceremonies on November 11. The service will begin at 10:30 am. This was a highlight of Rotary International's Zone 24-32 Institute held from October 18th to 21st at the Westin Bayshore Hotel. The event was attended by over 400 Rotarians and partners, as well as other invited guests, in order to combine plenary and breakout sessions for past RI Governors and Officers. It was also attended by District Governors-Elect and Nominee as part of their ongoing training. Because of the twinned Zones, there were Americans, Russians, Bermudians, French, and Canadians all learning together. We were honoured to have RI President Tanaka from Japan at our Institute as well. He is a delightful, humble servant of our vast organization. A long-standing tradition at Zone 24 Institutes is the introduction of the DGE (and partner) to the President or Vice-President, whoever is in attendance. It was my pleasure, along with PDG Richard Clark, to present DGE Valerie Wafer (Whitby) and husband Mark to President Tanaka. It is also a tradition on the Sunday morning to hold a Celebration of Life event at which PDGs who have passed away since the last Institute are remembered and honoured for their contribution. I lit a candle in memory of our own PDG Paul McKelvey who served our district in 1979-1980. Also attending from District 7070 was Chair of PolioPlus PDG Bob Scott (Ann) from Cobourg and DGN Brian Thompson (Karen) from Whitby Sunrise. Who will be honoured from our community? The Elgin Blakely Citizen of the Year Award is presented by the Rotary Club of Alliston to person in the community who has best exemplified "Service Above Self" in the previous year. This year the Rotary Club of Alliston is celebrating 31st years of presenting this award. Do you know someone in the your organization, church, neighbourhood who has been of great service in some way in 2011? If you think they should be recognized for this service please download and complete a Citizen of the Year application. The closing date is Mar 20, 2012. All applications are judged by a committee of non-Rotarians from the community. The winner will be announced on March 26, 2012 with the official presentation taking place at the Clarence Leach Rural/Urban Night on April 9, 2012 at The Gibson Centre for Arts and Culture. Tickets for the Rural/Urban are $40 and include dinner and the presentation of the Elgin Blakely Citizen of the Year Award. Please send an email with your contact information to rotaryalliston@gmail.com if you are interested in tickets or require additional information. Click here to download the Elgin Blakely Citizen of the Year Award Application. The Rotary Club of Alliston is proud of our local veterans and to help recognize their contributions the club has recently donated to two memorials in the greater Alliston area. 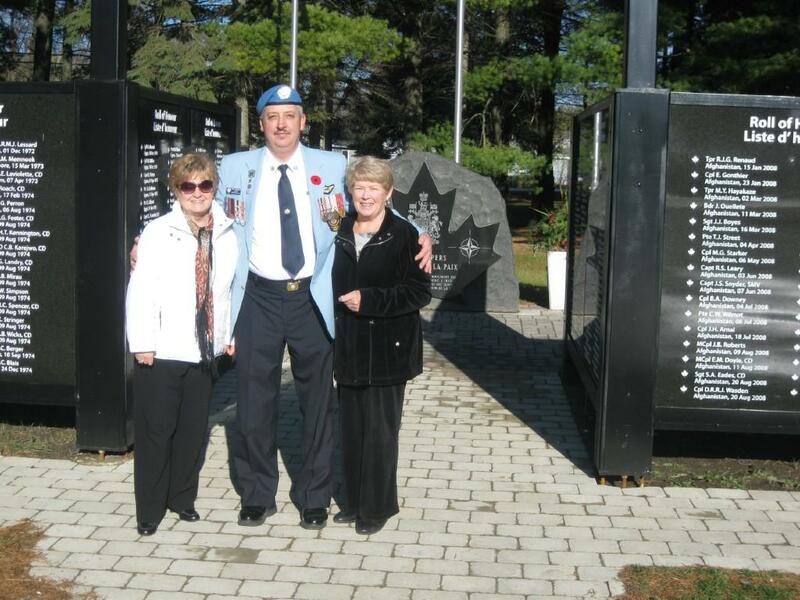 Our Club donated $500 to help build the Peacekeepers Memorial Wall outside Base Borden in Angus. The wall list the peacekeepers who gave their lives to protect us during Canada's participation in the last five wars. Rotarians Carole Jones and Patricia Middlebrook are shown here with with Mr. Fern Taillefer who is chairman of the United Nations Peacekeepers Committee. The club also donated $1500 towards the new Alliston Cenotaph. This donation will help purchase a stone bench that will allow people to sit and appreciate the new memorial on Albert St. 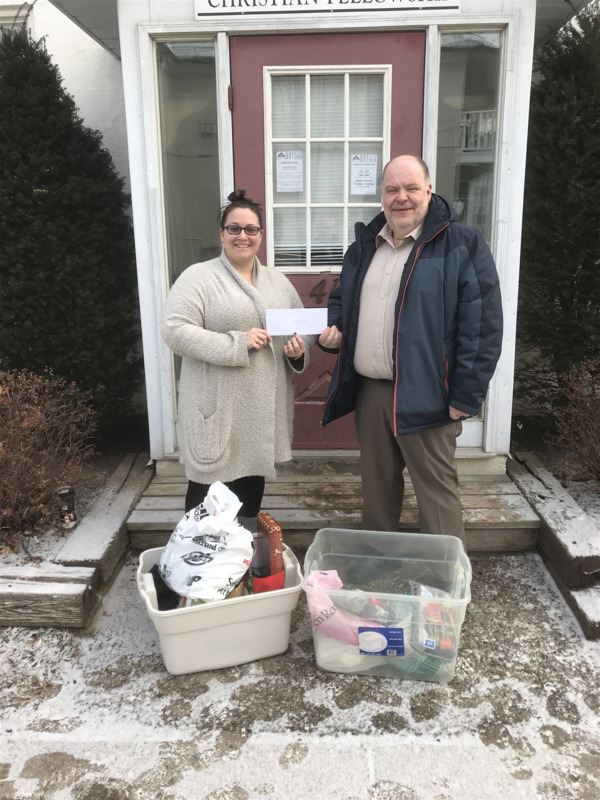 The clubs donation was also supplemented by $75 collected at the Alliston Community Christian School at their recent Remembrance Day Service. Rotarians, students and veterans at the cheque presentation. The Rotary Club of Alliston is proud to annouce that Paul Ruffo has been accepted as a member of the Rotary Club of Alliston. Paul was inducted at the October 3, 2011 meeting by our District Governor, Bob Wallace. 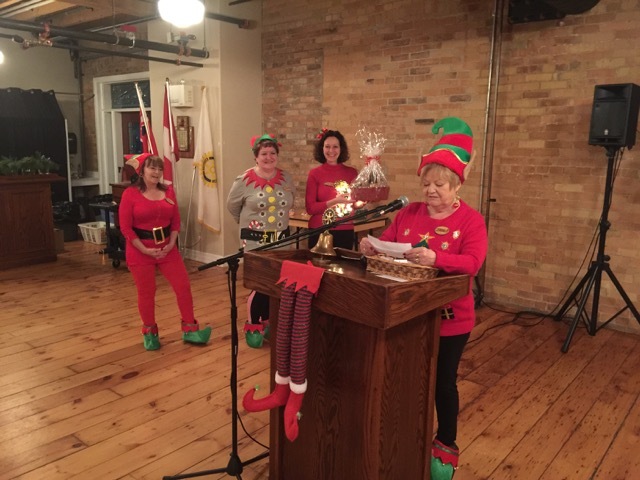 Donna Jebb Wins the Elgin Blakely Citizen of the Year Award! 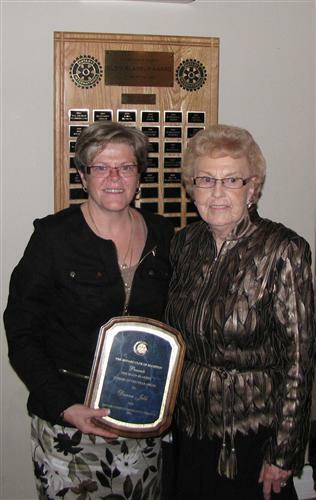 The Rotary Club of Alliston is proud to announce that Donna Jebb is the Elgin Blakely Citizen of the Year Award winner for 2010. Donna Jebb grew up in the Alliston Community and has been a volunteer on many organizations in the community for most of her life. She is a dynamic and vibrant volunteer with a reputation for innovation and longevity in local volunteer organizations. See the link below for all the organizations in the community that Donna is involved in. On Wednesday February 23, 2011, for short while the face of the Gibson Centre look very different. 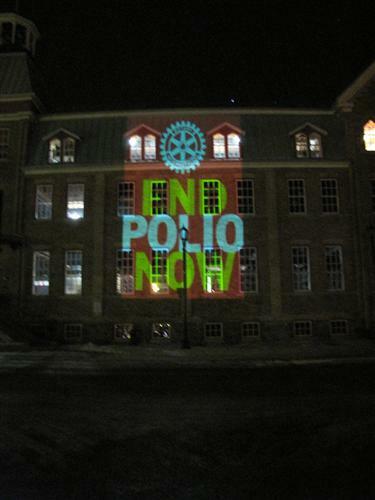 At 7:00 p.m. the outside of the buiding was bathed in the "End Polio Now" logo to celebrate the success of Rotarians and Friends elimination of the polio virus. Today, Polio is endemic in only 4 countries, India, Nigeria, Pakistan, and Afghanistan but the battle isn't over yet. The lighting up of building around the world on this day is a reminder that governments, foundations and Rotarian still have a lot of work to do. Only once the polio virus is eliminated from all countries will the world be safe from this disease. Today Polio is only a plane ride away. Support the End Polio Now Campaign. Visit www.trfcanada.org to make a donation. The fire was warm, as was the fellowship, as the Rotary Club of Alliston in partnership with the Herald and the New Tecumseth Fire Department hosted a great 12th Night celebration at Riverdale Park on January 7th, 2011. Special thanks go to Paul Foster and Don Smith for pulling everything together. There's nothing quite as fun as watching the surprise on peoples' faces when you tell them that the 4 hotdogs and 4 hot chocolates are a grand total of $2. This night is becoming an Alliston tradtion which is enjoyed by a wide cross-section of the community. 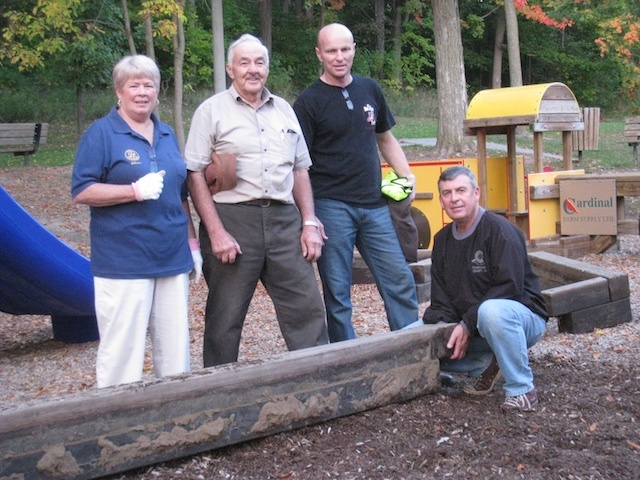 President John Endert represented the Rotary Club of Alliston at the annual Banting Volunteer Day on November 4, 2010. 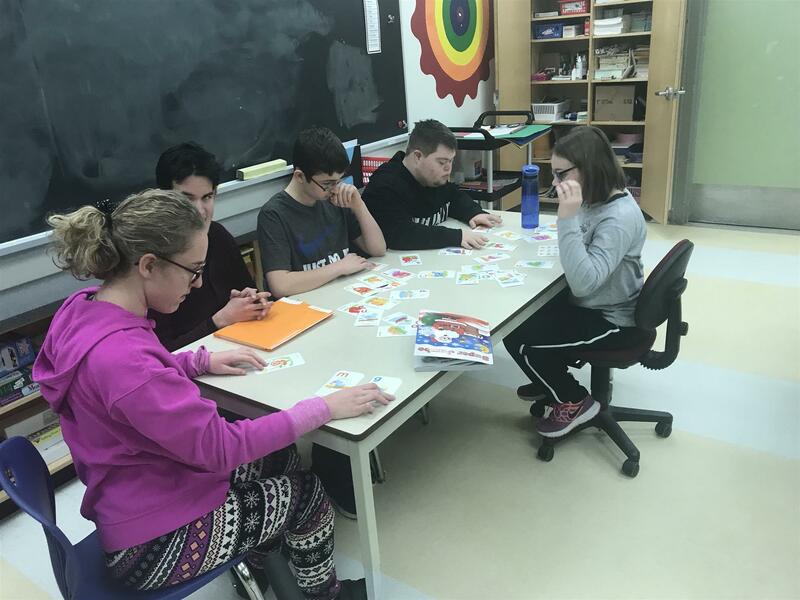 More than 20 other organizationswere all looking to impress upon Banting's grade 9 student population the importance of volunteering and the benefits that can be reaped by doing so. President did a superb job in telling students about how they could help our club throughout the year and more than 30 decided to offer their services. We look forward to having them work along side of us as we all put "Service Above Self". What a beautiful day we had to host the annual Foundation Challenge Walk! It really was a “walk in the park”, literally in Earl Rowe Provincial Park, and figuratively since everyone who participated made it so easy to have a wonderful day. Over 350 Rotarians and family and friends joined the members and friends of The Rotary Club of Alliston for a day of fabulous scenery, terrific fellowship, and tremendous generosity as District 7070 raised more than $125,000 for our Foundation. This is a great “kick start” toward our district’s Foundation goal this year. The walk began at our Rotary home, The Gibson Centre for Community, Arts and Culture. Early arrivers had the benefit of touring this building that, from 2000 to 2007, was transformed from “factory to fabulous”. The walk itself took place in the provincial park where participants were welcomed by the Honourable Earl Rowe himself and learned much information about the natural and cultural history of this hidden gem of a park. Lunch was served and formalities observed, with the introduction of club presidents, assistant governors, past district governors, the outbound Vocational Training Team, and the Youth Exchange students. The most significant was the introduction of this year’s winner of The Foundation Challenge Walk. 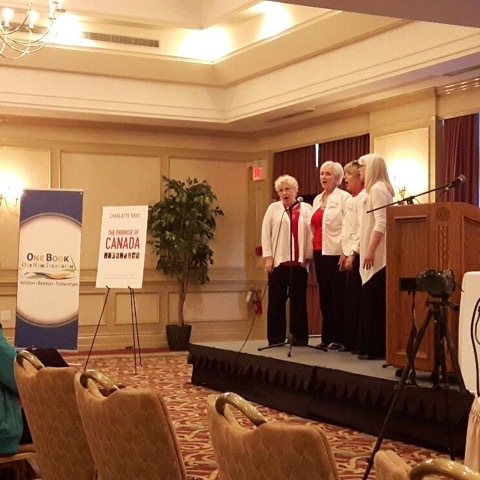 With the highest per capita pledge total, the honour of hosting next year’s walk is The Rotary Club of Cobourg. Well done and we look forward to another great walk next year. Once again, a huge “thank you” goes to all who participated. The walk began at our home, The Gibson Centre for Community, Arts and Culture. Early arrivers had the benefit of touring this building that, from 2000 to 2007, was transformed from “factory to fabulous”. The walk itself took place in the provincial park where participants were welcomed by the Honourable Earl Rowe himself and learned much information about the natural and cultural history of this hidden gem of a park. Lunch was served and formalities observed, with the introduction of club presidents, assistant governors, past district governors, the outbound Vocational Training Team, and the Youth Exchange students. 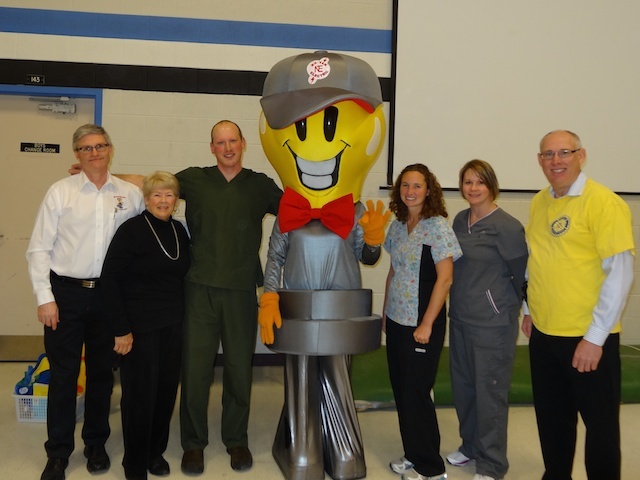 What do a denim humanoid figure, elementary school students, and volunteering have in common? 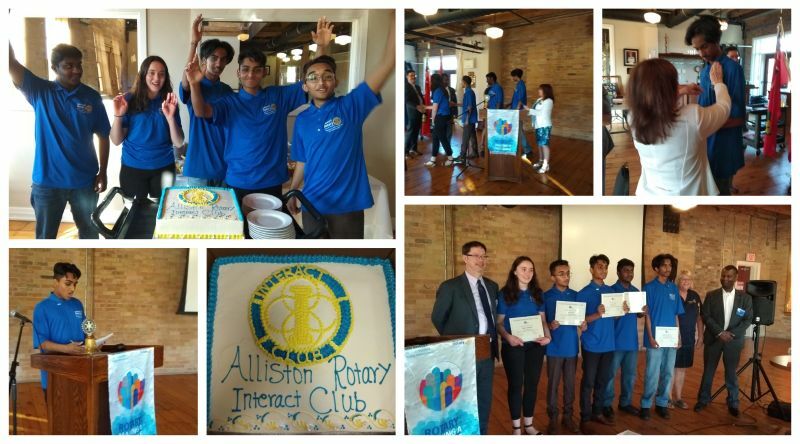 Recently the members of the Rotary Club of Alliston hosted a group of students, parents, and staff representing Ernest Cumberland Elementary School and Holy Family Elementary School. The students answered the question by talking about their “Who Is Nobody” experience to the club and explaining how pleased they were with the opportunity to help other people and learn something about themselves at the same time. 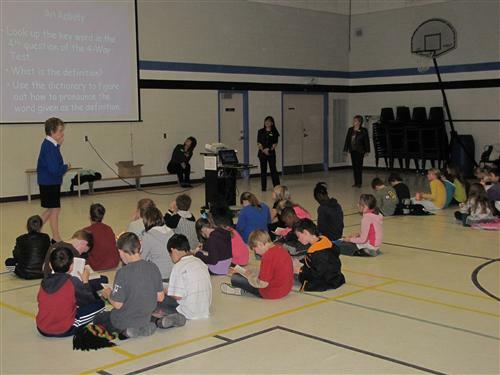 All grade 5 students in the five Alliston elementary schools have been given their own dictionaries. 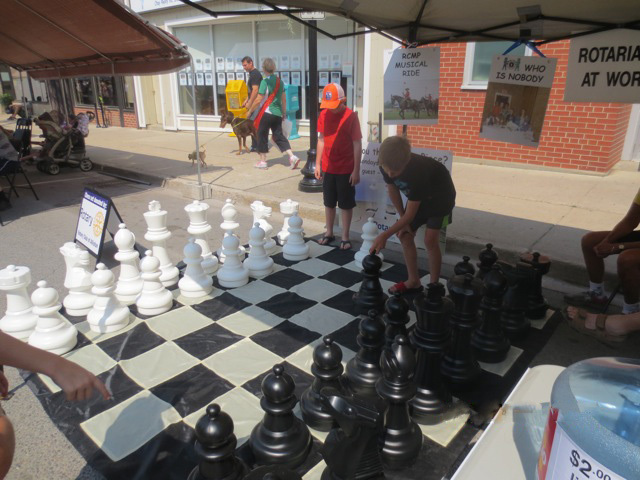 Kids, both big and small challenged their friends and family to a game a chess recently at the Rotary booth at the Potato Festival. 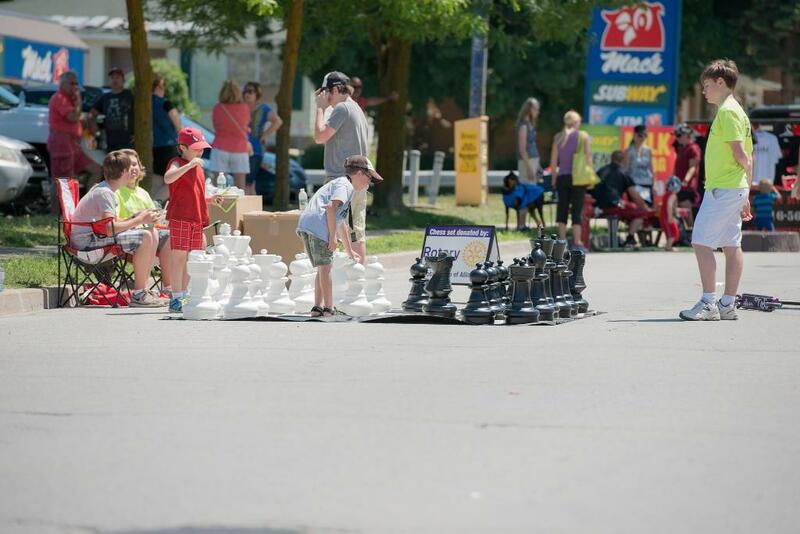 The chess set was recently purchased by the club to be used a festival and fair in the South Simcoe area. 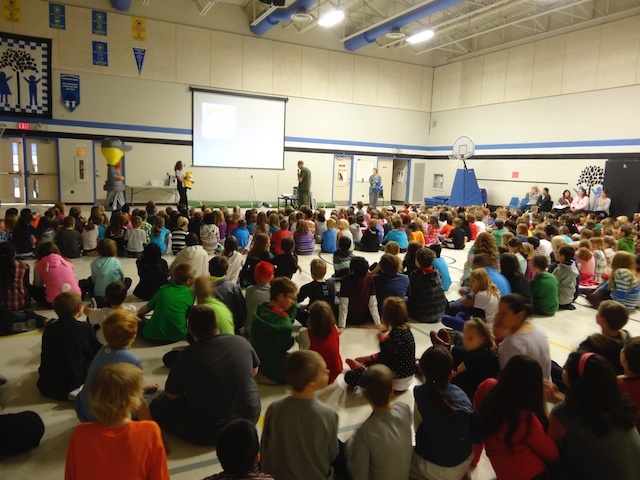 April 2, 2014 (Alliston) - Over 650 students (grades 1-5) from Ernest Cumberland and Alliston Union Public Schools participated in Brushamania. 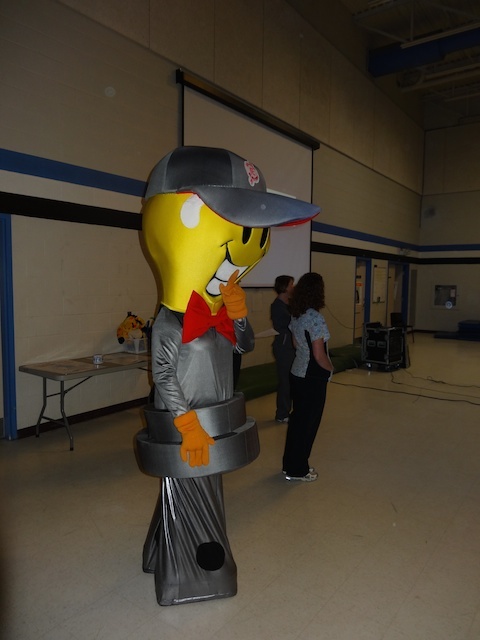 This is the second year the program has been in Alliston area schools. The sessions led by dentist, Dr Rob Kirsch and his staff from Kind Dentistry, taught the students about oral hygiene and proper brushing technique. They were assisted by the ever popular Dr. Watt. At the end of the presentation each student received a goody bag with a toothbrush, toothpaste, an educational colouring book and information about the Brushamania program. The program was once again sponsored by Nu-Tek Electric. If you are interested in becoming a member please complete this form and a Rotarian will contact you in the near future. Jan 11, 2014 - Rotarians and Friends from Alliston and Greater Toronto Area have arrived safely in Tanzania to continue the community building work in the Moshi and Kilema Regions. The team will be in Tanzania for 2 weeks meeting with local community leaders and following up on health care and water projects. Whenever they can, the team writes updates about their experiences on the Make An Impact Blog. If you would like to follow the blog you can visit www.makeanimpact.ca and click on the bog menu item. Join the Rotary Club of Allison in helping Syrian Refugees. The Rotary Club of Alliston has donated $1000 to ShelterBox Canada to help families displaced by the conflict in Syria. You can join our team by making a donation to ShelterBox Canada on our "Team Rotary Alliston for Syrian Relief" page. Click here to donate. 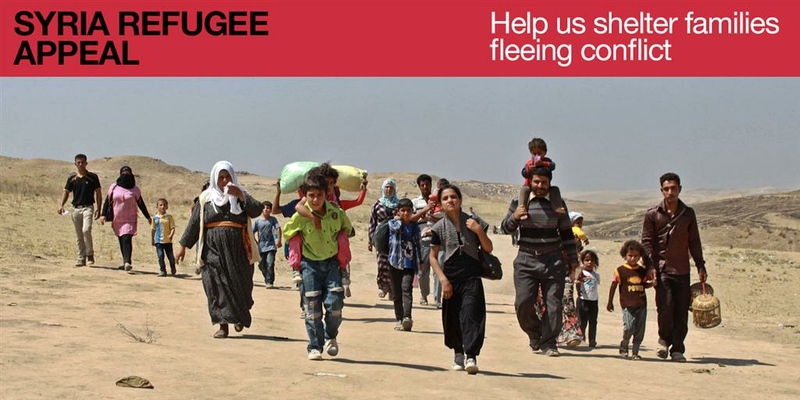 Note: If you donate, the email you get from ShelterBox Canada might say "Fund: Box - Undesignated" but we have been assured by ShelterBox that all funds donated through our team will go to support the Syrian refugee challenge. Jack's son has a new job at the hospital in Brantford. Jan was happy that Michelle planned a great holiday for her. Paul Foster was happy that he won a big hospital contract today. Jim Burkhardt was happy to be back at Rotary. Shirley was happy that she had a great holiday. John McFarland was happy that Brushamania was a big success. Draw was won by Jim Burkhardt but the Queen lives. Sue won the birthday draw and shared Carole's delicious cookies. Have you wondered what Rotary is all about? You could be the missing piece! Santa has been spotted near Everett!!! 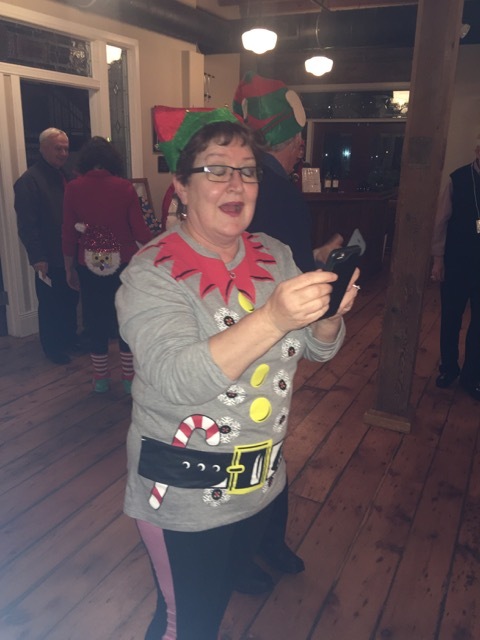 The Rotary Club of Alliston is selling Christmas Trees and Santa came to see what was happening at Rotarian Colleen Kotnisz's home on Saturday, Dec 1st. Rotarian Colleen lives on County Road 13 just South of Everett and has turned her front yard over to Christmas Tree sales. 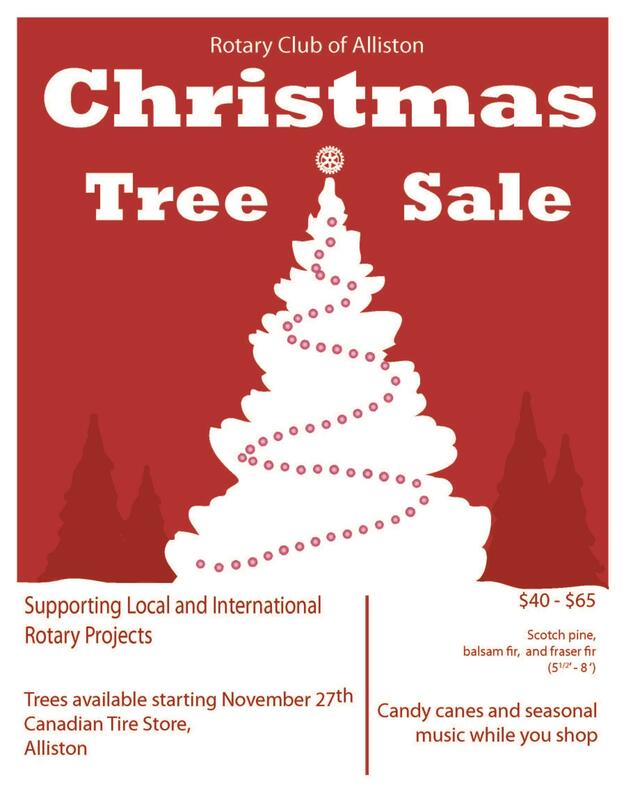 Everyone is encouraged to come and buy beautiful Christmas trees from the Alliston Rotary Club. Trees are available as long as they last. The RC of A along with our local Nursery Garden Centre Botanix, constructed plant boxes for the base of the Bandshell near the Rotary Pool in Alliston. Botanix then filled the boxes with beautiful evergreen plants. This was a gift to the Town from Botanix. New Tecumseth Parks and Rec Department have agreed to water these plants regularly. They are another beautiful addition to our Town. Canada Day - End Polio Now! Alliston [July 1, 2012] Canada Day saw many people celebrating Canada's Birthday in Alliston, Ontario. 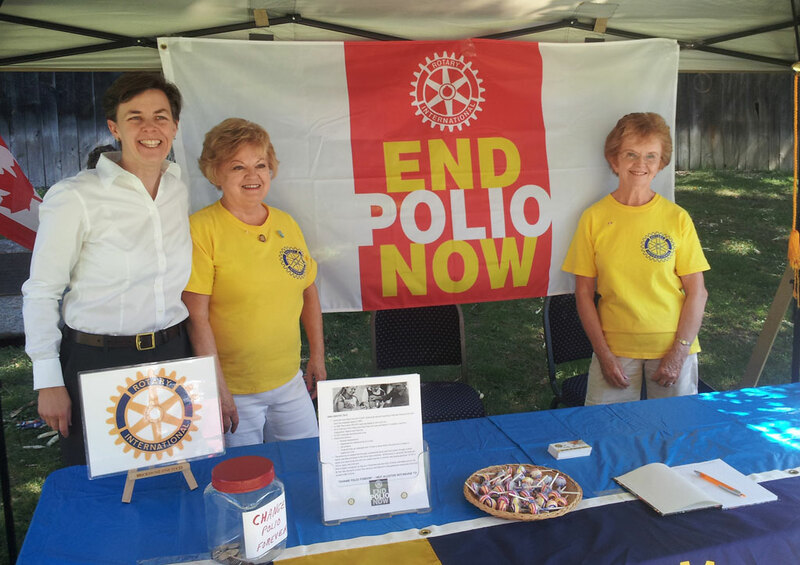 Rotarian's from the Rotary Club of Alliston took the opportunity to remind people about Polio Eradication and Rotary's role in the campaign. The "Change the World Forever" brought in over $35 to help fund the fight against this devastating disease. Dr. Kellie Leitch, MP was just one of many people talking with Rotarian's about this issue. Rotarian's Patricia Middlebrook and Joan Hayward with Dr. Kellie Leitch MP during Canada Day celebrations. Horses, Riders, Dogs and More! Alliston [June, 18, 2012] On June 16 and 17 the community of Alliston was invaded by police, dogs and horses. There was no emergency, just a celebration of Canada and Community. 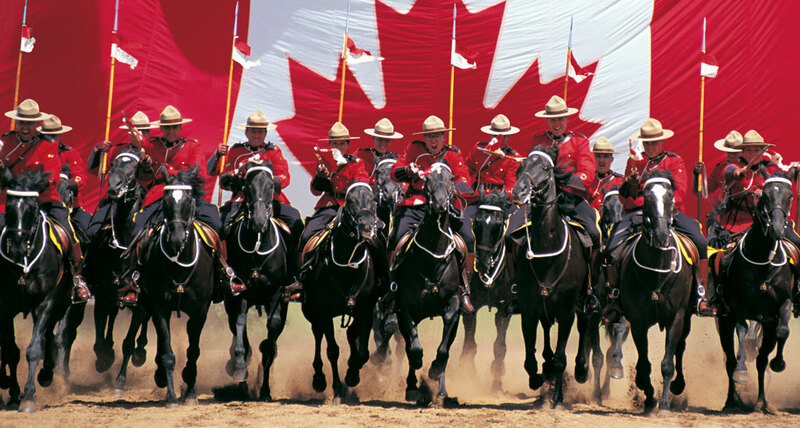 The RCMP Musical Ride shows this past weekend in Alliston wowed thousands of people with their grandeur, precision and beauty. On Saturday and Sunday 32 riders and horse walked onto the field at the National Focus Soccer Field and gave the crowds 30 minutes of excitement. The highlight of the show for many was the chance to meet and greet the riders and horses in person at the edge of the performance area after the show. 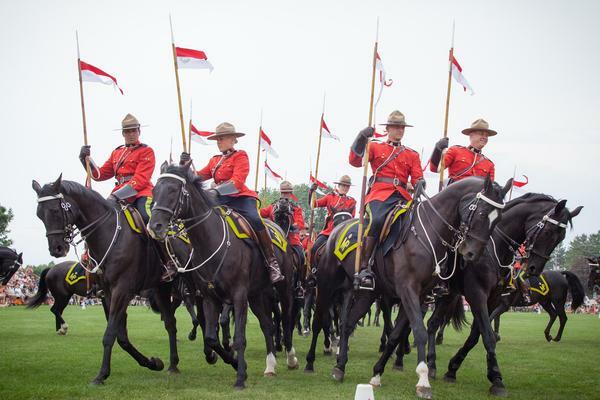 The men and women of the RCMP Musical Ride were friendly and shared stories of their experiences this summer including their participation in Queen Elizabeth II Diamond Jubilee celebrations. Many people followed the riders back to the stables at the Alliston Memorial Arena where they had another chance to interact with riders and horses as they wound down from their performance. Although the Musical Ride was the main attraction they were nearly eclipsed by OPP Canine Unit in the Alliston Business Improvement Association Pre-show. The dogs and handlers put on a fun and informative show demonstrating the teamwork and skills used by the Canine Unit on a daily basis. "Criminals" were aprehended, firearms were found, "drugs" were sniffed out. Serious work demonstrated with a great sense of fun. During the short break between the OPP Canine Unit and the RCMP Musical Ride the crowd was entertained by The Clans of Tecumseth Pipe and Drum Band under the leadership of Pipe Major Brian Kirk. The music of the pipes and drums filled the field as we waited for the Musical Ride to arrive. The Rotary Club of Alliston thanks everyone for coming out to the show and a special thanks to our partners, The Town of New Tecumseth and County of Simcoe for their support. Don't miss you last chance to see the horses and riders of the RCP Musical Ride up close and in person. The stables at the Alliston Memorial Arena are open all day. Please drop by and thank the riders and horses for 2 great shows this weekend. Please enter stables from the south entrance off Albert street. The Elgin Blakely Citizen of the Year Award is presented annually by the Rotary Club of Alliston to a citizen of South Simcoe who in 2011 and the past has actively worked for the betterment of our community, and demonstrated the Rotary motto of “Service Above Self”. The winner is selected by a committee of prominent citizens who review nominations submitted from all over the community. 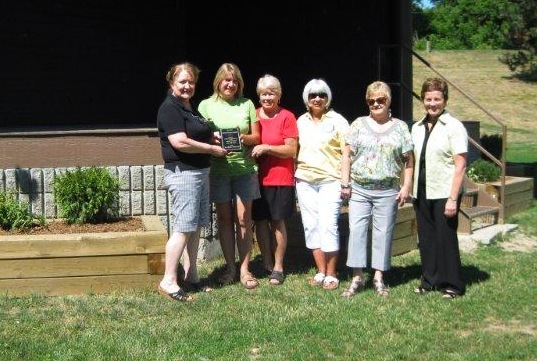 The Rotary Club of Alliston is proud to announce that the Elgin Blakely Citizen of the Year - 2011 will be presented posthumously to Jean Gradwell. Jean Gradwell was a quiet and persistent advocate for justice and human rights. She was passionate about people and families. Through the Outreach Committee of St John’s United Church Jean was responsible for bringing refugee families to Alliston. After seeing a special presentation on AIDS Jean spearheaded and established the “Grandmothers to Grandmothers” chapter for New Tecumseth Grandmother’s Embrace. She was an advocate for women and girls supporting the Big Sister Association and helping to establish “My Sisters Place”. 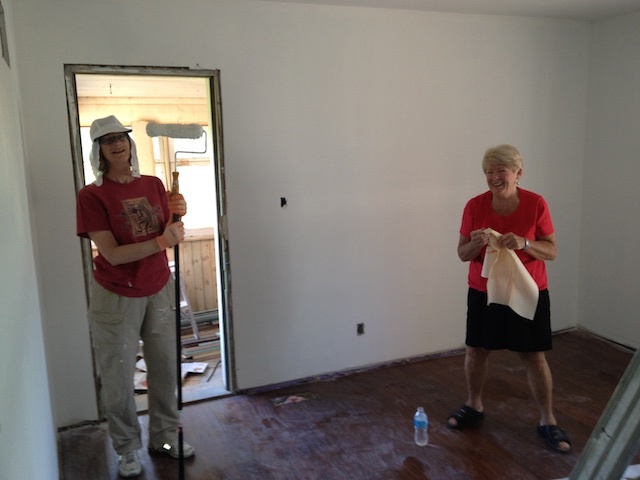 Jean was on the Board and very active in the New Tecumseth “Habitat for Humanity” program. Jean will be formally recognized at the Clarence Leach Rural Urban Dinner on Monday April 9th, 2012. Members of her family will be accepting the award on her behalf. Please join us to recognize and celebrate Jean winning this prestigious award. For tickets to the Clarence Leach Rural Urban Night or more information about the Elgin Blakely Citizen of the Year Award please contact David Green by phone (519) 925-1268, email at rotaryalliston@gmail.com. Tickets are $ 40.00. An original piece of visual art. The club received numerous excellent contributions from Ms. Matchett's grade six class. Thank you all for your great entries. The following 3 were selected as the winners in their category. All it took was one idea from one man to change the lives of millions forever. In 1905 Paul.P.Harris an attorney in Chicago, Illinois decided his dream of having a professional club with a friendly spirit like the small town he grew up in would become reality. There are 34,000 Rotary clubs world wide. The club was named the Rotary Club because of the early practice of rotating meetings among different members ofﬁces. The Rotary Club's main objective is service in the community, in the workplace and around the globe. The Rotary Club believes in Service above self, and try's hard to teach this meaning to many young and old. The Rotary Club has started programs for students and youth that change the lives of all those who participate and teach them the values of helping those in need. 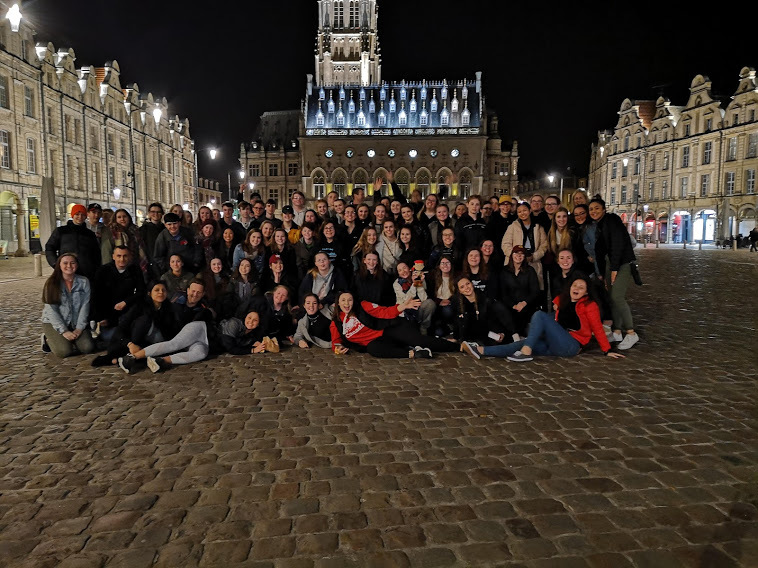 Through these programs students can earn scholarships, travel on cultural exchanges, or help a community through a service project. We can help the Rotary Club to spread the message Service above self by volunteering at fundraisers, giving needed stuff to those less fortunate and inﬂuencing others to give back and put others before themselves. The Rotary Clubs motto Service above Self means to me... that the Rotary Club is trying to teach others that they need to learn how to put others before themselves and that we may not think we are lucky but others around the world and even in our community are struggling and we can help if we try and give to those who need our help. 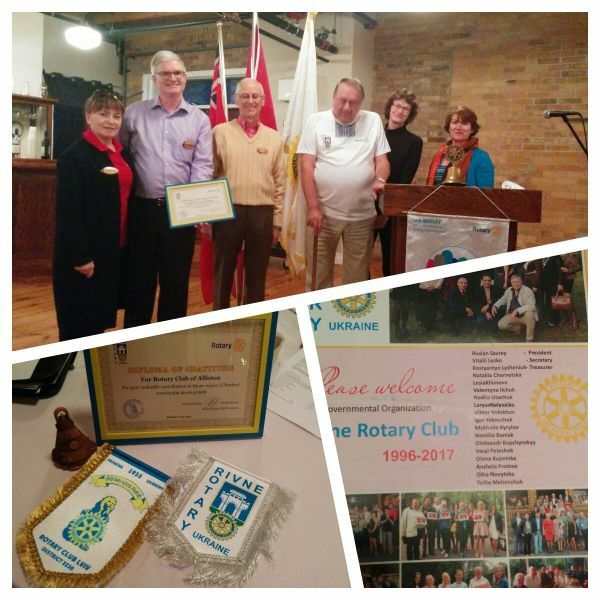 Throughout the years the Rotary Club has given our community of New Tecumseth and beyond so much. Even on the coldest of winter days the Rotary Club ﬁnds a way to warm up our hearts with a large ﬁre. For as long as I can remember me and my family has been going to the annual Christmas tree burning were we warm up by the beautiful bright shining ﬁre, drink some delicious hot chocolate and go sledding down the hills. 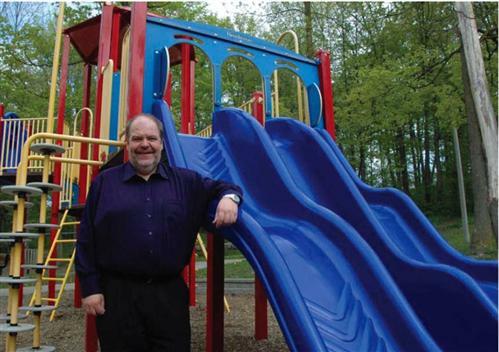 Thanks to the Rotary Club Alliston has a beautiful park where kids enjoy the playground and families bond on nature hikes. 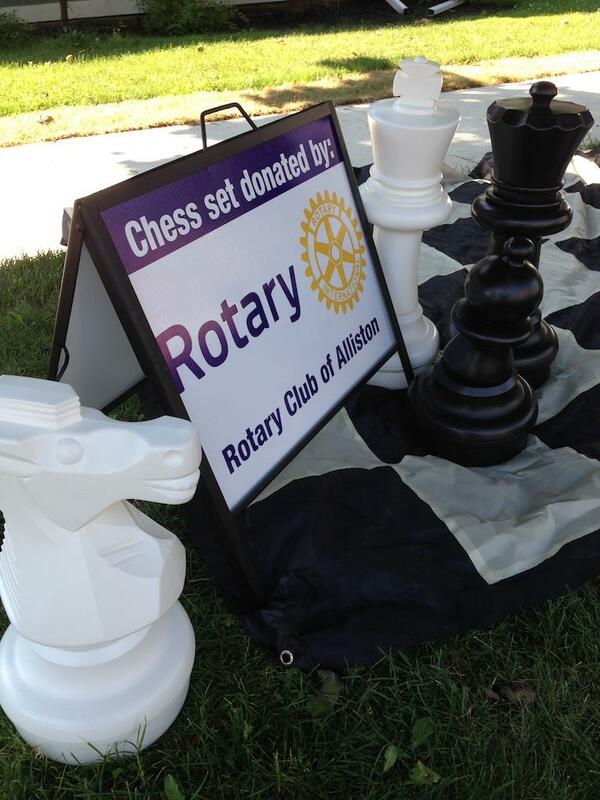 Just this summer one of the Rotary Club's latest projects opened up. The Rotary Club provided Alliston with an amazing swimming pool which cools off everyone on hot summer days. The Rotary Club does lots for Alliston but just as much for the world. For 25 years now the Rotary Club has been working on stopping polio, a crippling and potentially fatal infectious disease that that mostly strikes children mainly under the age of 5 in countries like Asia, Africa, and the eastern Mediterranean region. 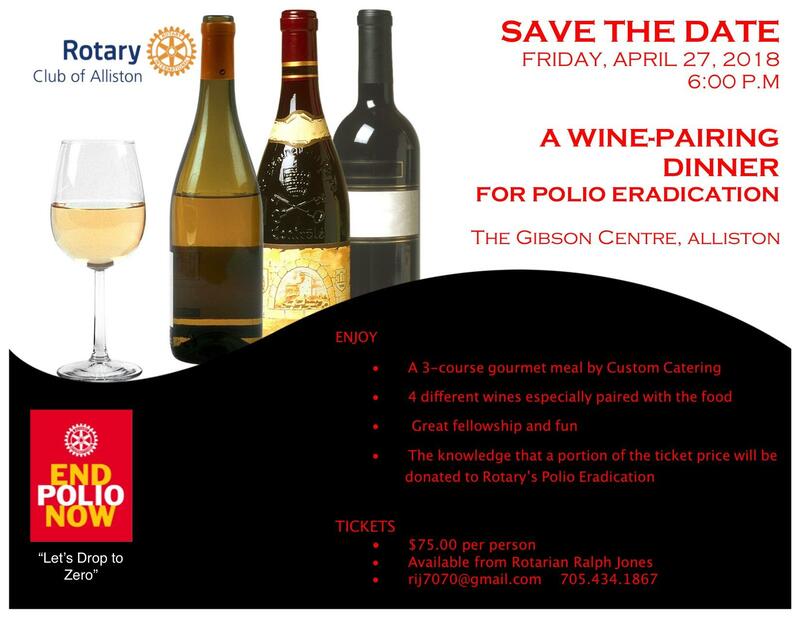 We can help the Rotary Club to end polio now by supporting there fundraisers and giving to those who have polio. The Rotary Club is an amazing volunteer service organization with over 1.2 million members that give back to those in need and teach those not in need to give to those who have less then them. Remember all of this only started from one idea to change the lives of millions forever and you can help change millions more. Thank you to all those in the Rotary Club who dedicate their time and hearts to helping build our community! Join the Rotary Club of Alliston on April 9, 2012 as we celebrate service in our community by presenting the Elgin Blakely Citizen of the Year Award. 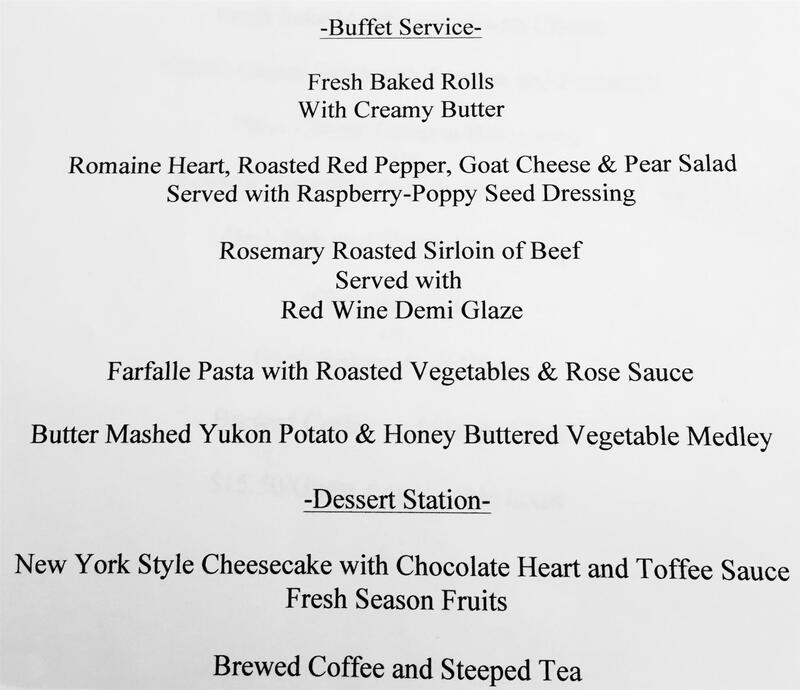 The Rural/Urban dinner will be held at the Gibson Centre, with the reception at 6:00 pm and dinner at 6:45 pm. Ticjets are $40. 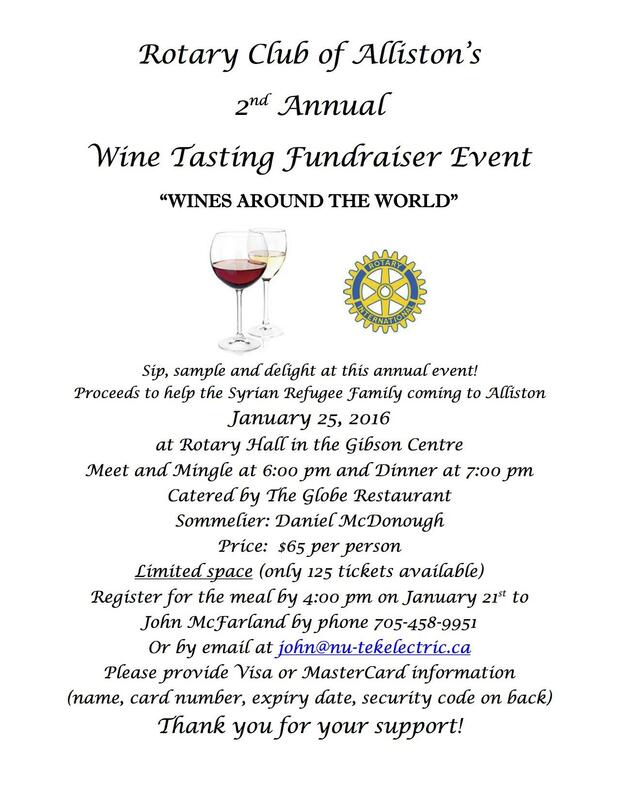 For ticket information please contact the Rotary Club of Alliston at allistonrotary@gmail.com. Lots of families had fun at the Twelfth Night Celebration in Alliston on Friday January 6, 2012. The Rotary Club of Alliston in partnership with Fire Fighters of New Tecumseth and the Alliston Herald hosted a night of sledding, food and music around a great bonfire. Hot dogs and hot chocolate were provide by the Rotary Club of Alliston at the family friendly price of 25 cents each. Craig Widdfield from the Hearld DJ'd the tunes and kept the crowd hopping. The guys from Station # 1 lit the fire and kept everyone safe. December 30, 2011. 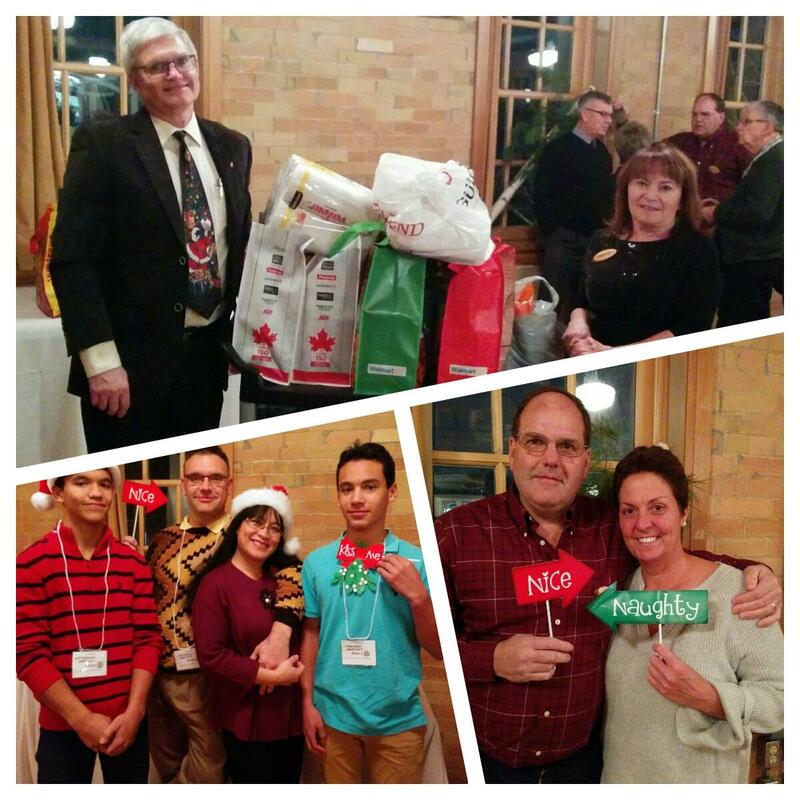 With the year coming to a close there was one more opportunity for the Rotary Club of Alliston to be of service in our local community. A crew of Rotarians and others assembled at the New Habitat for Humanity build on Dufferin St. to get a jump start on the interior painting. Three bedrooms, all the ceilings, the hall and the main great room needed paint. Our job was to bring colour to the house. Bedrooms for the kids in bright green and "Barbie" pink with a more subtle mauve for the mom. Each room was attacked by a small team with the new homeowner and her family joining us. By midday, when grandma brought the kids over the bedrooms were mostly done. A small team of Rotarians returned the next day to paint the hall and the great room. The building crew were very supportive and appreciated the "leg up" on getting the painting done. Check the Habitat for Humanity website for details on the official opening in late January. Thanks to all who came out and helped make this home a reality for the family. 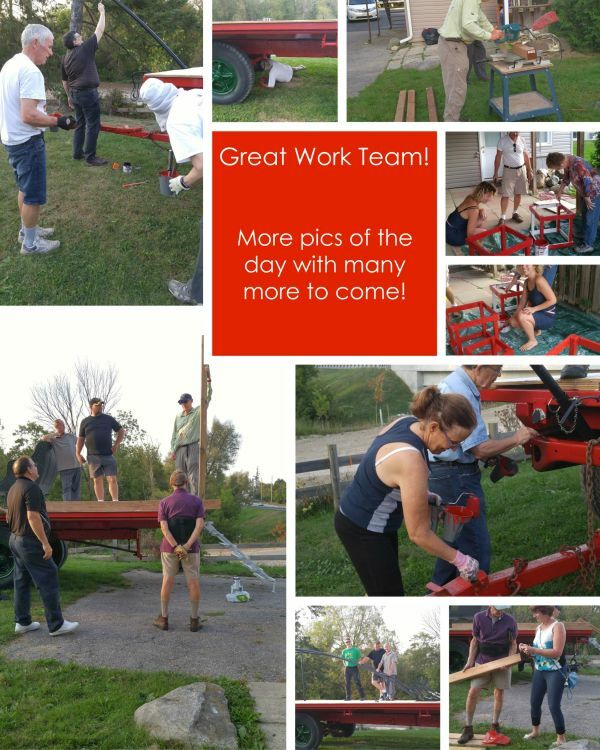 Click here to see some pictures of Rotarians at Work. Join the Rotary Club of Alliston, the New Tecumseth Fire Fighters and the Alliston Herald to celebrate Twelfth Night in Alliston on Friday, January 6th, 2012 at the Rotary Pool parking lot. In medieval England, the Twelfth Night marked the end of a winter festival that started on All Hallows Eve — now more commonly known as Halloween. 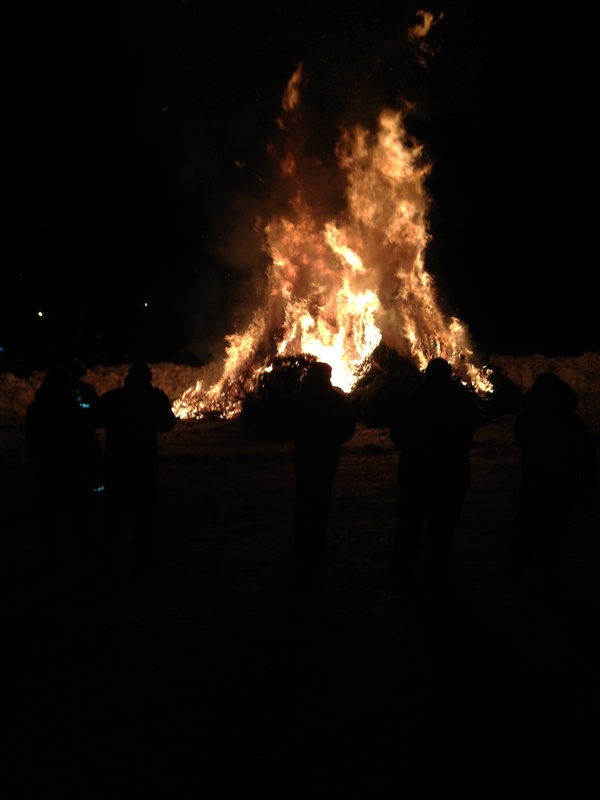 We celebrate the night with the burning of Christmas trees, tobogganing and sledding and general family fun. 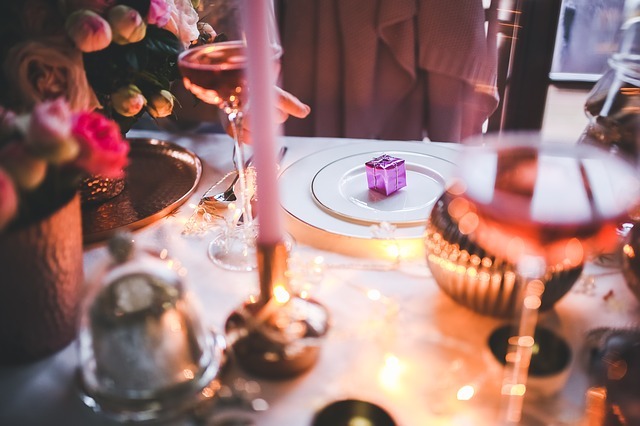 Food and drink are the center of the celebrations in modern times, and all of the most traditional ones go back many centuries. In keeping with this tradition, the Rotary Club of Alliston will serve hotdogs and hot chocolate for the very reasonable price of 25 cents each. Proceedings start at about 6:30 pm. with fire lighting the sky at 7:00 pm. Come and join in the family fun. 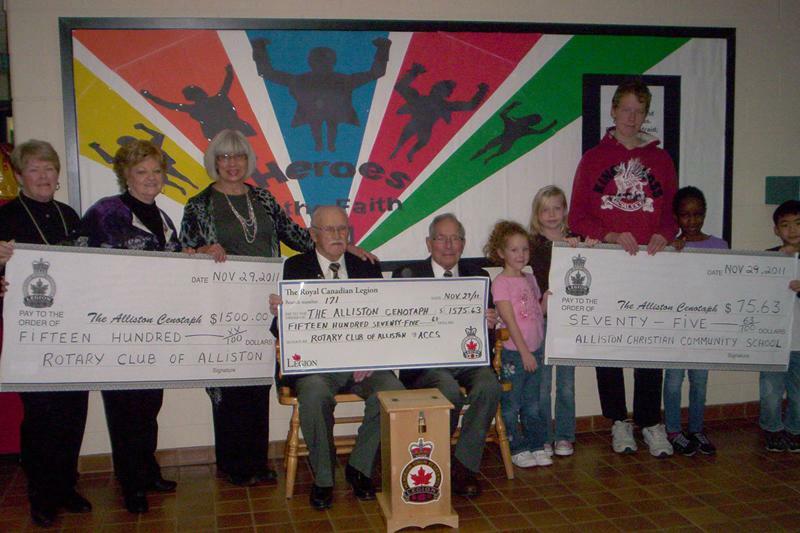 The Alliston club has received $30,000 from Foundation which, together with $12,000 from six clubs, means that the Foundation global grant is worth $42,000. This grant has been awarded in order to provide equipment for the Kirua Public Clinic, Tanzania, to improve maternal health and birthing along with HIV testing. The clinic serves a community of 20,000 people close to the Kilema region. The 2012 Tanzanian team’s money will pay for materials to repair the clinic prior to the equipment being shipped, sometime probably in March 2012. Measurements that will be taken by the clinic personnel are expected to indicate an improvement in the birthing of healthy babies and fewer mother deaths. Measurements should also indicate more people being tested for HIV/AIDS and treatment of the same at the HIV/AIDS clinic. 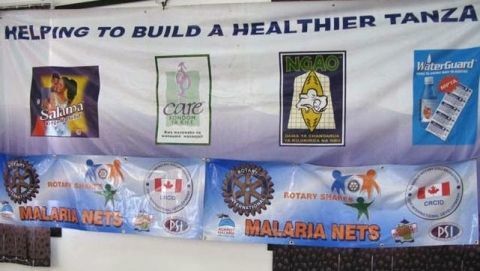 This clinic was built in 2007-08 with a lot of Rotary money and sweat equity from Alliston and District 7070 Rotarians, together with our partner CACHA. Our partners in the Kirua clinic project are the Rotary clubs of Bradford, Cobourg, Etobicoke, Markham Sunrise, and Quinte Sunrise. 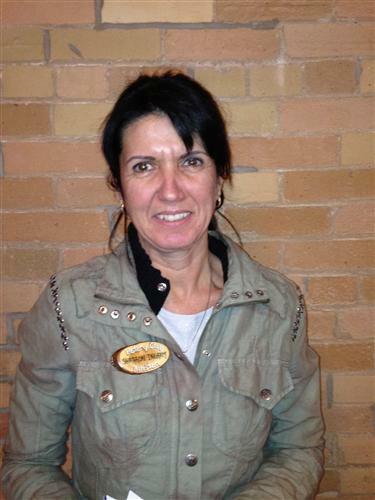 The Rotary Club of Alliston is proud to announce that Valentina Deek is now a member of the club. The street were lit with thousands of lights and the sounds of Christmas rang out from the floats on the streets of Alliston on Saturday. Over 35 floats and participating groups walked the route and many families enjoyed the sights and sounds. Thank to Bill Wray and his team for again putting together a great evening. All the letters collected for Santa are now on their way to the North Pole. Date for next year’s parade is Saturday, November 24th, 2012, 6PM start. Over the last month Rotarians from the Alliston Club have had the opportunity to visit with students from a number of schools in the area. The grade five students at Ernest Cumberland were excited to each receive their own Rotary Webster Dictionary. Within each personalized dictionary the 4-way test is listed. Rotarian Joan Hayward explained the 4-Way test to the students and helped them understand how they can use the test when they have to make a difficult decision. Dictionaries were distributed, as well, to grade 5 students at Holy Family and St. Paul’s Catholic Elementary Schools. At each of the 3 schools, Rotarians stressed the importance of volunteering, even beginning at a young age, to help make a difference in our community and abroad. The students were encouraged to get involved right away and, as inspiration, the Rotary Club of Alliston’s volunteer work was highlighted. The Rotary club of Alliston is proud to announce the induction of a new member, Sharron Ingram. Rotarian Bill Wray was recently inducted into the Alliston Herald Hall of Fame for his volunteer work with Rotary in the community. Bill's family and some of his Rotary friends were there to congratulate him as he received this recognition. Bill has been key player in many community events and projects in the last 5 years. These include the Rotary Adventure Playground, Polo for Health, Potato Festival Parade and concerts, the Night Lit Santa Claus Parade, just to name a few. Click here to see Bill's story in the Hall of Fame Magazine. 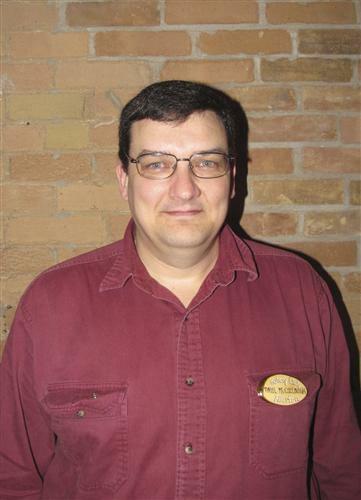 The Rotary Club of Alliston is proud to announce that Paul McCullough is now a member. Paul was inducted at the October 3, 2011 meeting by our District Govenor, Bob Wallace. 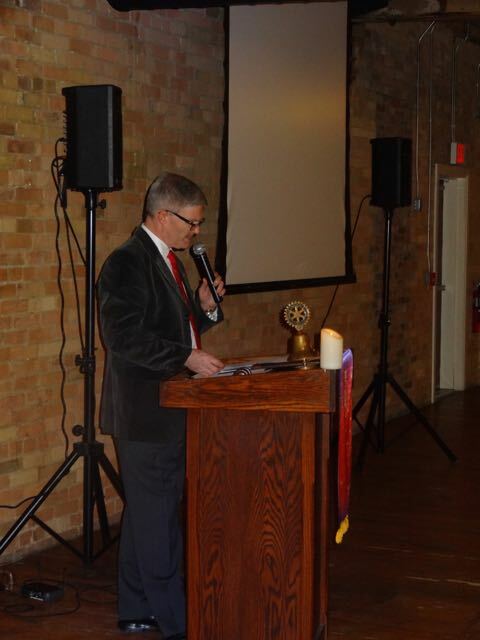 Recently Picton Rotarian Robert Bird was the guest speaker at the Rotary Club of Alliston. Robert provided and update on the Atorkor Voctaional Training Centre in Atorkor, Ghana. The Atorkor Vocational Training Centre has just been built in an economically devastated coastal area, with 90% youth unemployment. It is desperately needed. When Picton Rotarian Peta Hall first went to the Village of Atorkor in Ghana, at the request of the Atorokor Development Foundation, she saw the incredible poverty and hopelessness caused by the destruction of the local fishing by foreign trawlers. Her dream was to find the funds and oversee the construction of a self sustaining economic training centre in this small fishing village. Picton Rotary, with financial help from other district clubs, and the community of Prince Edward County, supported her dream with a quarter of a million dollars in contributions. 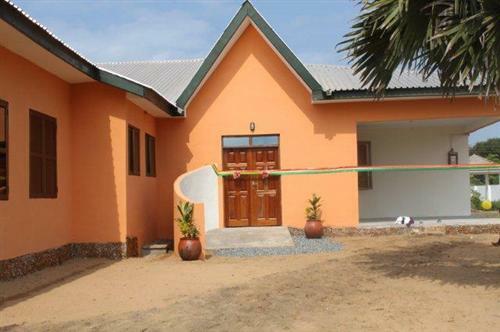 These funds have allowed local Ghanaians to build the centre. Now that the bricks and mortar phase is completed, the first phase of the dream has become a reality! For more photos of the centre and the opening ceremonies click here. With Rotarian Mike Barzo leading the way the 2011 Potato Festival Parade was another big success. 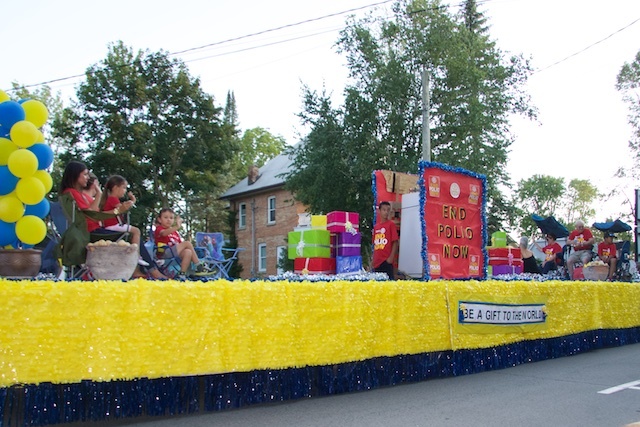 This year's parade grew by 10 floats and took about 1:20 minutes to pass through Alliston. The streets were lined with people young and old enjoying the sights and sounds of the parade. 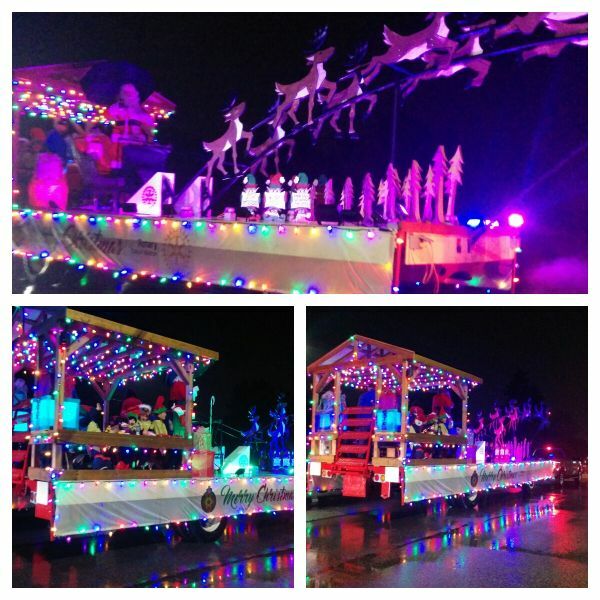 One of the additional floats this year was the Rotary float organized by Rotarian Carol Struthers. A big thanks goes to Mike for taking on the very large job organizing the parade, Carol for leading the float decoration and all the Rotarians who helped, marshal the parade, and decorate and ride on the float. Great work. Click here too see more Rotary Float Photos. On Saturday President Bev hosted our first Potato Festival Tag sale at her home on Albert St. With the help of a crew of sellers and movers the team raised over $1000 for the clubs projects in the community and overseas. Another great first for the club. You may have noticed a new flag flying at the New Tecumseth Municipal Offices. The Rotary Club of Alliston and the Town are flying the End Polio Now flag in recognition of End Polio Day. Since 1985, eradicating polio worldwide has been Rotary's top philanthropic goal. Rotary has contributed more than US$1 billion and countless volunteer hours to protect more than two billion children in 122 countries. In addition to India, the disease remains endemic -- meaning spread of the wild poliovirus has never been interrupted -- to Afghanistan, Nigeria, and Pakistan. Until endemic polio transmission is stopped, other countries remain at risk for imported cases. For further information visit, www.rotary.org/endpolio or www.polioeradication.org. Recently a number of Rotarians got together to do some packing. Not luggage, but a rather a large container with medical supplies headed for Thailand. The medical supplies are bound for the Khopho Hospital in Pattani, Thailand. The shipment is being facilitated by the Rotary Club of Pattani who will recieve and distribute the supplies. The supplies were collected by Rotarains from local hospital facilities. They should arrive in Thailand early this summer. If you would like to participate in this year's Nite Lit Santa Claus Parade on Saturday, November 26, 2011 please click on the link below for information and application forms. Ninety six golfers enjoyed a day of fun and fellowship at the Woodington Lake Golf and Country club at the Rotary Club of Alliston Ingaugural Golf Tournament. Mother nature cooperated with a beautiful, but hot day for the round. When the divots had settled the golfer enjoyed a cool drink and great meal at the club house. A big thank you goes to all the sponsors, Woodington Lakes and their staff and to all the volutneers who helped make the tournament a big success. All the funds raised will go towards Rotary projects in our community and overseas. For more photos visit the Golf Tournament Photo Gallery. Watch for this Public Service Announcement on your local A-Channel. 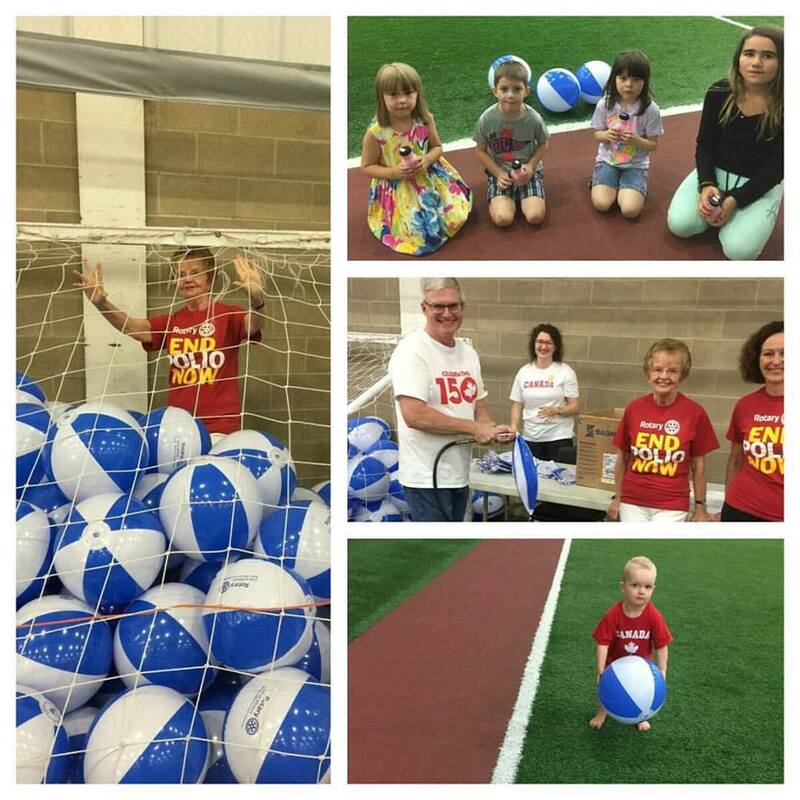 The final numbers are in we can now announce that Polo for Health had another great year. This year the event raised $20,272.76 for the Digital Mammography Campaign. Over the last 9 years this event has raised $188,004.26 for diagnostic imaging equipment at Stevenson Memorial Hospital. A big thanks goes to our major sponsors, The Alliston Herald, The Egan Foundation, and the Nottawasaga Inn Resort for their support. This event would not be possible without the help by volunteers from throughout the community. Thank you. Please watch this site and www.poloforhealth.ca for details about Polo for Health, 2011. On Saturday September 11, 2010 the Roatry Club of Alliston and the Lions Club of Alliston were proud to host a number of dignitaries and members of the pulbic at the re-opening of the Octagonal Drive Shed at the Banting Farm. The buidling has been restored to its original condition, with some "hidden" updates to ensure a safe and practical building for the future. 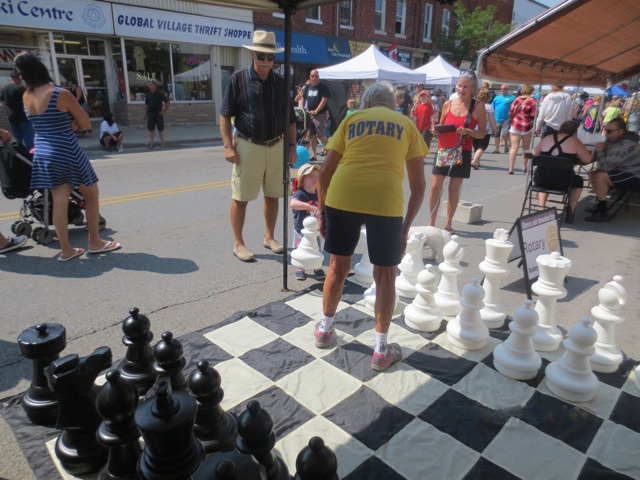 Rotarians and Friends of Rotary were evident throughout the community on the Potato Festival weekend. The parade kick off the weekend with a great demonstration of community spirit. Many floats and and bands walk the route with thousands of people watching on. Great work Mike Barzo, Ron Fischer and the rest of the team in making this another fun, family event. Saturday found Rotarians in many roles throughout the community supporting the festival. Rotarians were seen flipping pancakes at St. John's United Church, dancing on playing music on the streets, flipping burgers, promoting our community and many other jobs. Saturday night all hands were on deck for the Blue Rodeo Concert. The concert was well attended and both bans, The Beauties, and Blue Rodeo put on a great show. Big thanks to Bill, Paul and Carole our concert team for staying positive and creating a great concert. Seventy eight Rotarians, spouse and friends of Rotary worked together at the concert to create a fun, safe evening. Enjoy the great music of Blue Rodeo. Click on the banner to learn more about the concert. Support the Stevenson Memorial Hospital Foundation and It's Crystal Clear Digital Mammography Campaign by attending this great family event. Click on the banner below for more information and to reserve a table. 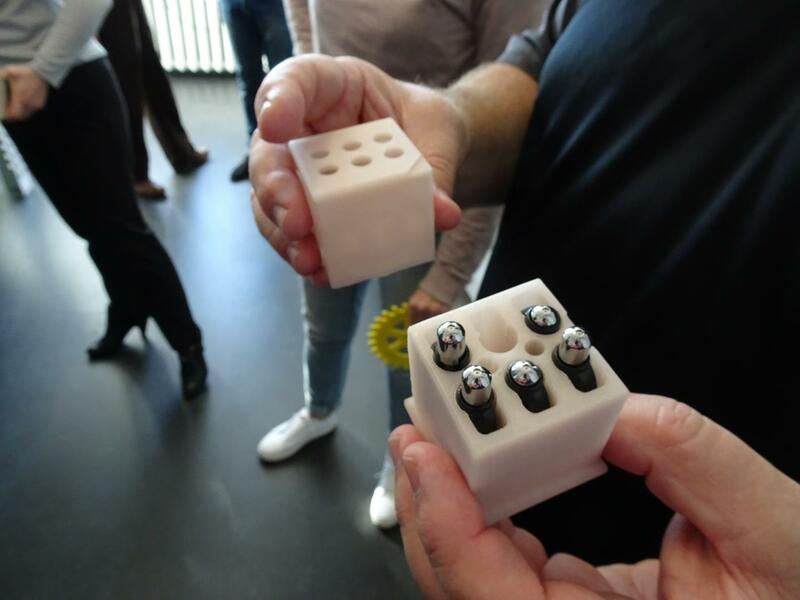 Have you heard of Rotary, but don't know what it's about? Have you attended a Rotary sponsored event? Do you know a Rotarian and want to know more? 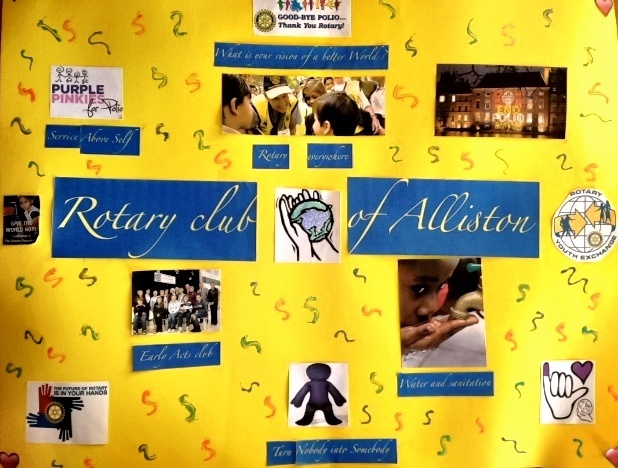 Whatever the reason, the Members of the Rotary Club of Alliston would like to meet you. Come and learn about some interesting projects, meet some great people and enjoy some cocktails and hot hors d'oeuvres. 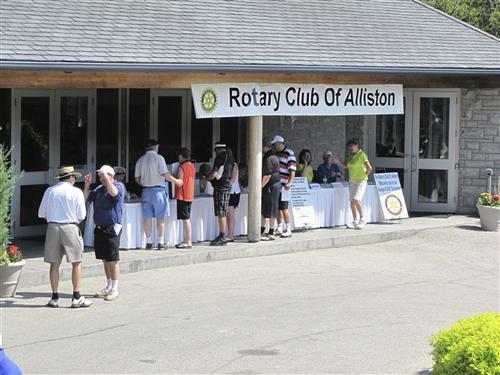 The Rotary Club of Alliston has been an integral part of the community for more than 50 years. As part of the world wide Rotary International service organization, the Alliston Rotary Club has contributed both in our community and throughout the world through humanitarian projects. 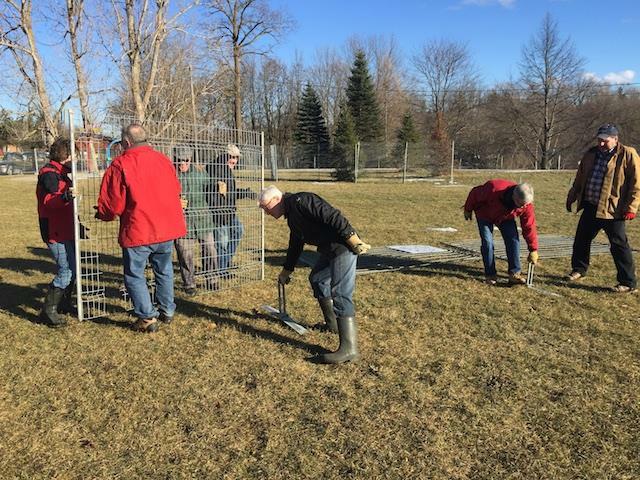 In the Alliston area, these projects include the building of both the Rotary Pool and the Adventure Playground in Riverdale Park, sponsoring local groups such as Mathews House, Girls on the Run, Alliston Seniors, Community Policing Committee and others. In the international arena the Alliston Club has most recently been involved in rebuilding a village in Phuket, Thailand that was devastated by the Boxing Day 2004 Tsunami. Some of our members have also travelled to Tanzania to give of their labour, time, and expertise to help build a school and fresh water facilities. Long time Alliston resident and business owner, Herb Oliver tonight was recognized for contributions to the community when he received the Elgin Blakely Citizen of the Year award at this year's Clarence W. Leach Rural Urban night. This award is given to a citizen of greater Alliston who has actively worked for the betterment of our community and who has been selected by a committee of prominent citizens. Anyone in the community can nominate someone for this award. All citizens are eligible.The Elgin Blakely Citizen of the Year Award was first presented in 1982 and is given to the person who best exemplifies "Service Above Self". Over the years the recipients of this award have represented the very best that is in our community. Many of them started "giving back" when they were young and have made volunteering a life-long commitment. Since moving to Alliston in 1953 with his wife Gertie, Herb has been the backbone of his church, the Rotary Club and the Masonic Lodge. For the full details of his nomination follow this link. Santa Claus Parade - Saturday Nov 28, 2009 - 6:00 p.m.
Saturday night the main streets of Alliston were alive with the sounds and sights of Christmas as 30 brightly lit floats moved slowly through town. The streets were lined with families enjoying the creative festive floats and Christmas music. Congratulations to these groups and big thank you all the participants, volunteers and families for helping make the evening a success. To contact the club by email "click" on the name of a club officer in the left hand column. 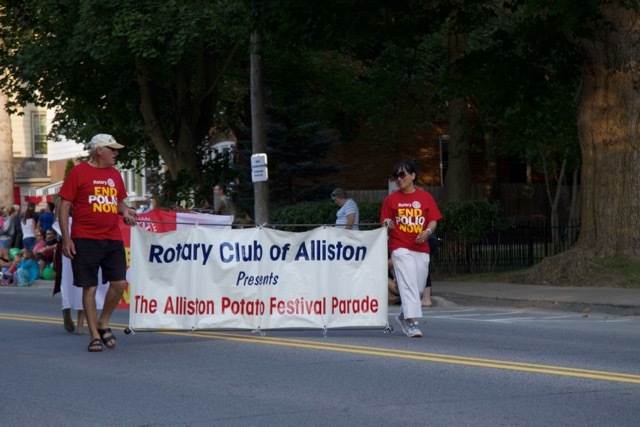 With having pledged the highest per capita amount for this year's Foundation Challenge Walk, the Rotarians of the Alliston club will host the Foundation Walk 2010. 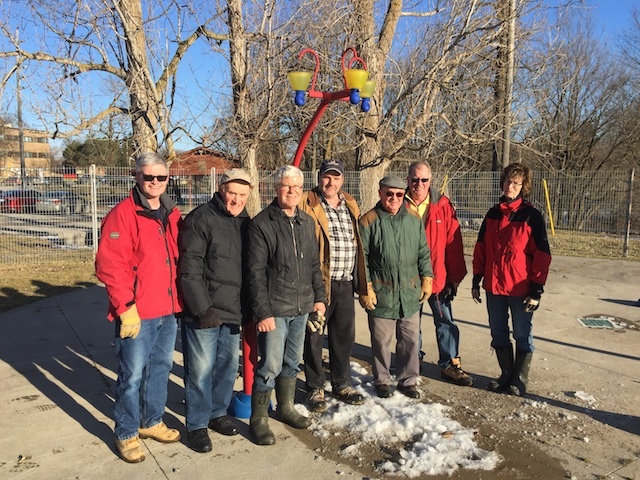 Rotarians help build pathways and a pergola for DeafBlind Ontario in Innisfil. Megan turns "Nobody" into Somebody!! Click here to read the story how Megan accepts the challenge. of young children. Read how Rotary is helping to save lives. Over one thousand people from Alliston and the surrounding communites enjoyed a great day of entertainment at the Upper Canada Polo fields just outside of Alliston on Saturday. The rain held off and allowed everyone to enjoy 2 exciting polo matches, and lots of other entertainment including, singers, dancers and a precision riding team. A big thanks to all the volunteers who helped plan and run the event. As soon as we have all the financial details finalized we will announce the amount of money raised for the Stevenson Memorial Hospital Foundation. Watch this page for more details and a link to photographs of the event. The Rotary Club of Alliston is holding its 4th annual Gala Auction and Dinner on Saturday November 8, 2008 at the Woodington Lakes Golf and Country Club. Rotary's Humanity in Motiontelevision, radio, print, Internet, and billboard public service announcements (PSAs) focus on Rotary volunteer efforts that address critical humanitarian issues. Whether funding scholarships, creating neighborhood centers, or ridding the world of a terrible disease, Rotary club members believe anything is possible. On Saturday November 27, 2010 the streets of Alliston will once again be lit up with our 4th annual Santa Claus Parade. The parade will begin at 6:00 pm. This is an excellent opportunity for your business, organization, church group, or friends and family to showcase your creativity as you prepare for the Christmas season, not to mention, you will be showcasing your float in front of thousands of people. Parade entries will also be judged with winners receiving a prize including recognition in the local media. We hope you and your group are as excited and enthusiastic as we are. It is time to brainstorm and get your float ideas down on paper. 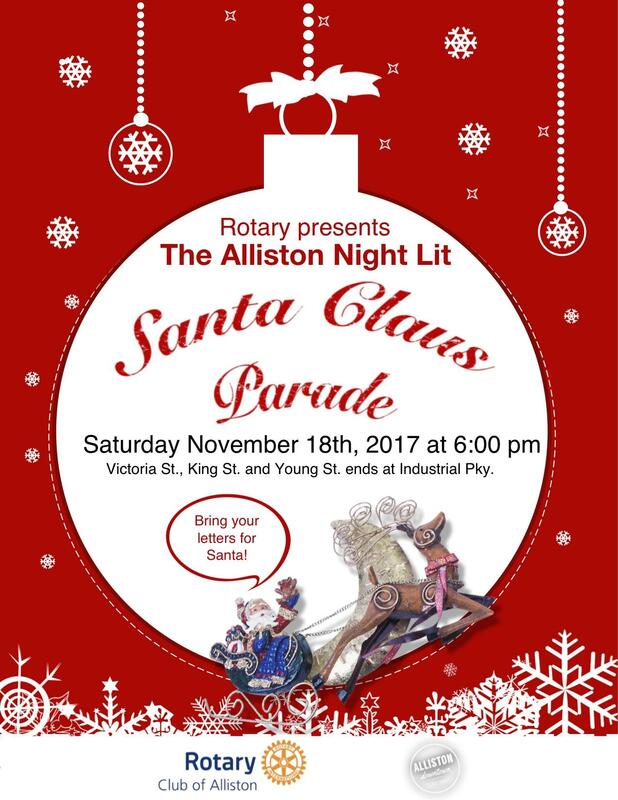 Come and be part of the celebration and the kickoff to the Christmas season with Alliston's Night-lit Santa Claus Parade. In July 2008, Rotary International will implement a more comprehensive registration and login process for Member Access and other password-protected online services. The new system will improve security and provide self-service features.